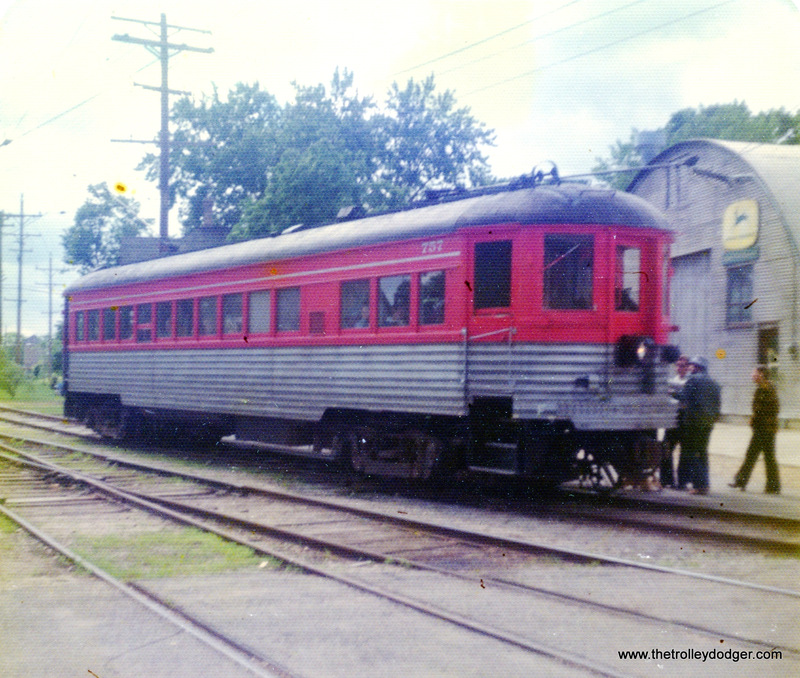 Don’s Rail Photos: “717 was built by Brill Co in 1925. 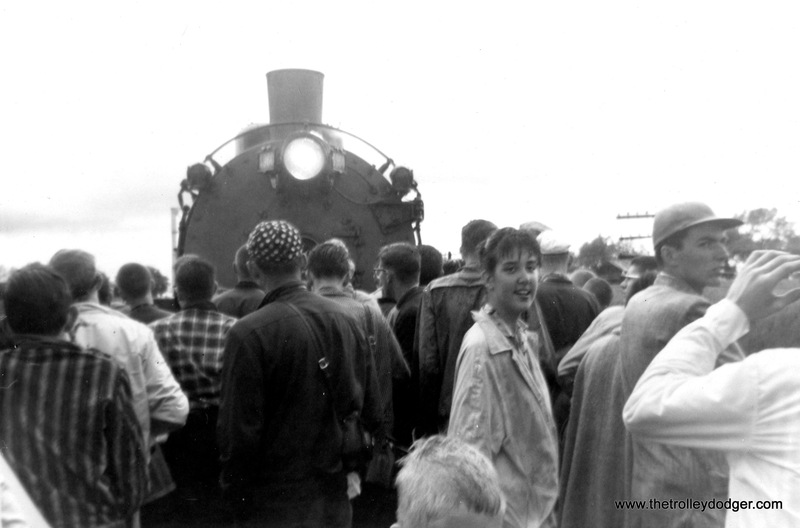 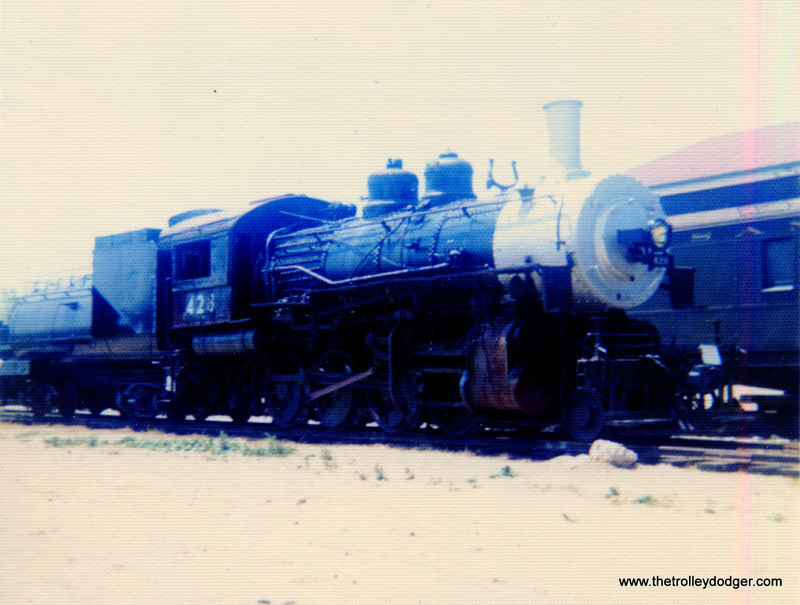 It was rebuilt in 1939 and rebuilt in 1951 as 5167. 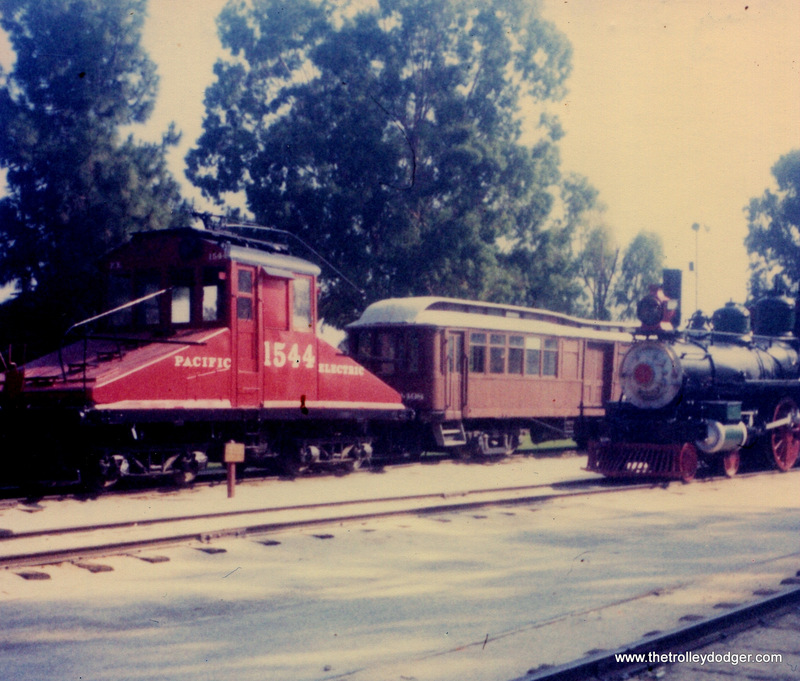 It became LAMTA 1815 in 1958, It was retired and restored as717 at OERM in March 1960.” Here, we see it at Orange Empire on May 31, 1974. 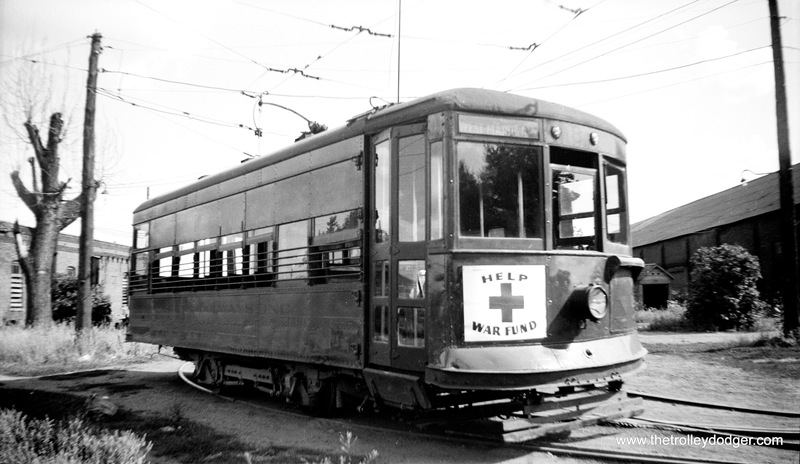 Was it ever used in service with this color scheme? 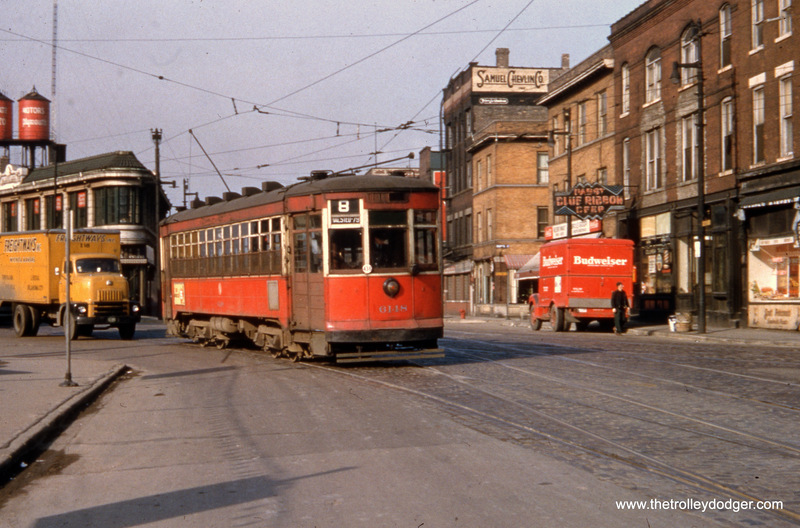 I’m wondering if the streetcar at right is Key System 987. 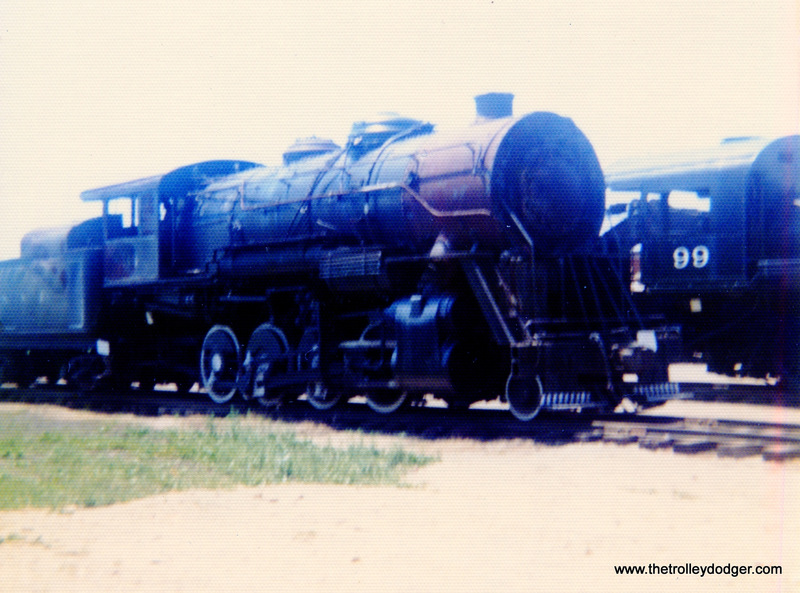 The steam loco is Western Pacific 334, a 2-8-2 built in 1929 by American Locomotive. 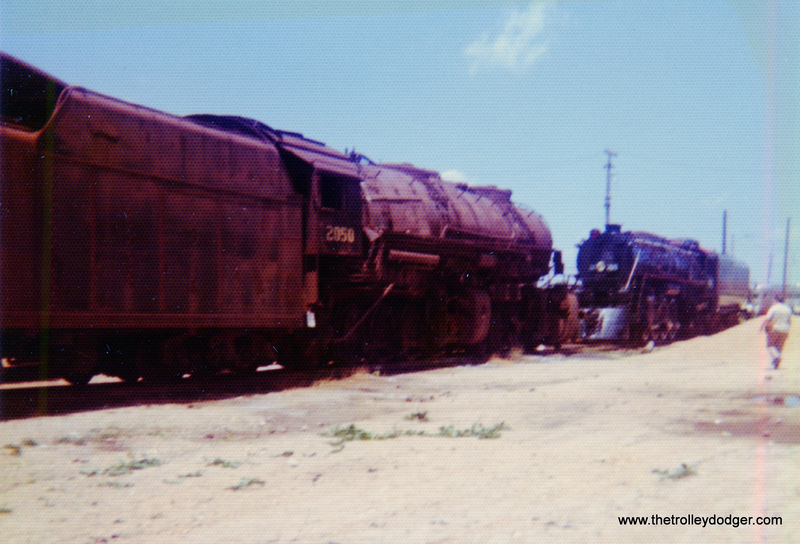 We see both at the Western Railway Museum on May 26, 1972. 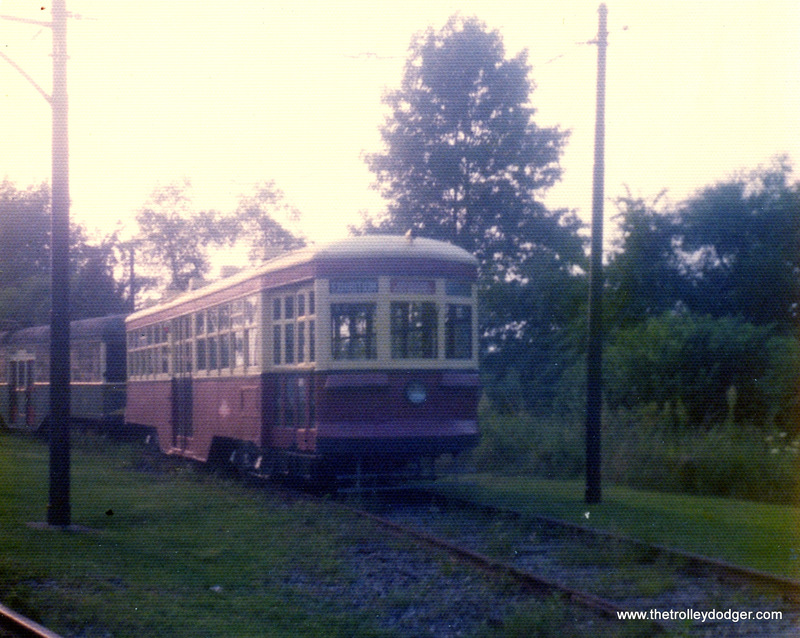 A Toronto Peter Witt at Trolleyville USA, Olmstead Falls, Ohio, on August 23, 1975. 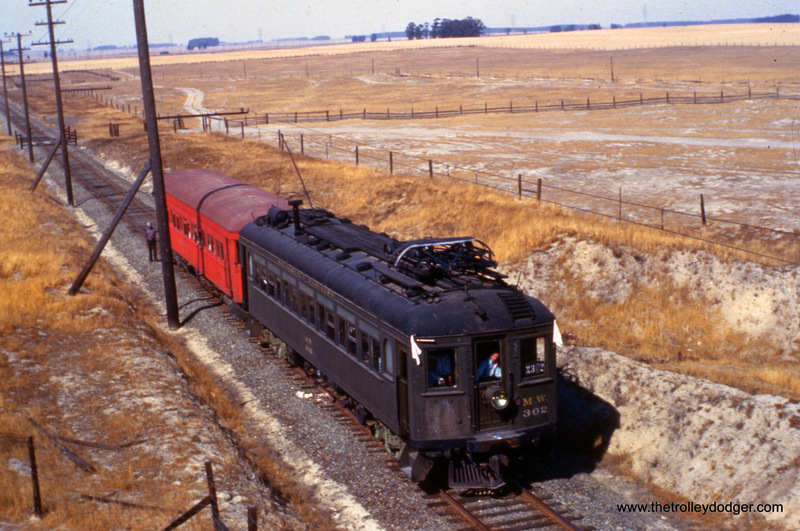 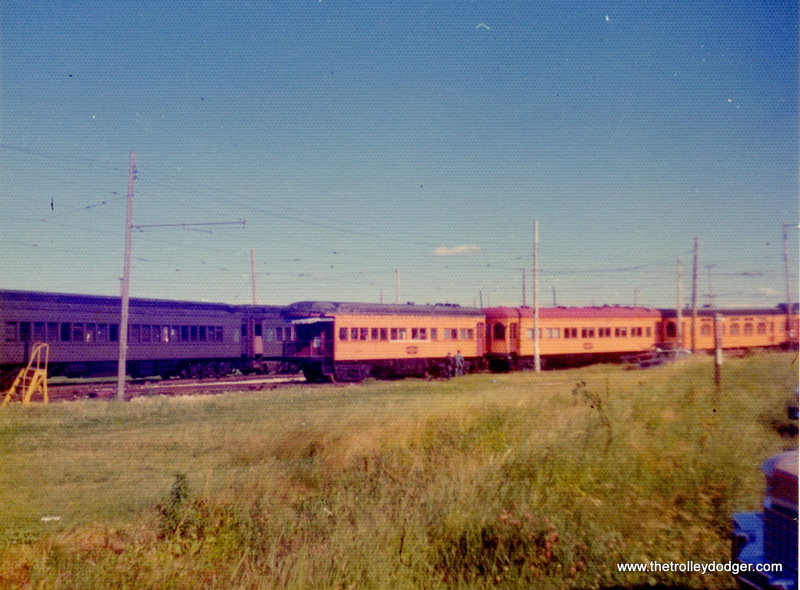 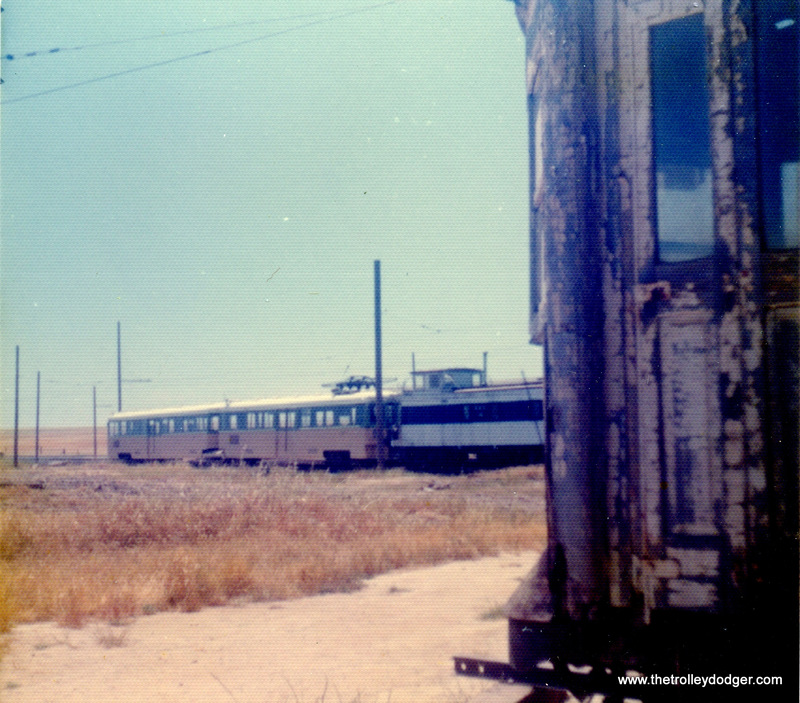 I assume this is probably an ex-PE car at the Orange Empire Railway Museum on May 31, 1974. 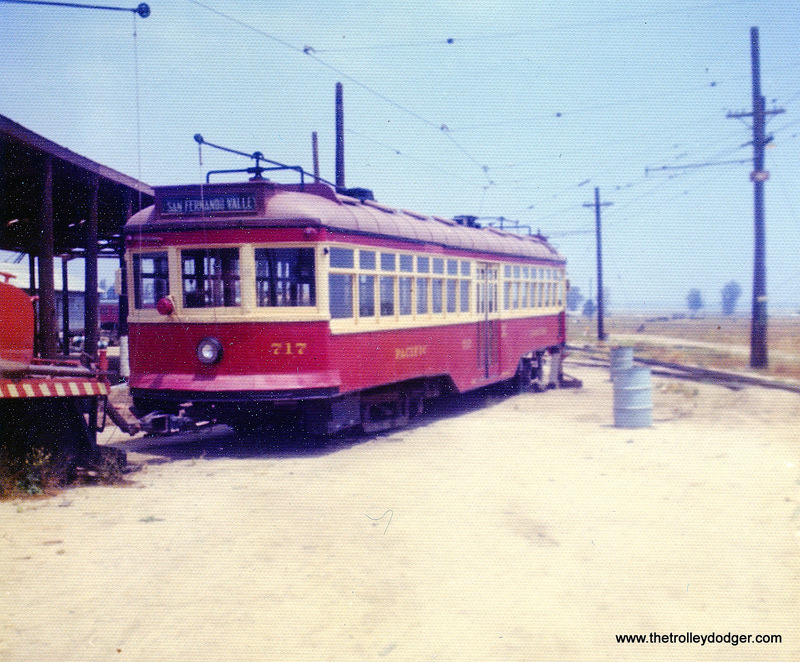 A Los Angeles streetcar at OERM, Perris, California on July 6, 1976. 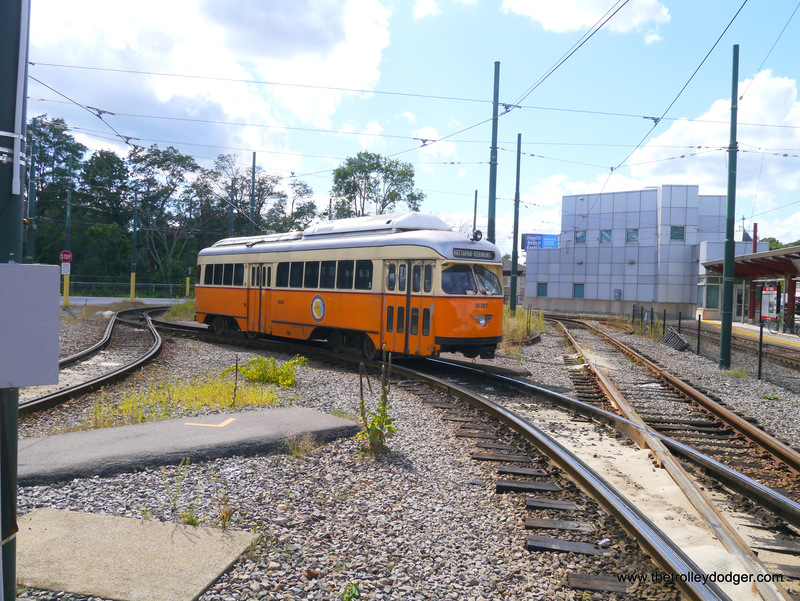 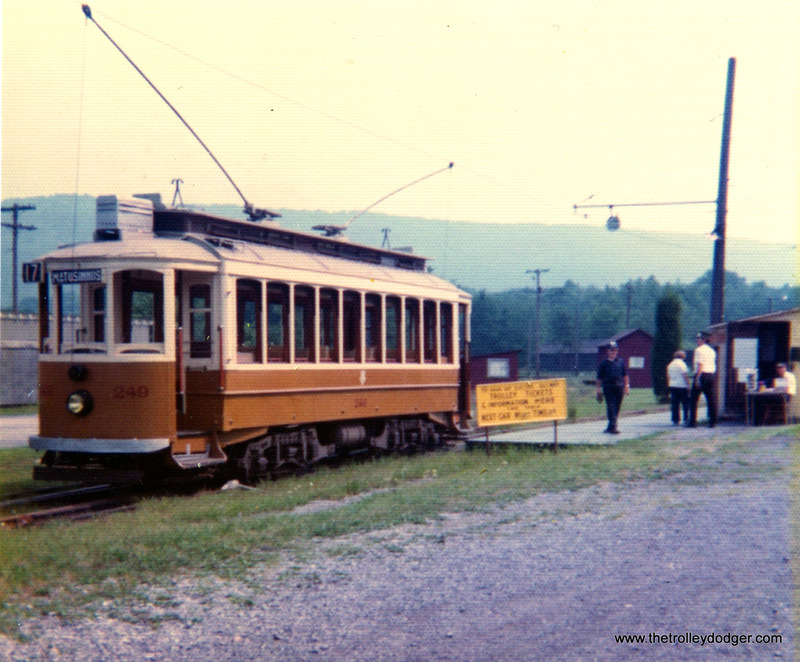 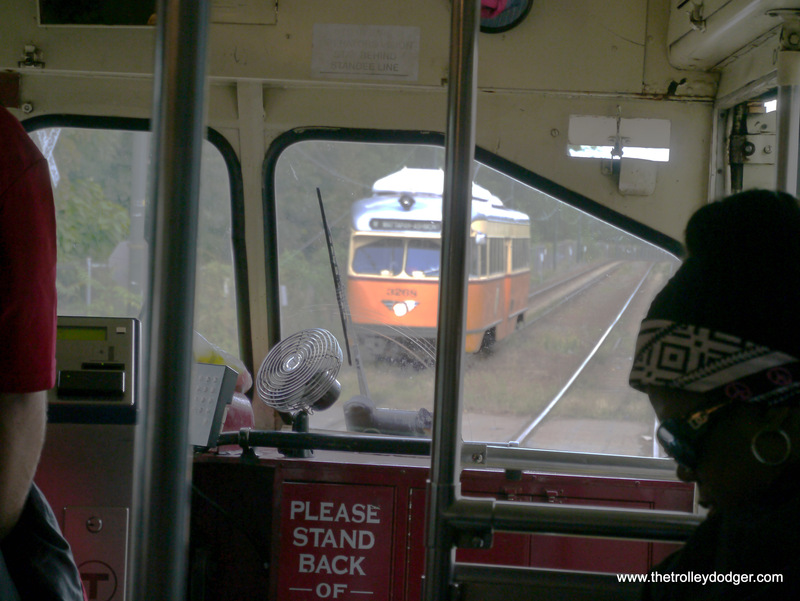 Here, we see Brooklyn car 4573 at the Branford Trolley Museum. 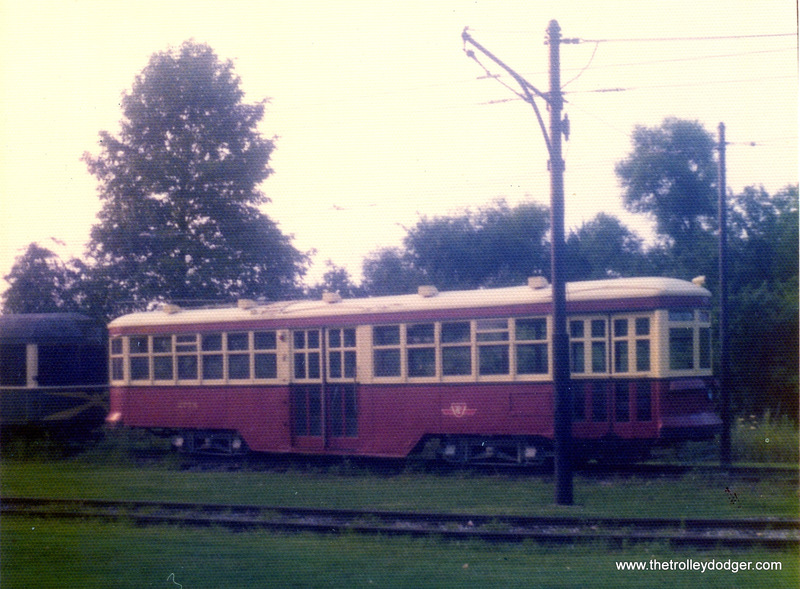 It was built by the Laconia Car Company in 1906 and was acquired by the museum on 1947. 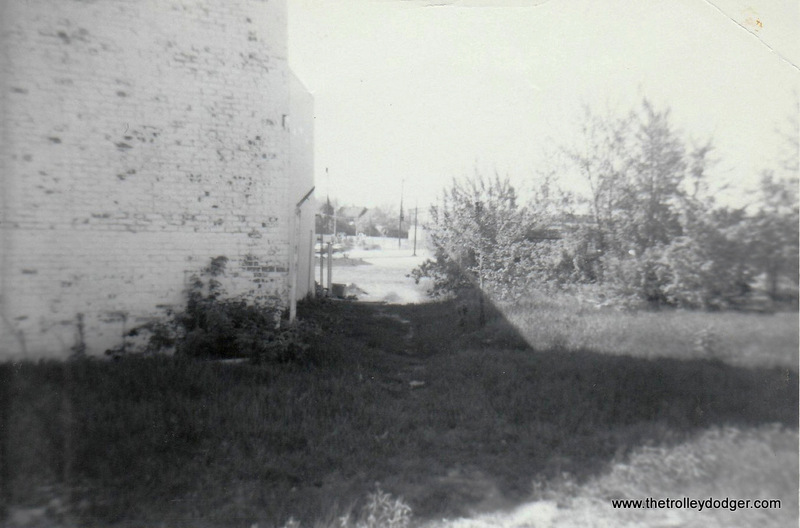 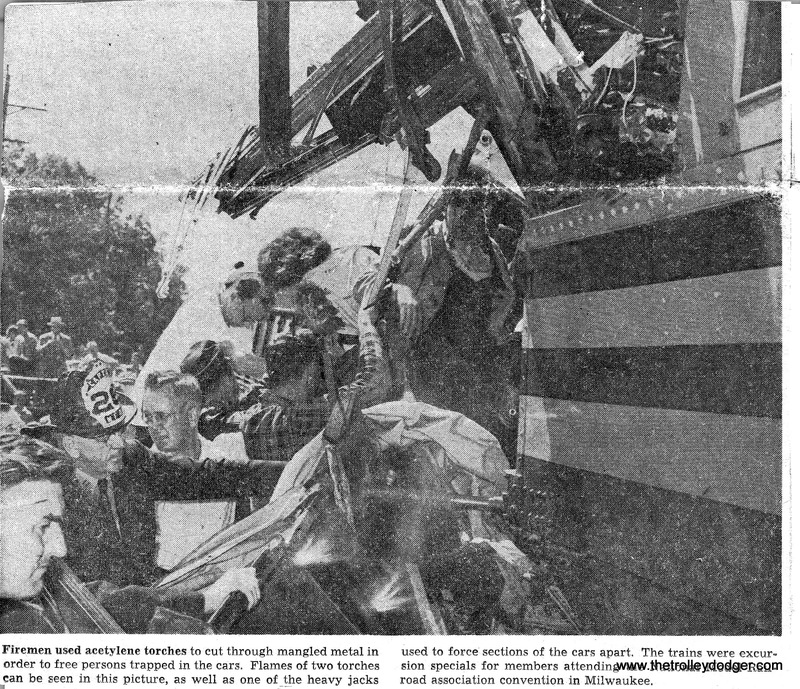 Here is how it looked on August 31, 1976. 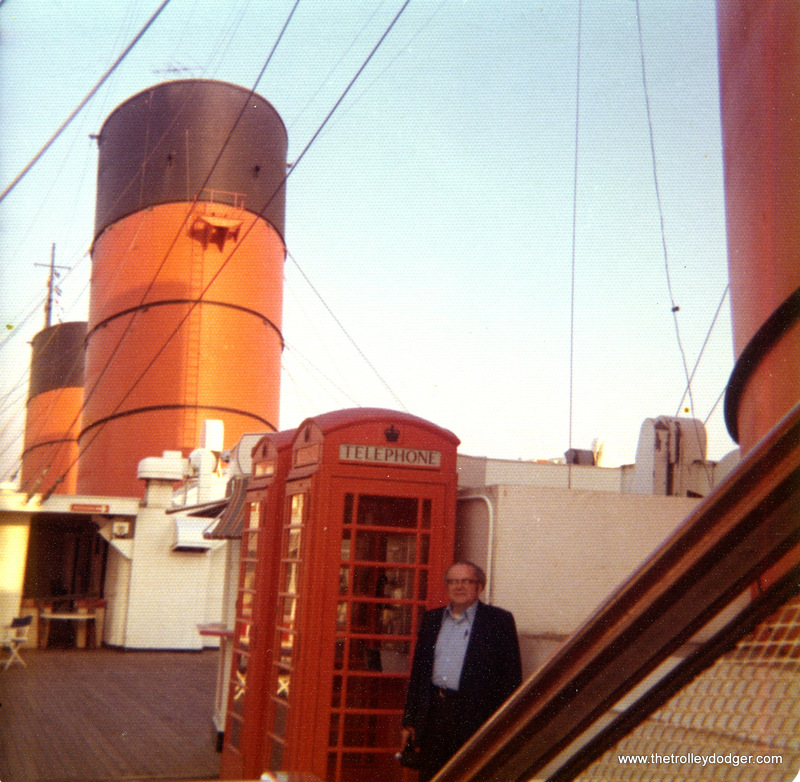 Marvin C. Kruse on the Queen Mary in Long Beach, California on May 24, 1974. 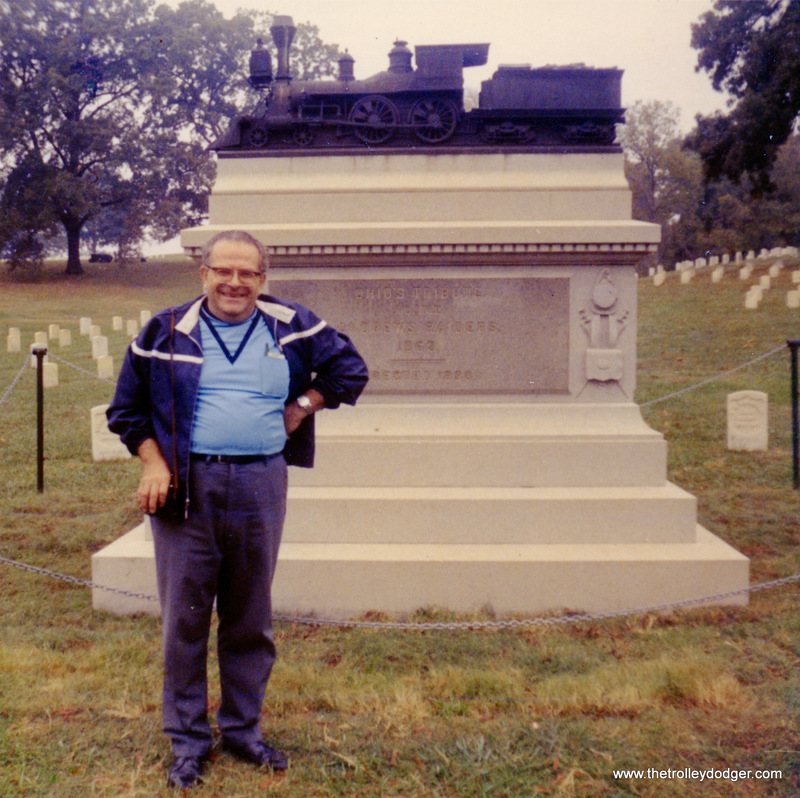 Marvin C. Kruse at the Andrews Raiders Memorial in the Chattanooga Military Cemetery on October 23, 1907. 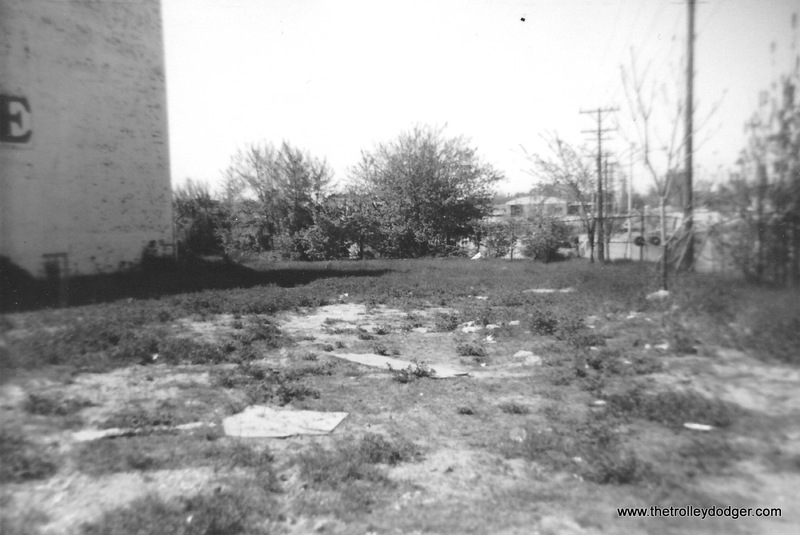 According to Find-a-Grave: :”Memorial erected by the State of Ohio to the Andrews Raiders. 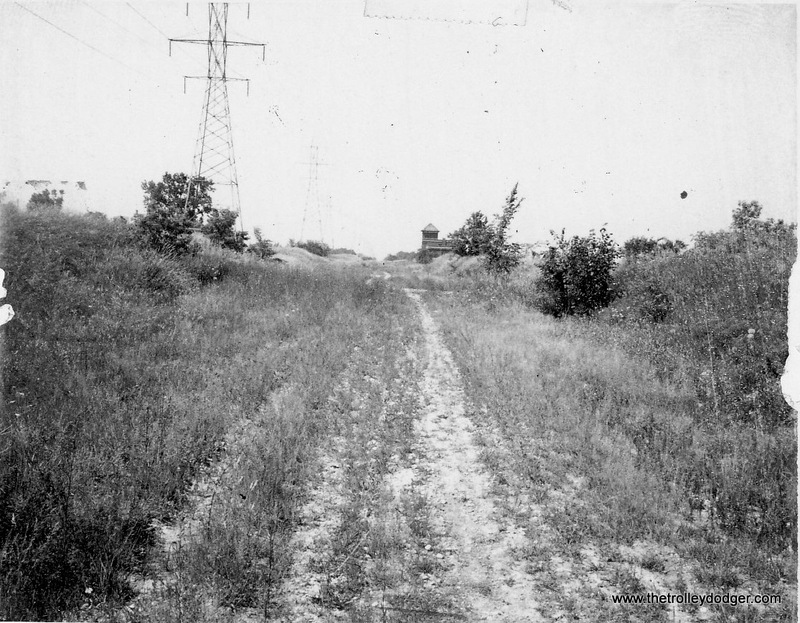 In early April, 1862, a band of Union soldiers lead by civilian James Andrews infiltrated south from the Union lines near Shelbyville, Tennessee and met at Big Shanty, Georgia (near Marietta). 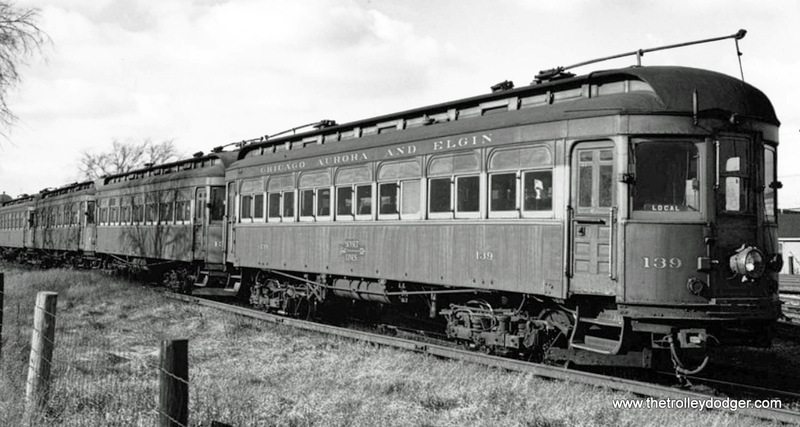 On the morning of April 12, 1862, 20 of them (2 raiders never arrived and 2 others overslept and missed the adventure) stole the passenger train “The General” during its morning breakfast stop. 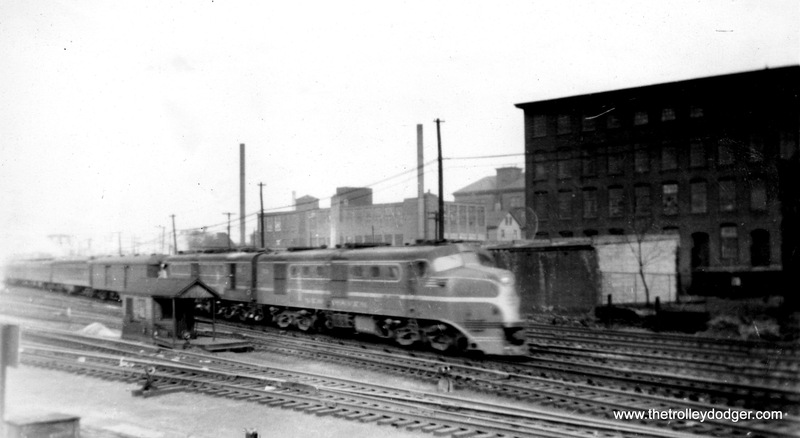 With the farms and factories of Georgia supplying the Confederate Army fighting further west, the Raiders’ mission was to burn the railroad bridges between Atlanta and Chattanooga, thus isolating the Confederate Armies from their supply sources and enabling the Union Army to seize Chattanooga. 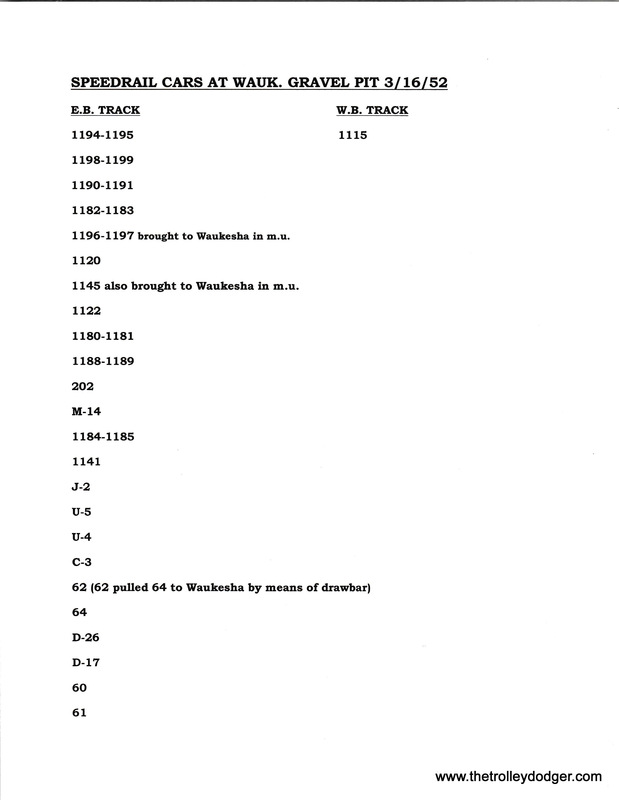 Due primarily to the persistency of William Fuller, conductor of the stolen train, and, secondarily to the rainy weather and unlucky miscoordination with the Union Army to the west, the Raiders failed. 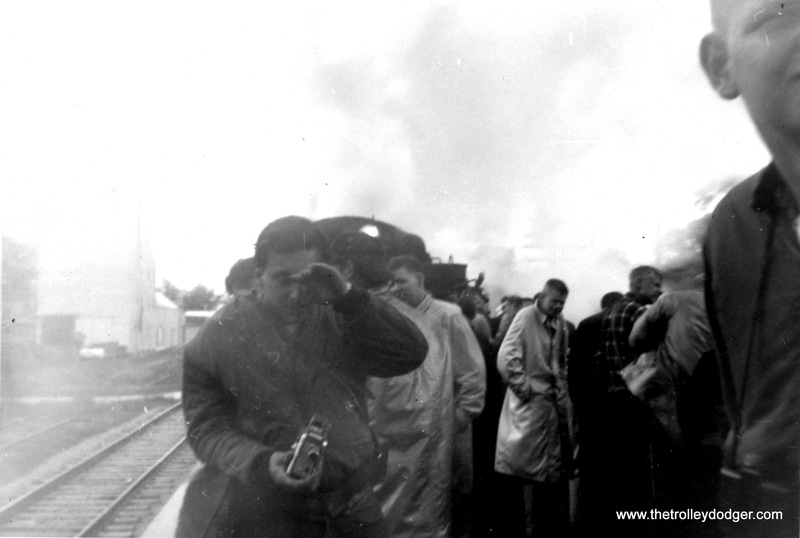 All 22 at Big Shanty that morning were captured. 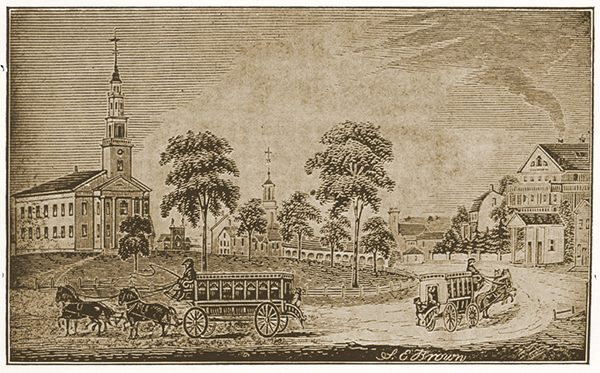 Eight, including James Andrews, were tried and hanged by the Confederate Army in Atlanta. 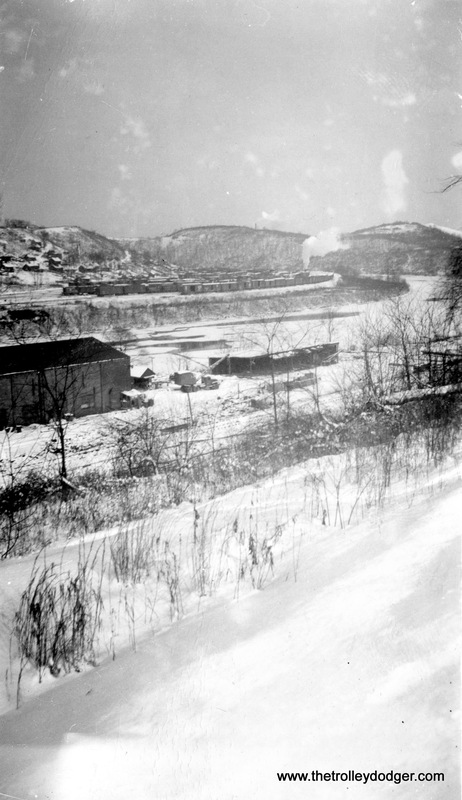 In 1866, after the war, they were reburied in a semi-circle at the Chattanooga National Cemetery. 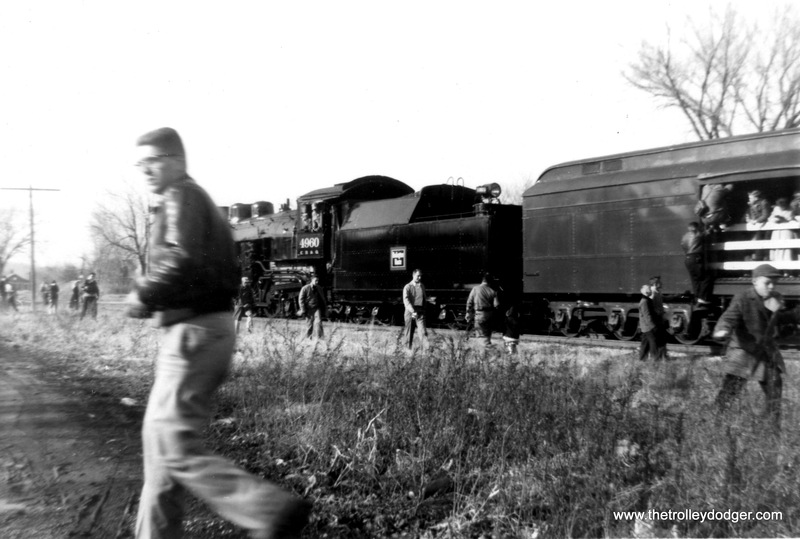 On the imposing granite monument, erected in 1891, are the names of 22 of the raiders. 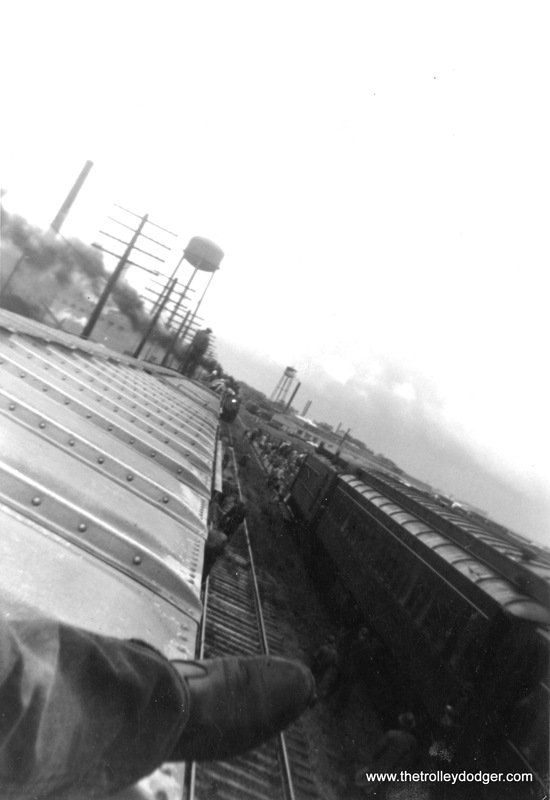 The memorial is topped by a bronze likeness of the “General”.” This story inspired the classic 1927 Buster Keaton film The General. 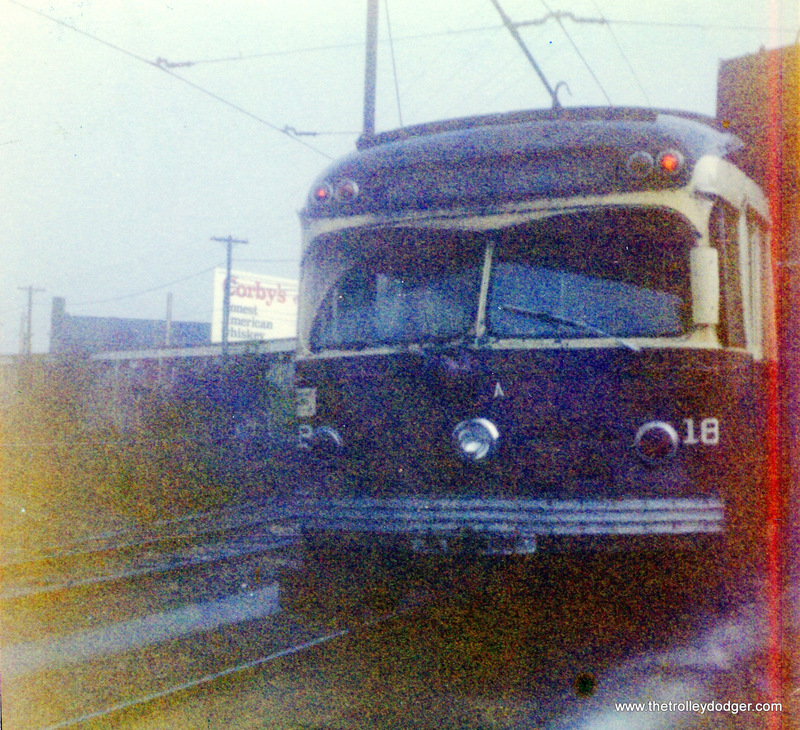 Philadelphia PCC 2278, in bicentennial garb, on Route 53, September 2, 1976. 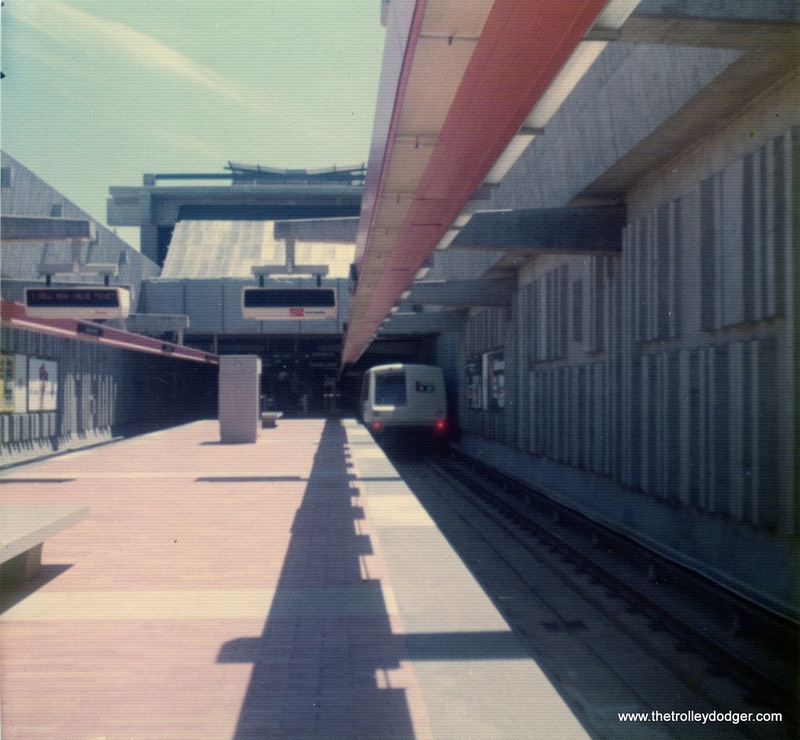 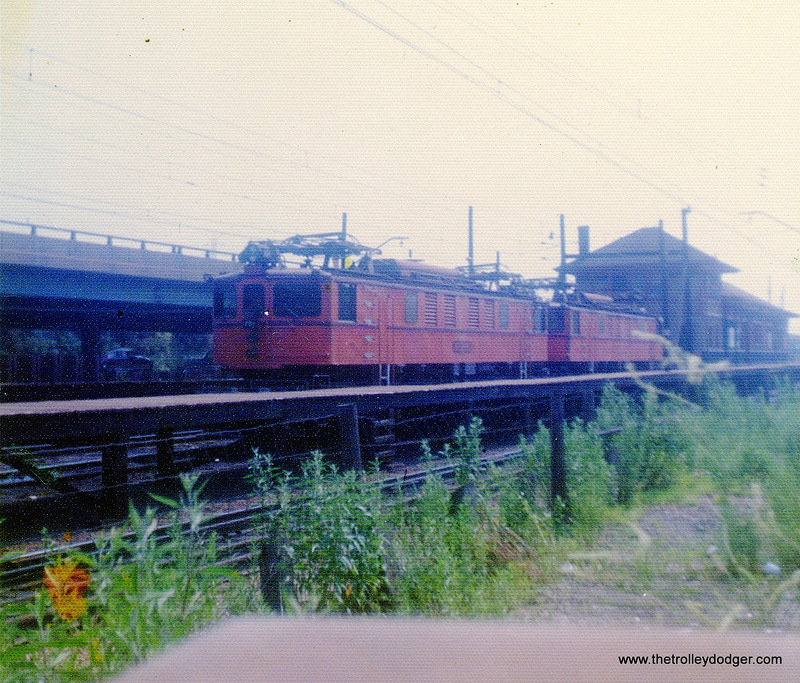 SEPTA Red Arrow cars at 69th Street Terminal on September 2, 1976. 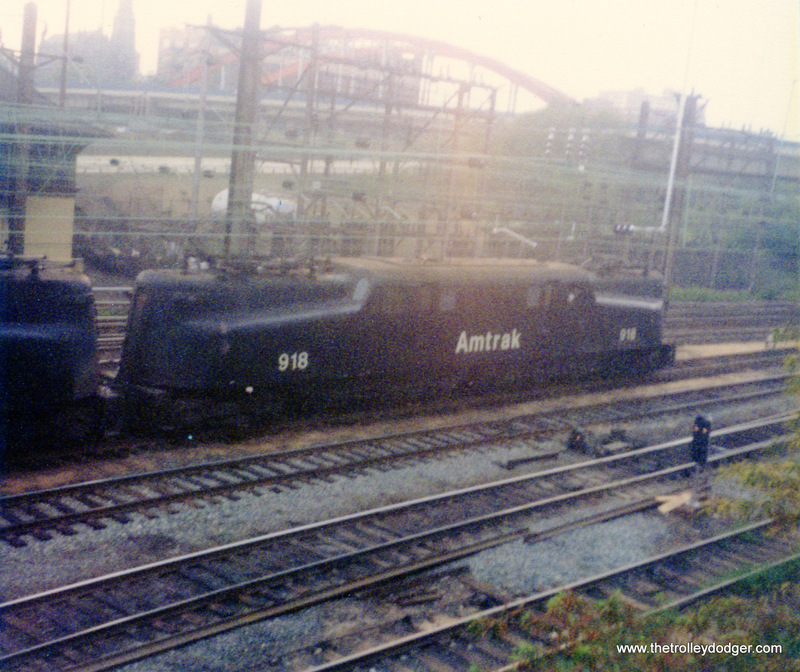 An Amtrak GG-1 in Baltimore on August 31, 1977. 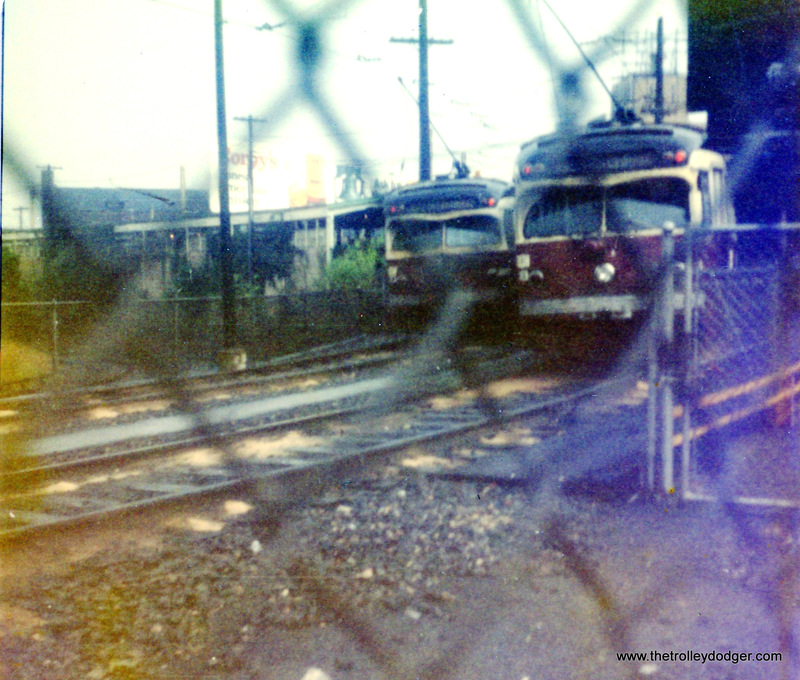 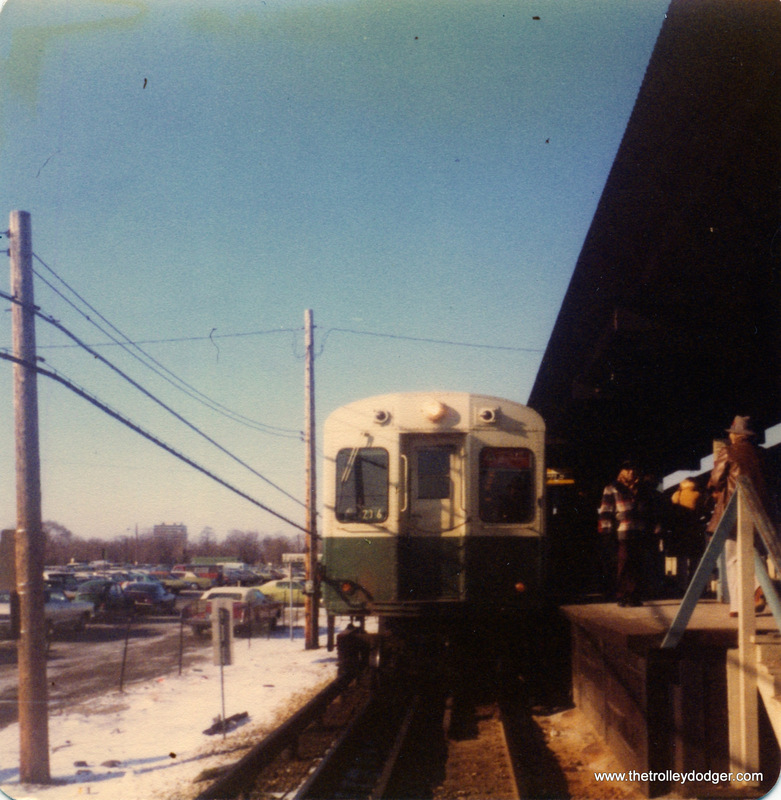 This is not a very good picture, but it does show a Liberty Liner (ex-North Shore Line Electroliner) on September 2, 1976. 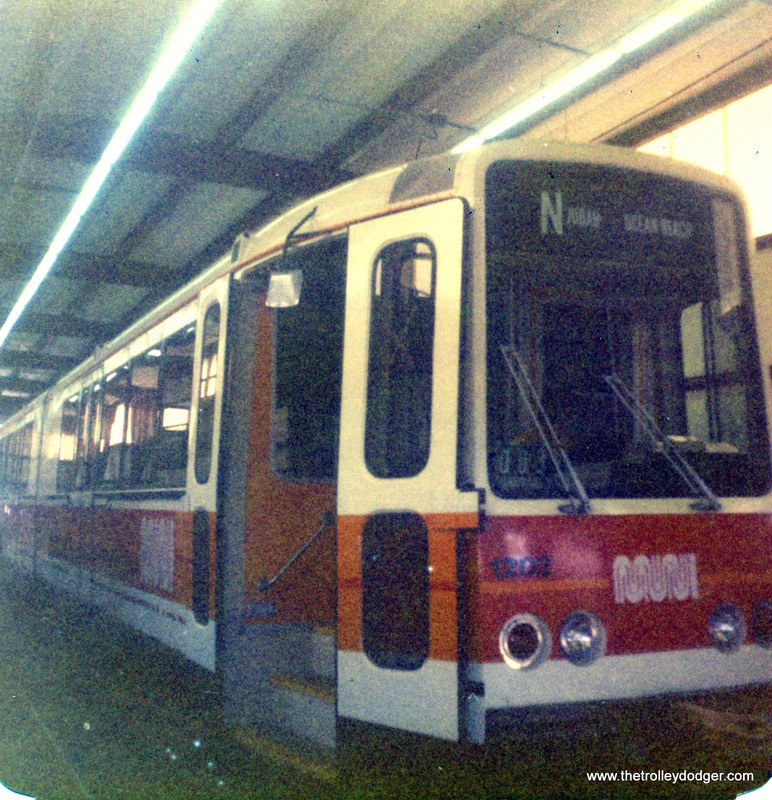 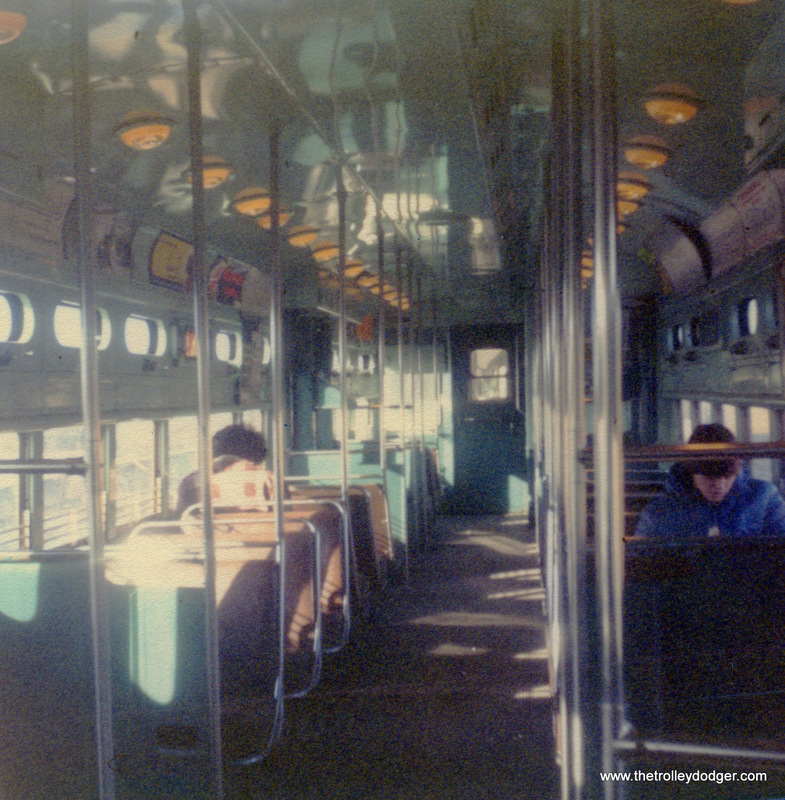 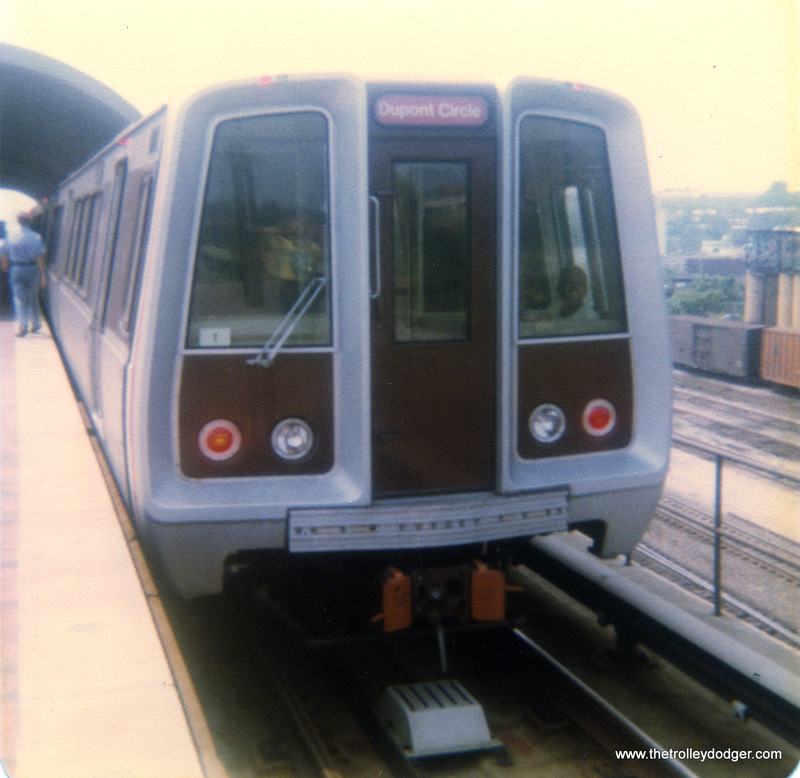 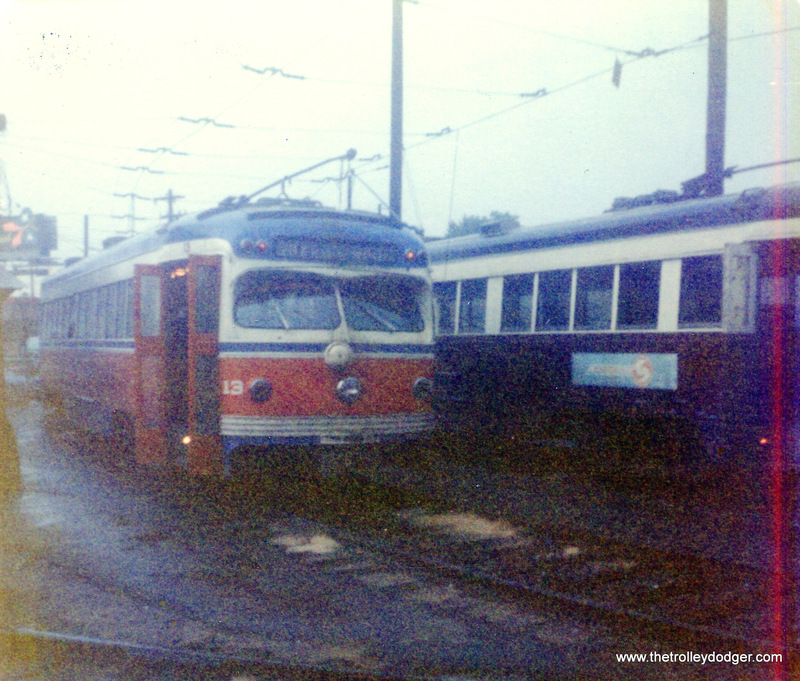 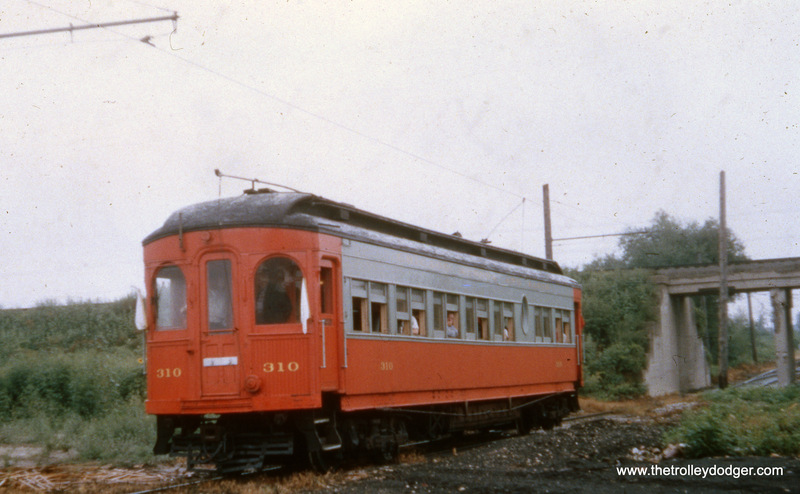 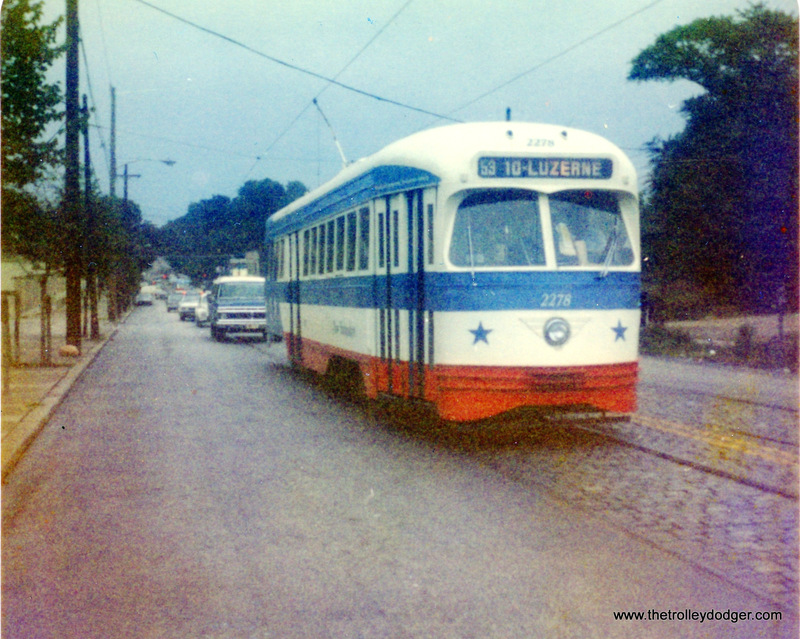 SEPTA Red Arrow car 13, built by St. Louis Car Company in 1949, as it looked on September 2, 1976. 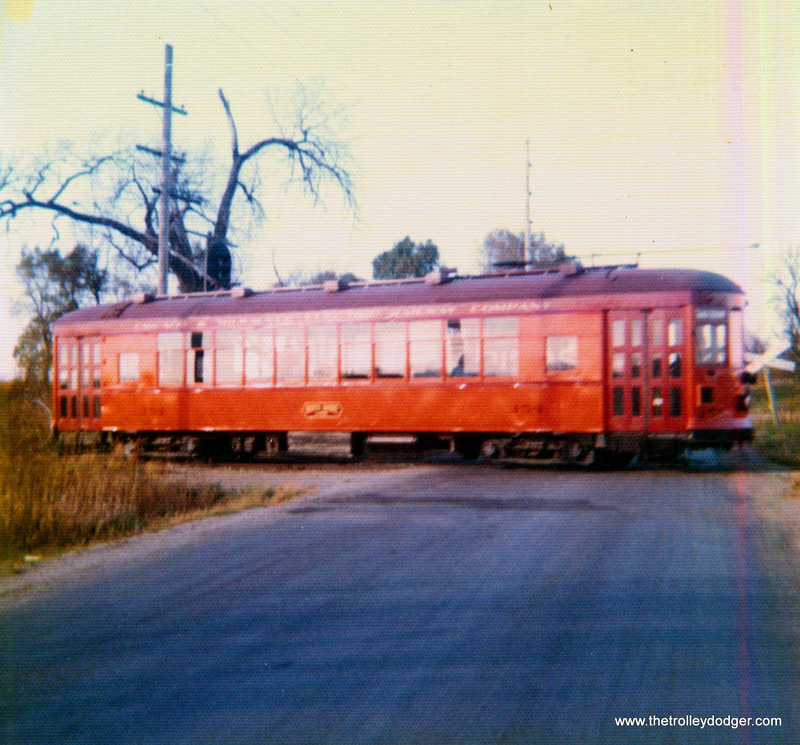 Red Arrow car 18, also built in 1949. 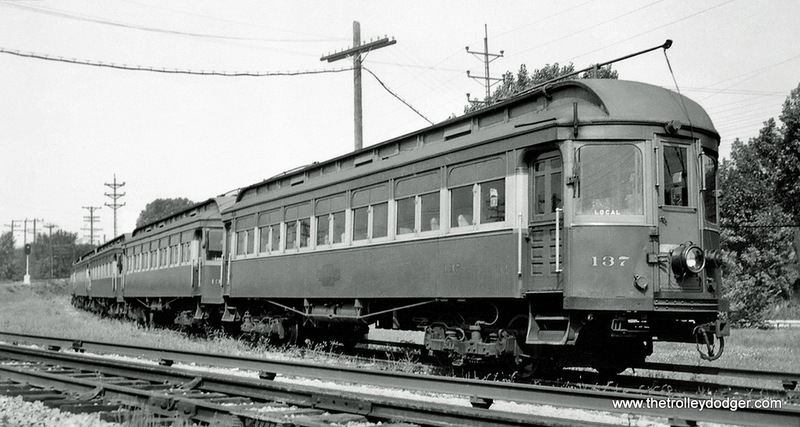 These double-ended interurban cars closely resembled PCCs but did not use PCC trucks. 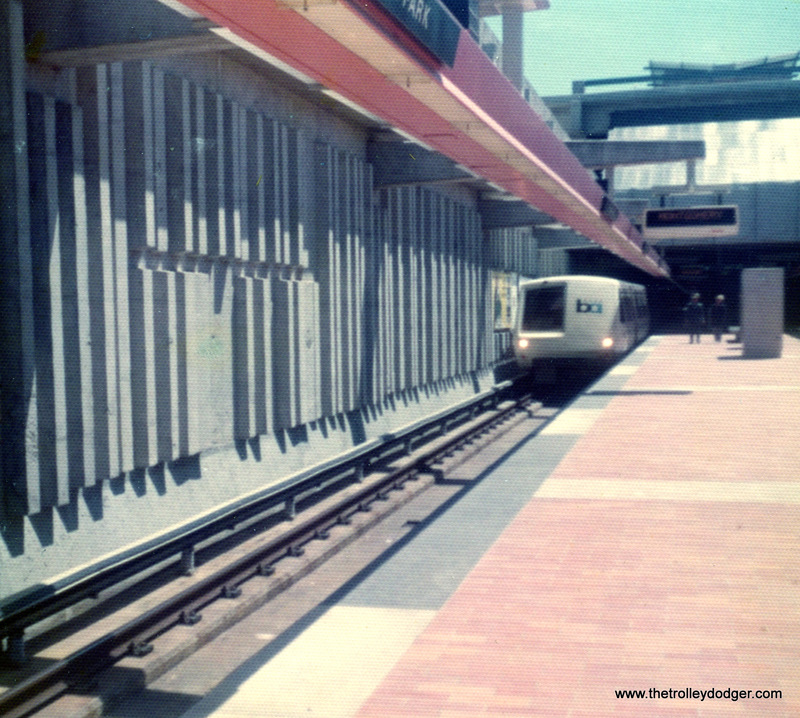 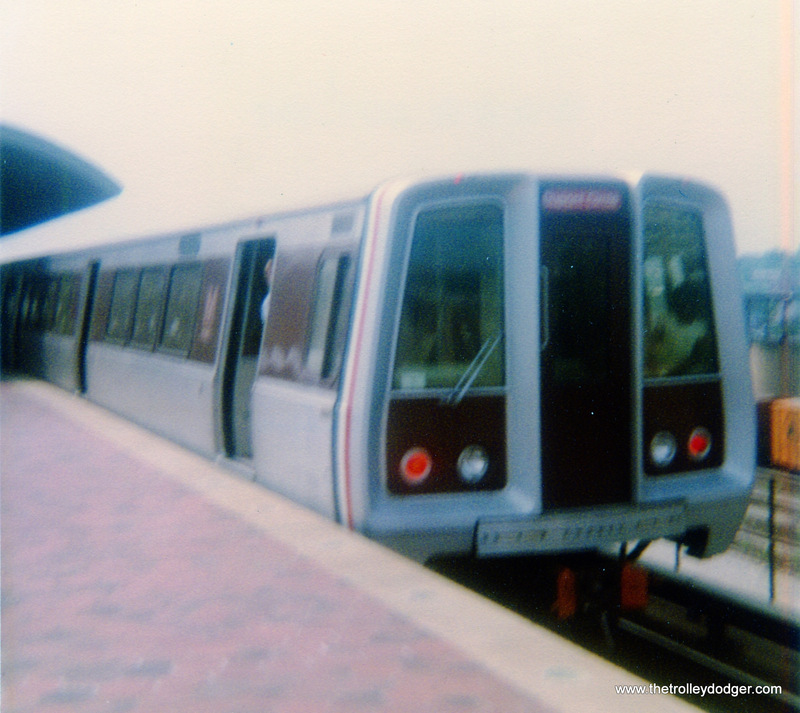 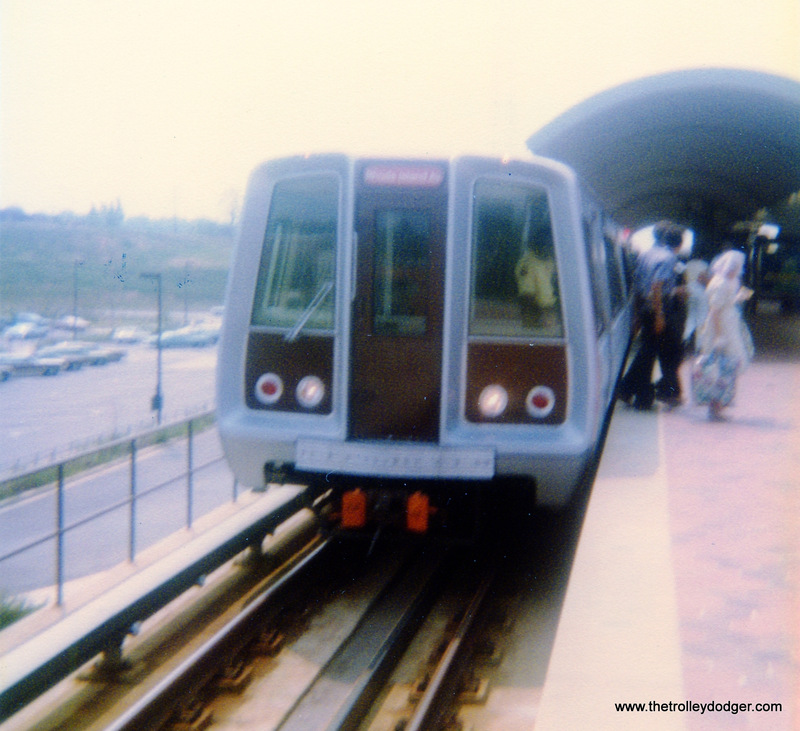 A Washington, D.C. subway car at the Rhode Island Avenue station on September 1, 1977. 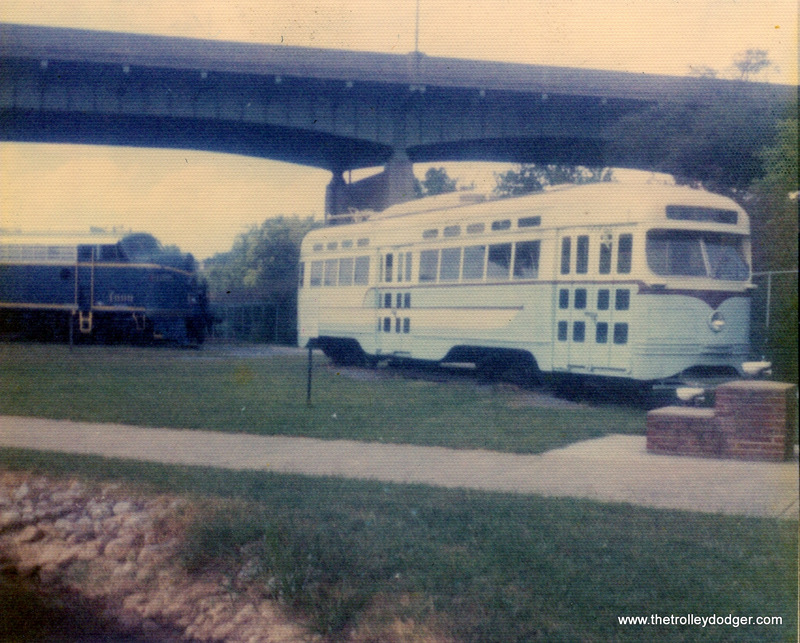 A PCC car at the Roanoke, Virginia Transportation Museum on August 27, 1975. 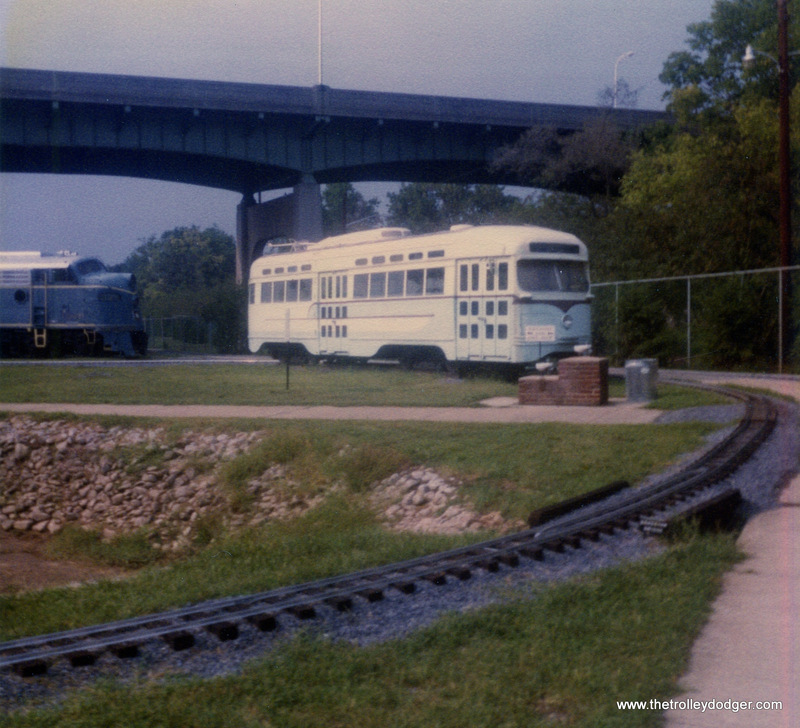 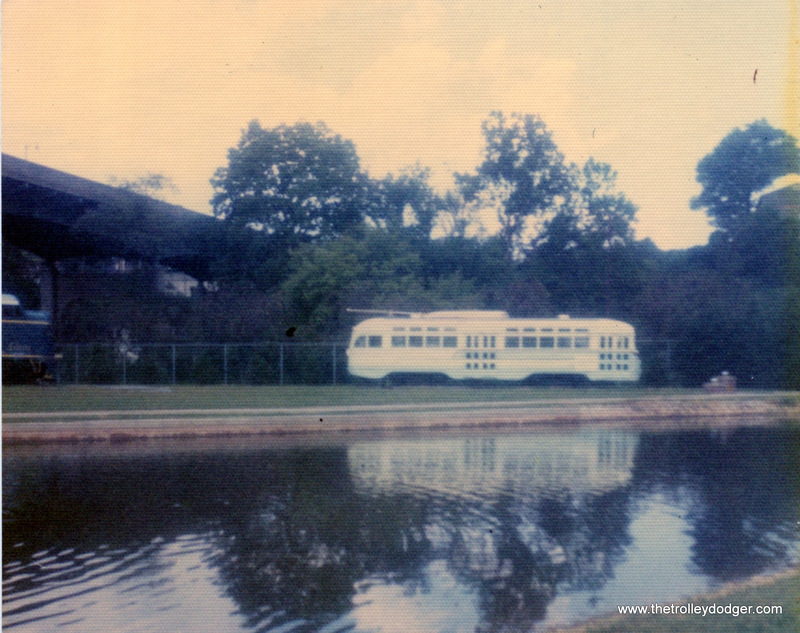 A PCC car at the Virginia Museum of Transportation in Roanoke on August 27, 1975. 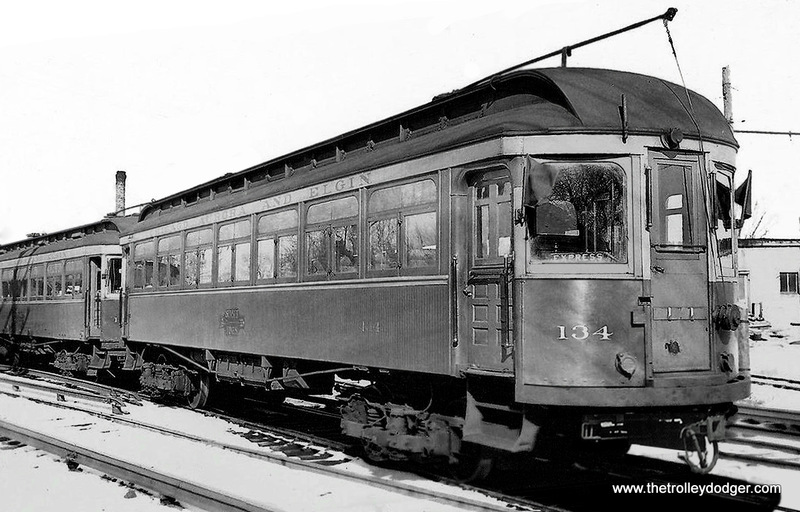 This is DC Transit 1470, built by St. Louis Car Company in 1945. 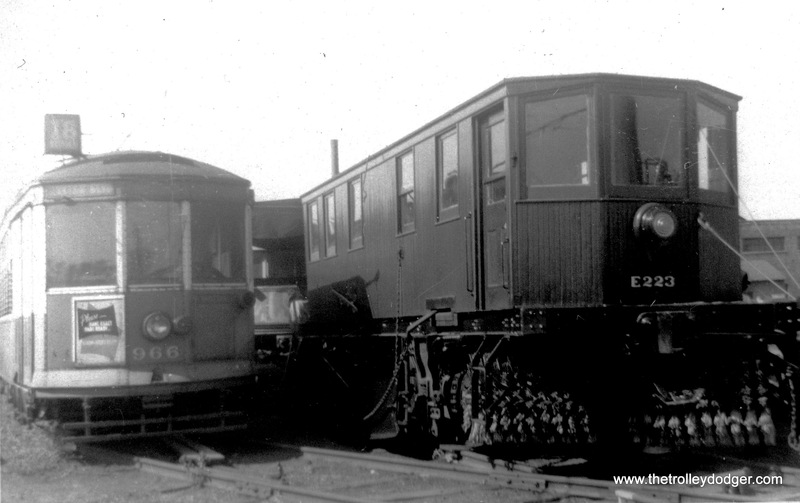 J. G. Brill built car 249 for Oporto, Portugal in 1904 and features maximum traction trucks. 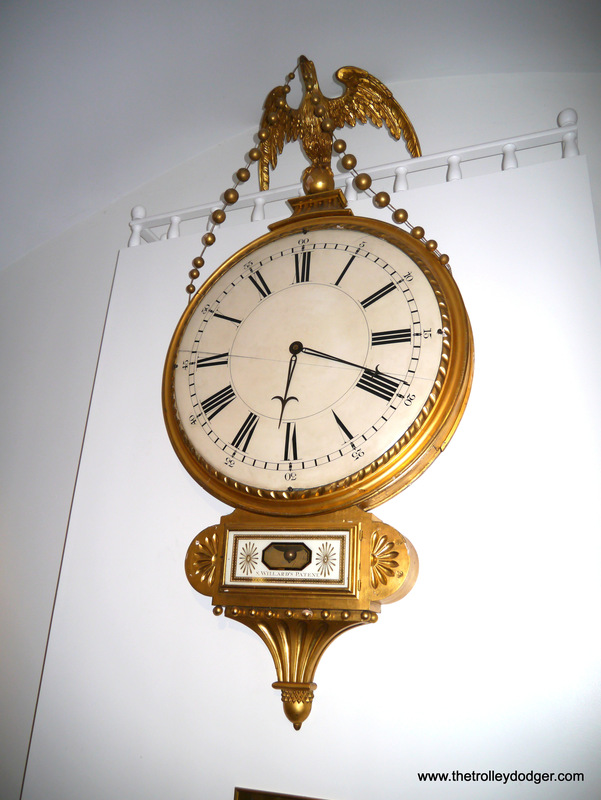 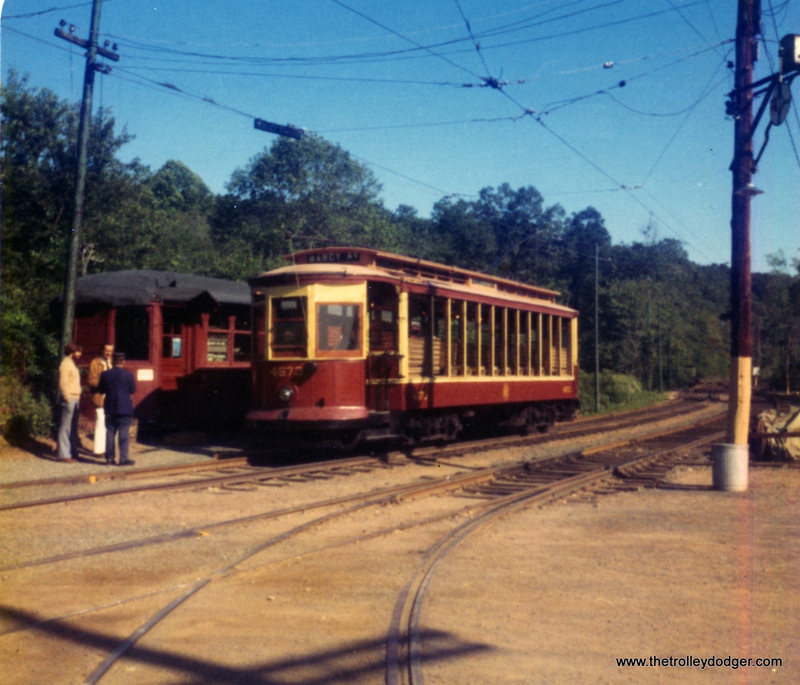 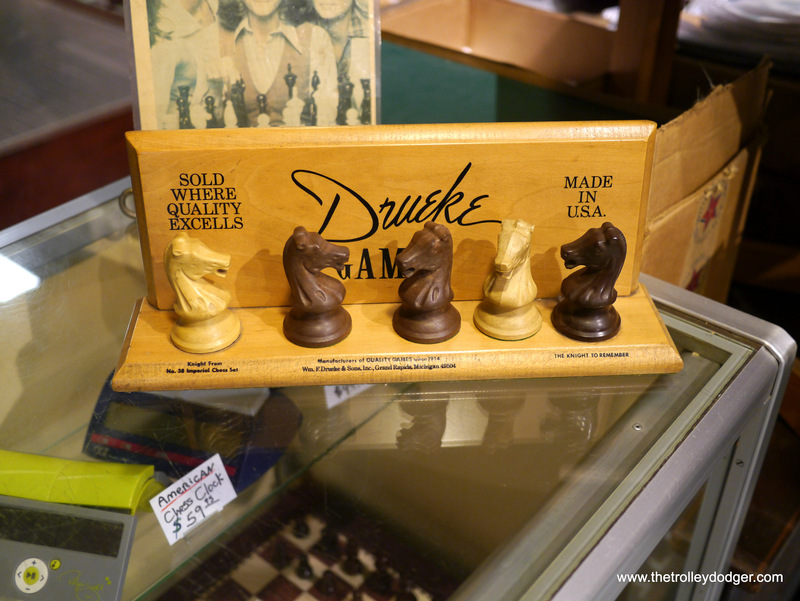 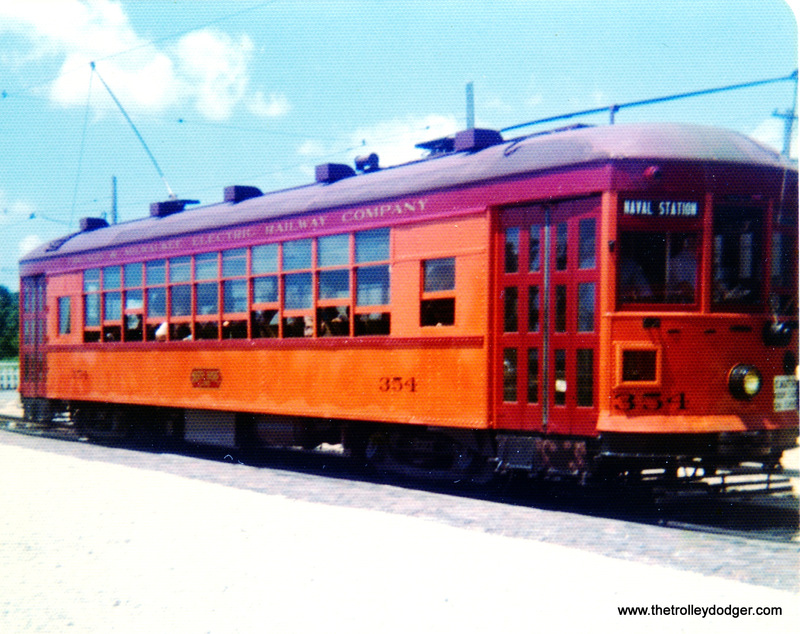 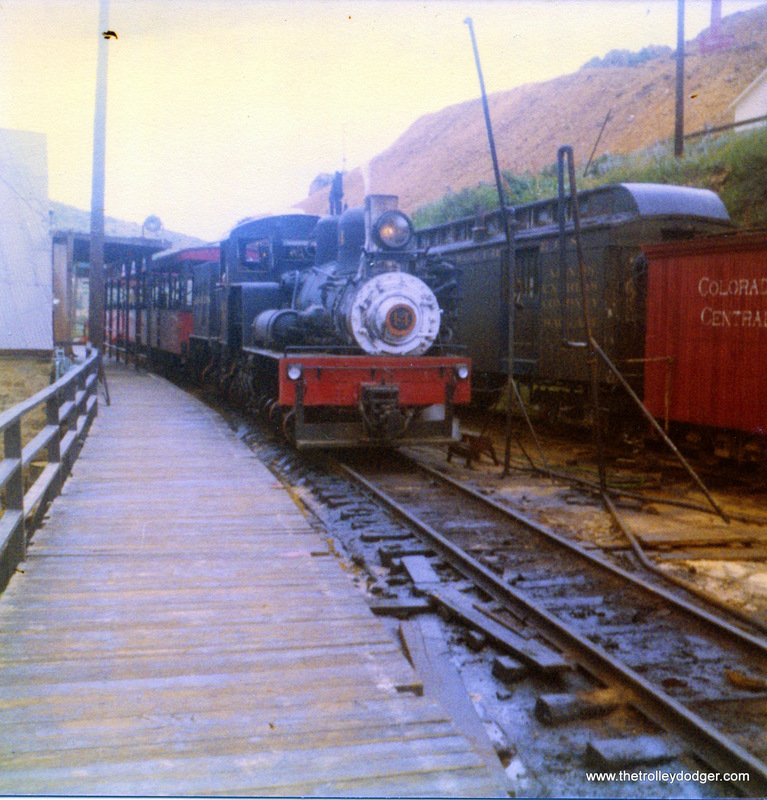 It was retired in 1972 and is shown at the Rockhill Trolley Museum on August 24, 1975. 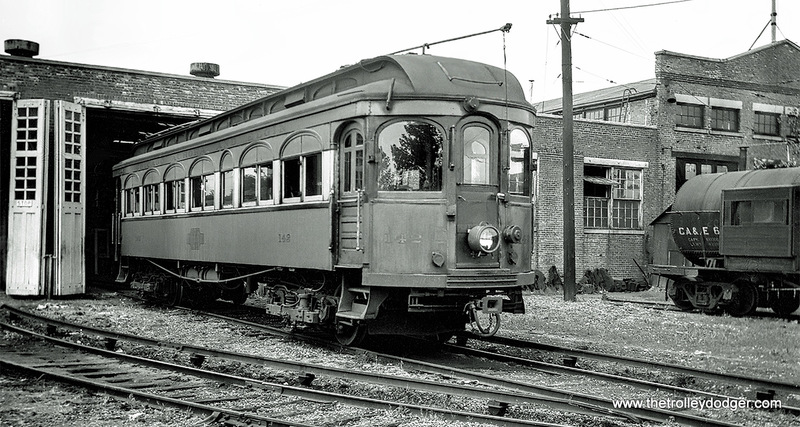 This is Sacramento Northern 62, a Birney car built in 1920 by American Car Company. 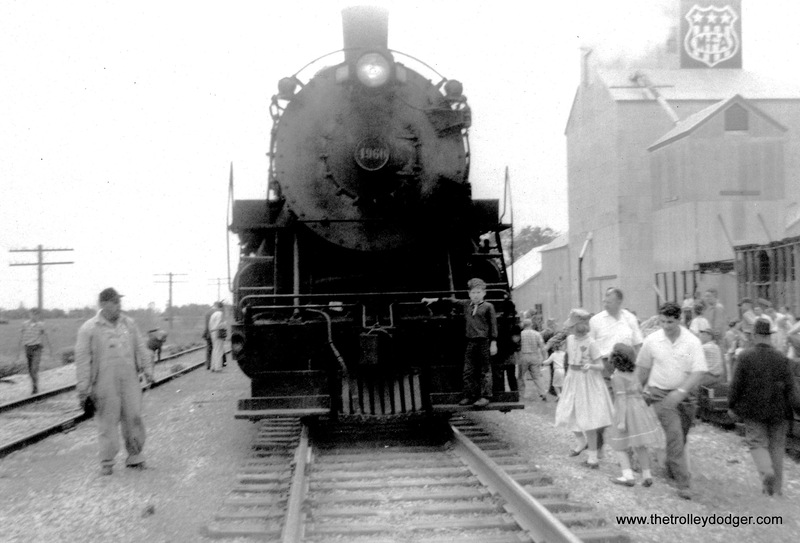 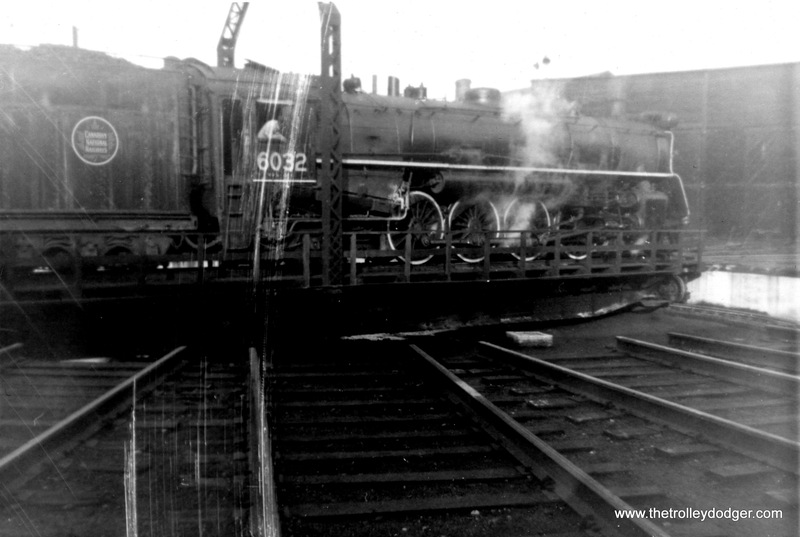 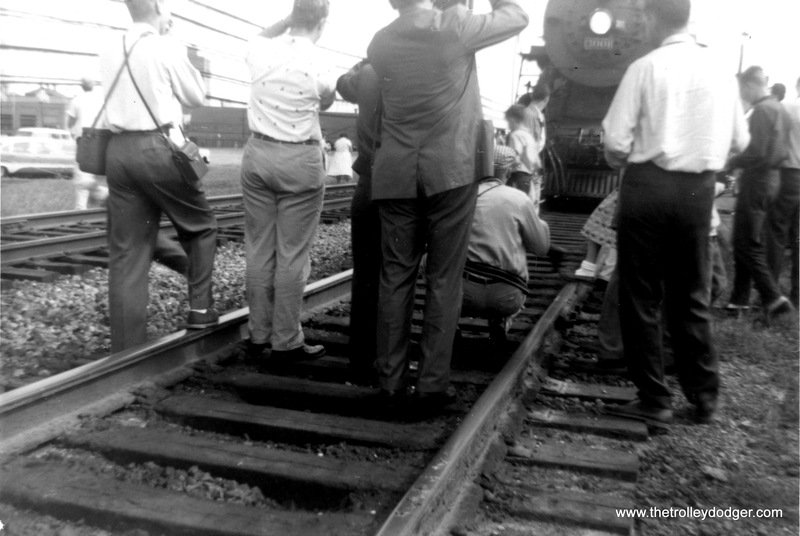 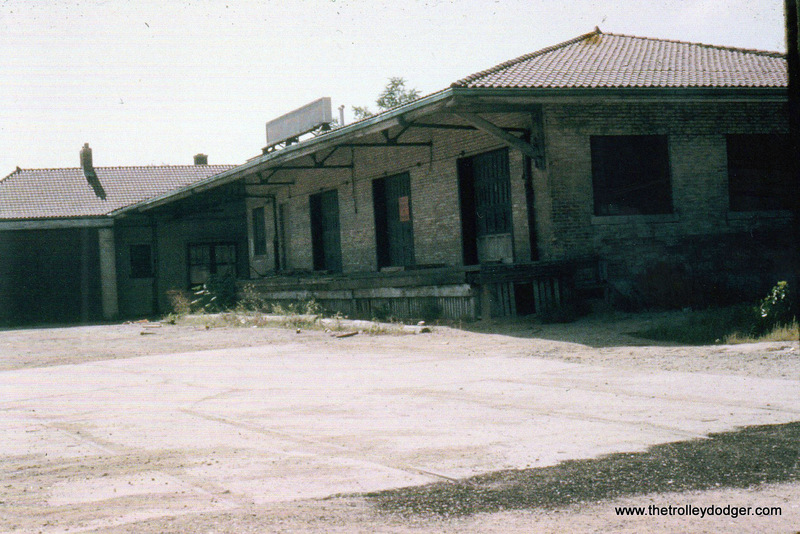 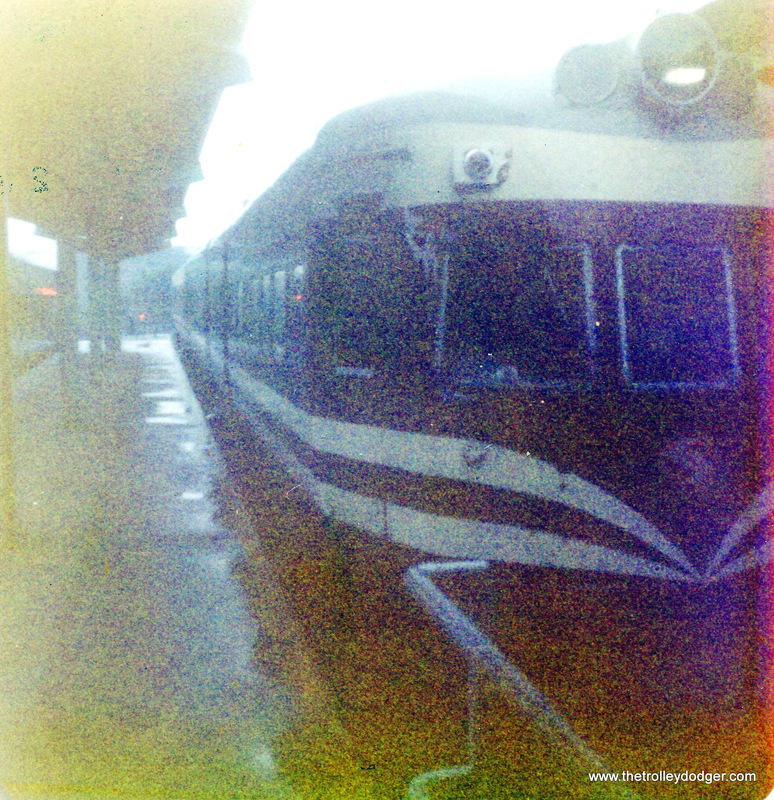 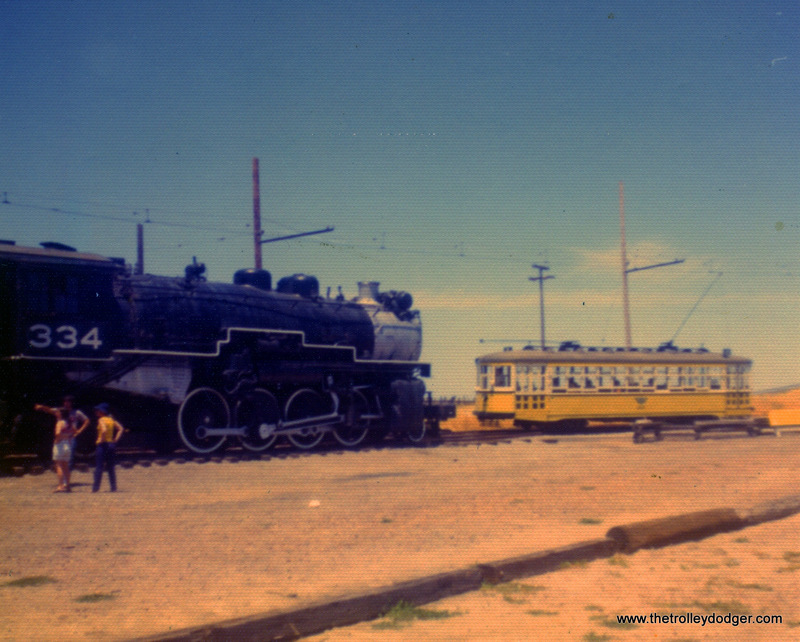 We see it here at the Western Railway Museum on May 26, 1974. 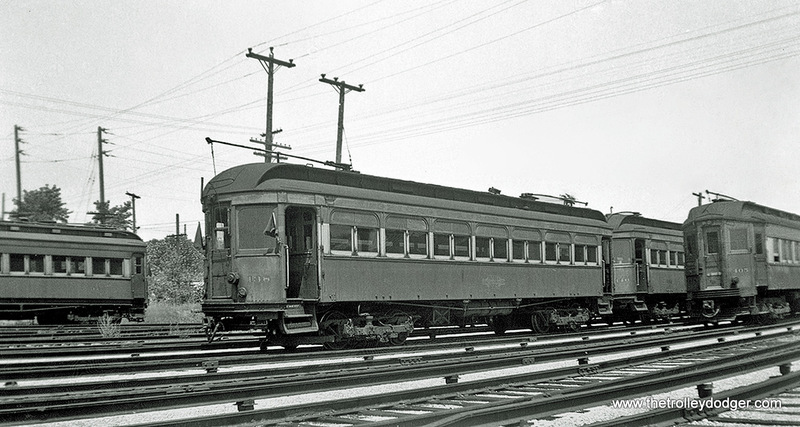 San Francisco Municipal Railway “Magic Carpet” carr 1003 was one of five experimental double-end cars built in 1939 by the St. Louis Car Company. 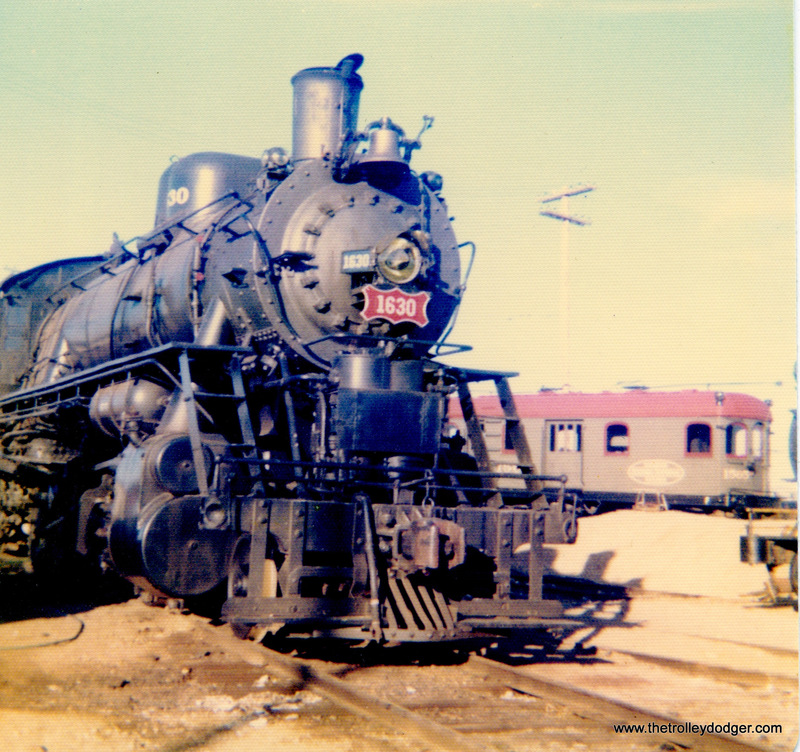 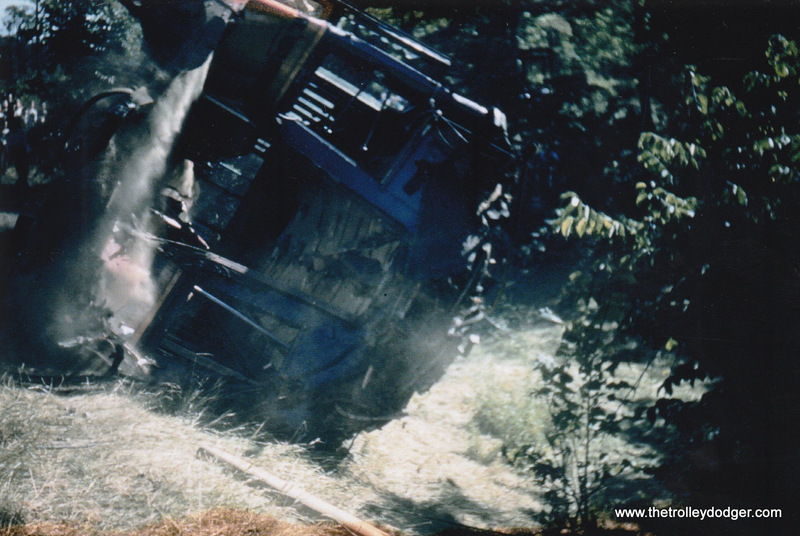 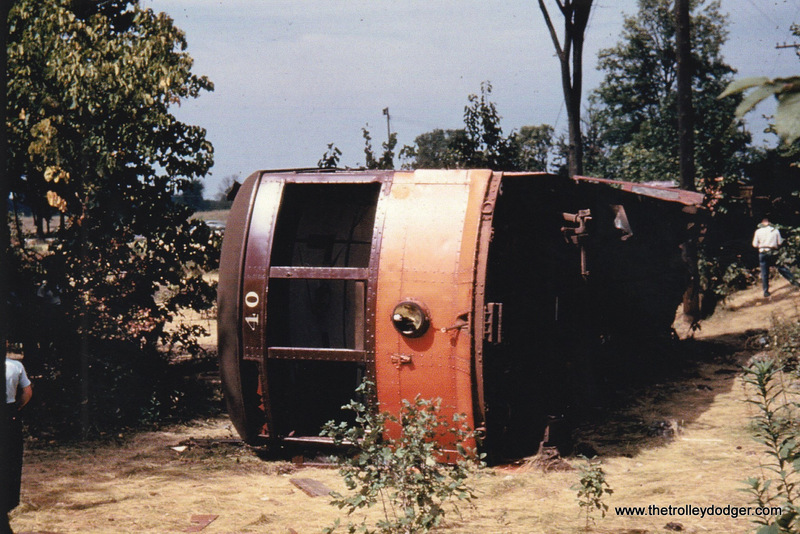 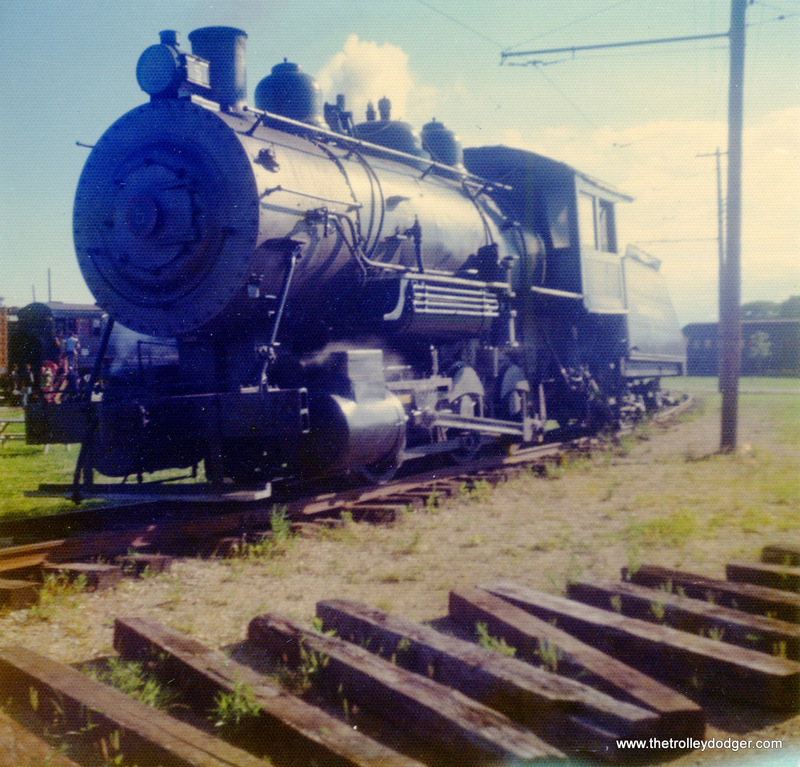 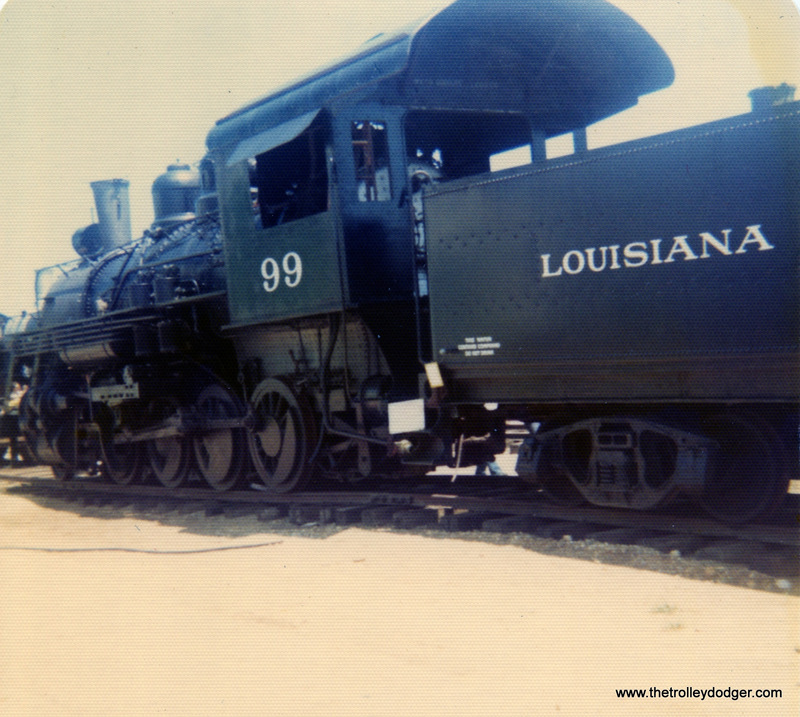 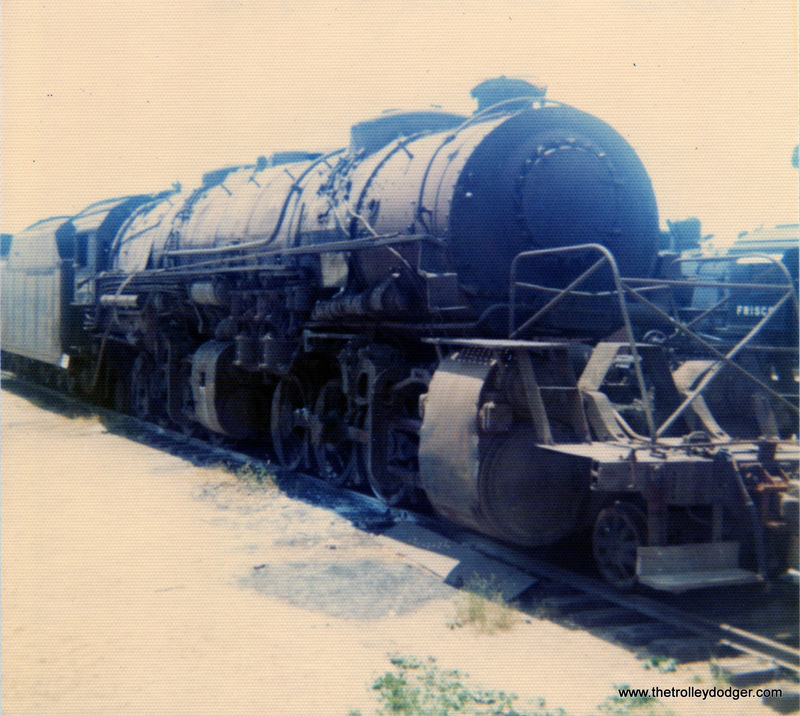 This lone survivor is seen at the Western Railway Museum on May 26, 1974. 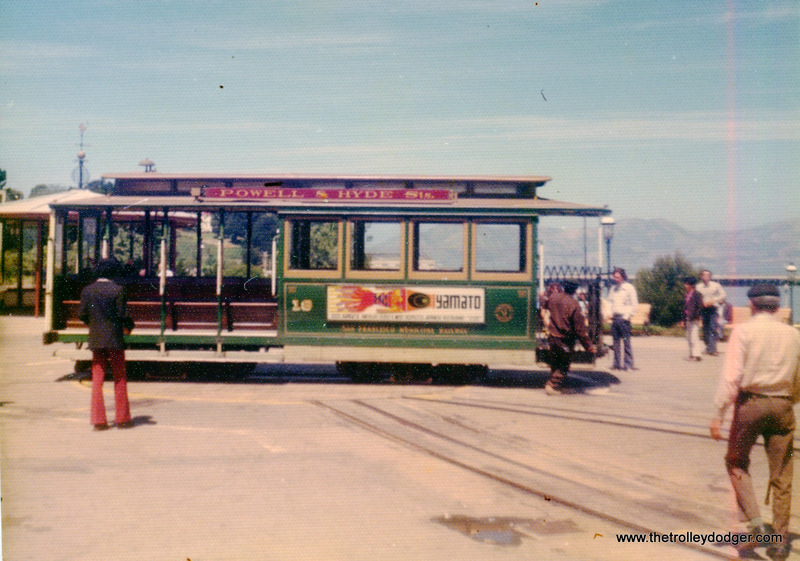 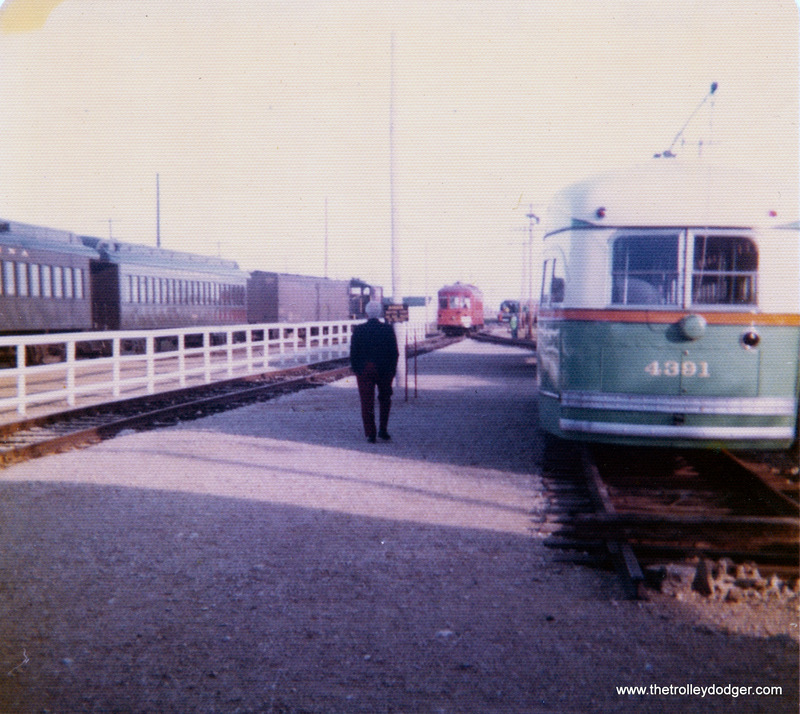 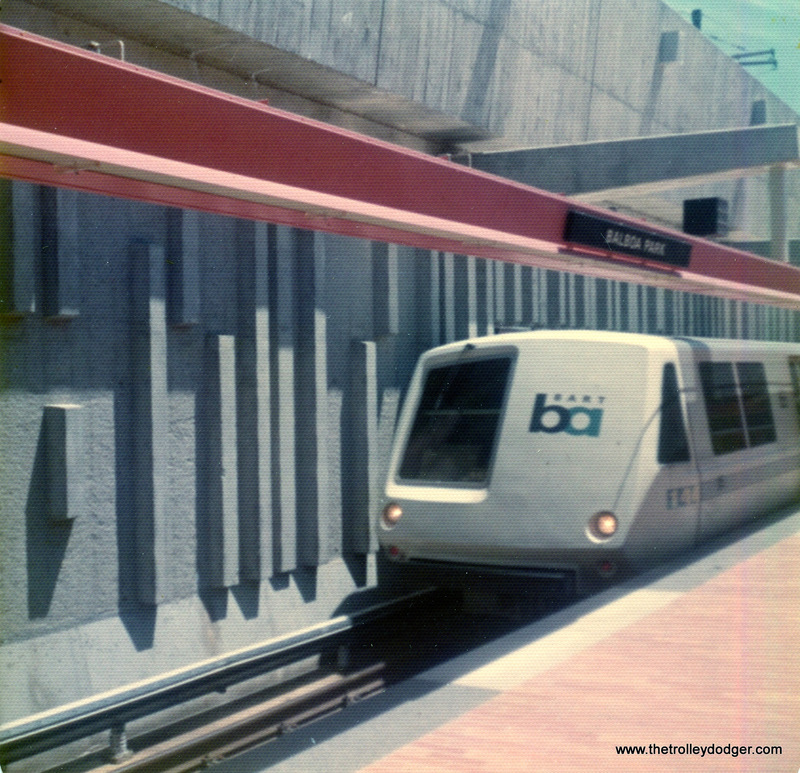 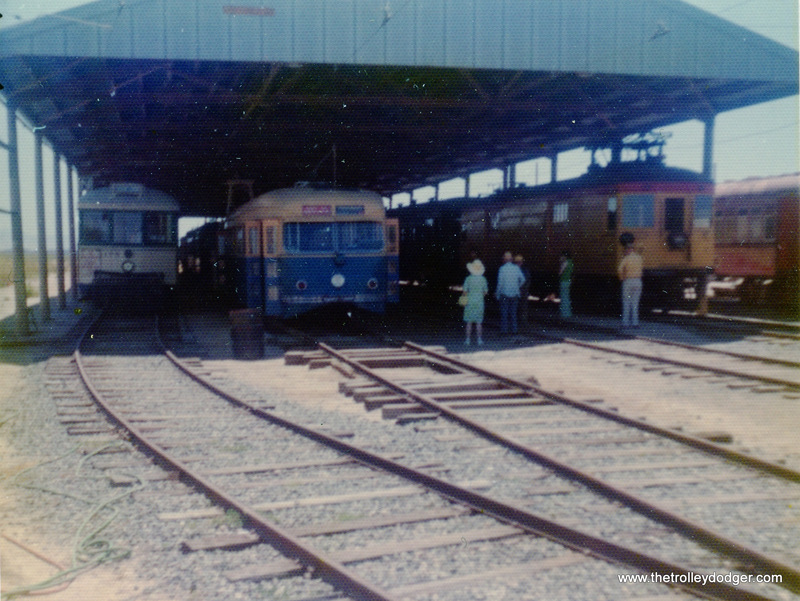 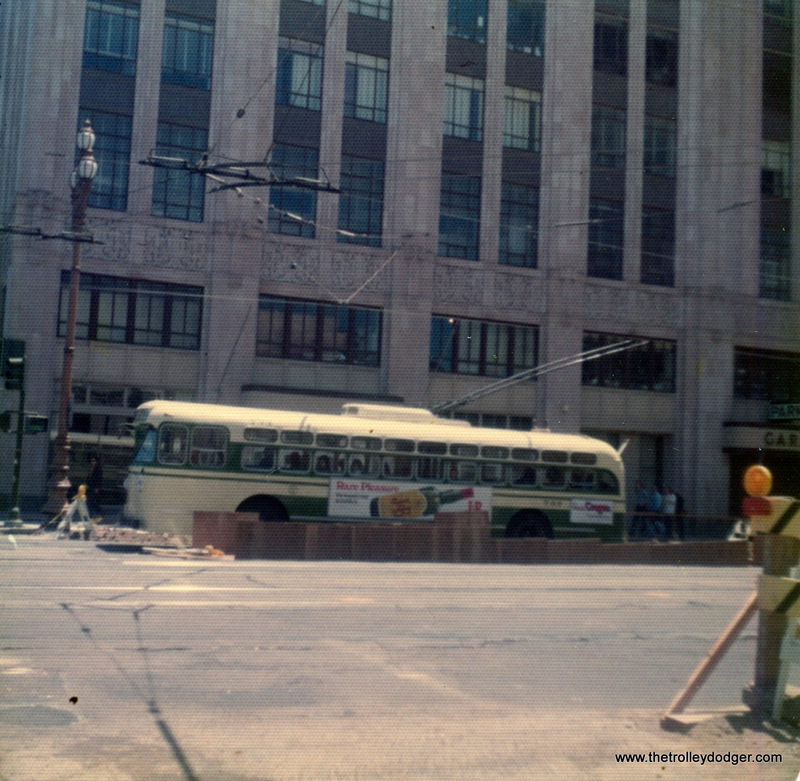 At left, we see Muni car 178, and next to it is “Magic Carpet” car 1003, at the Western Railway Museum on May 26, 1974. 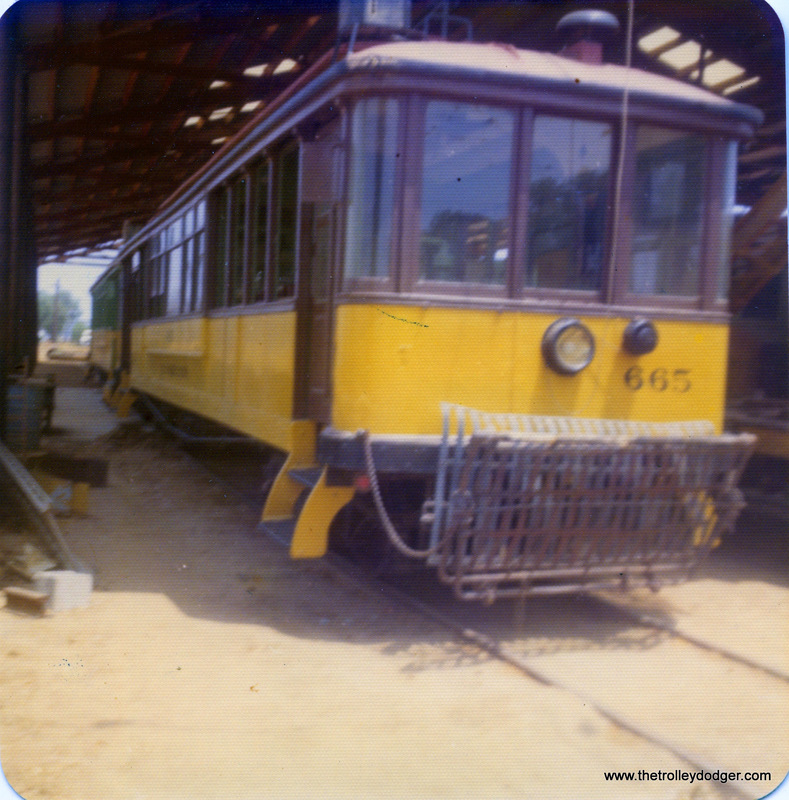 This open car was built by Brill in 1912 and was used in Rio De Janeiro. 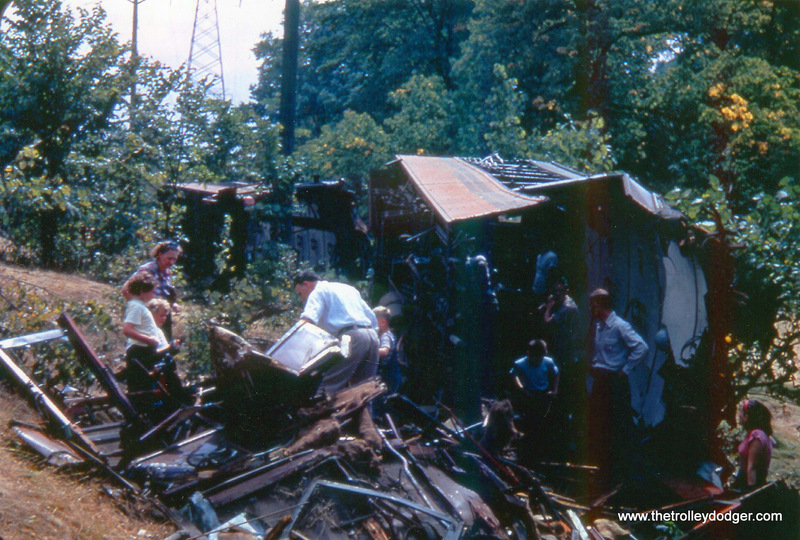 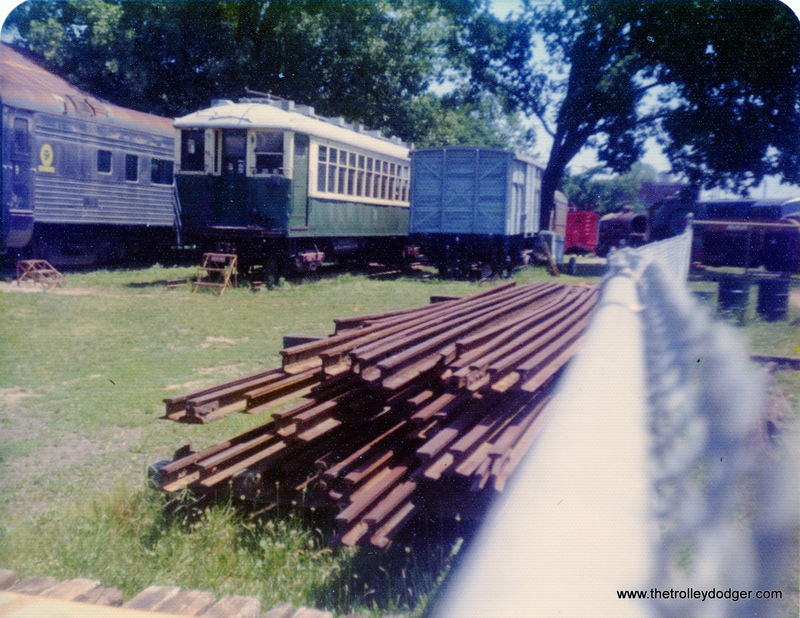 It’s shown at the Rockhill Trolley Museum on August 24, 1975. 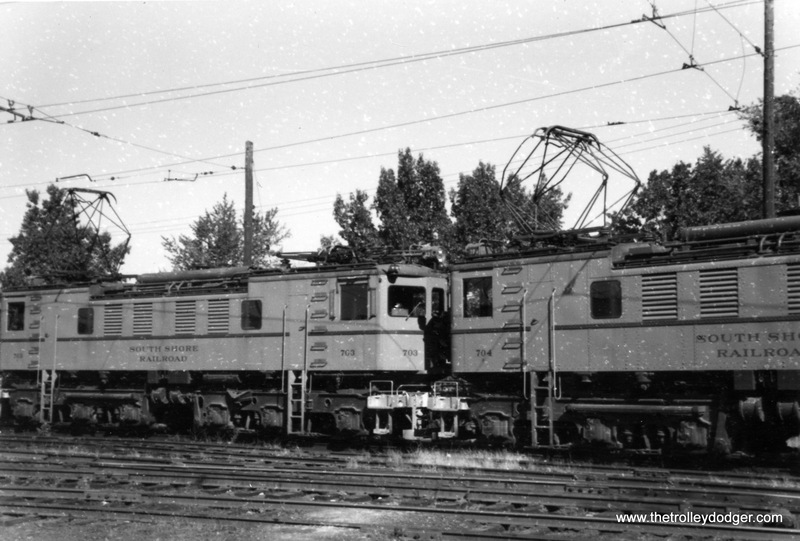 This looks like a Sacramento Northern electric freight loco (Western Railway Museum, May 26, 1974). 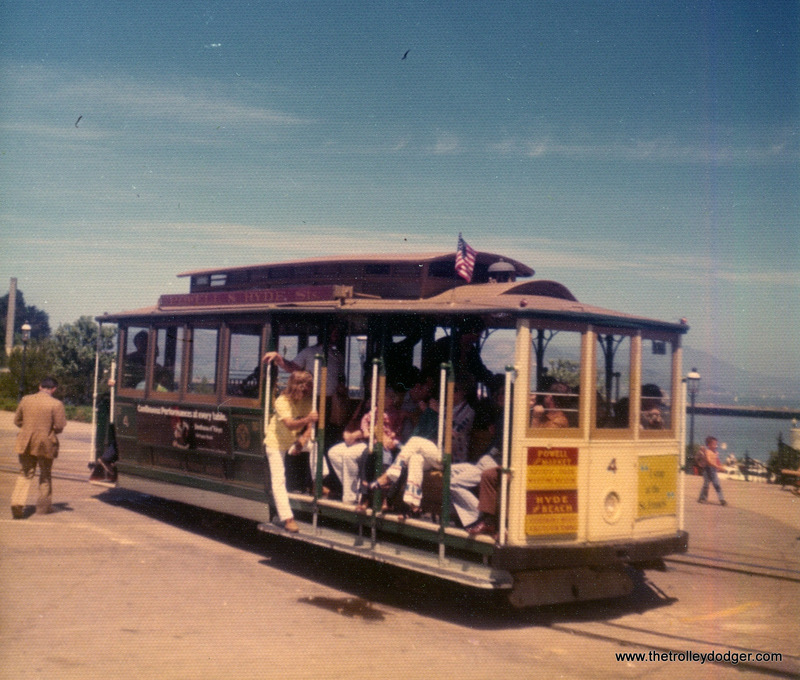 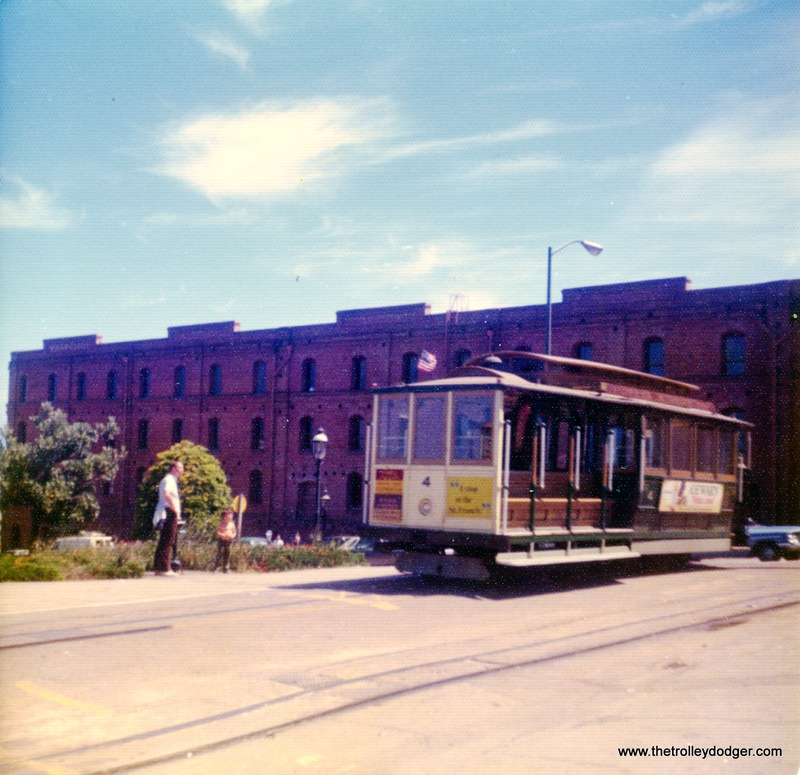 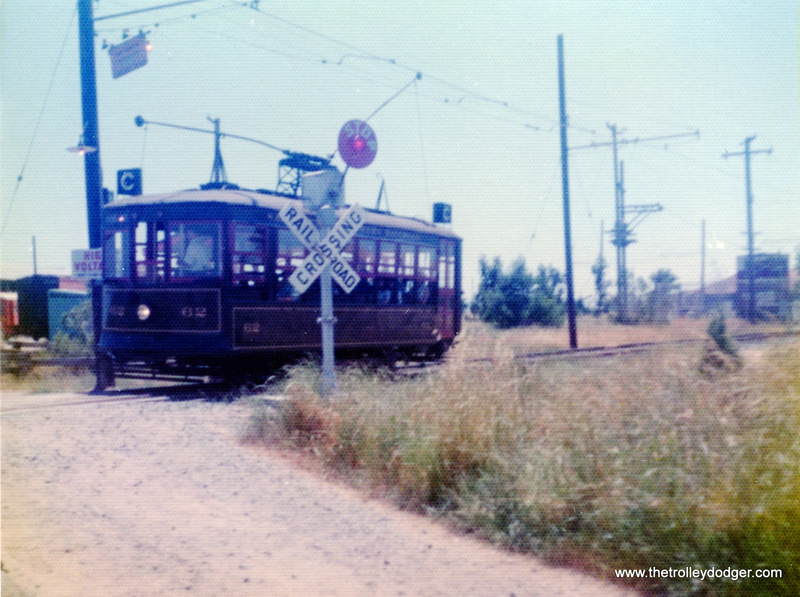 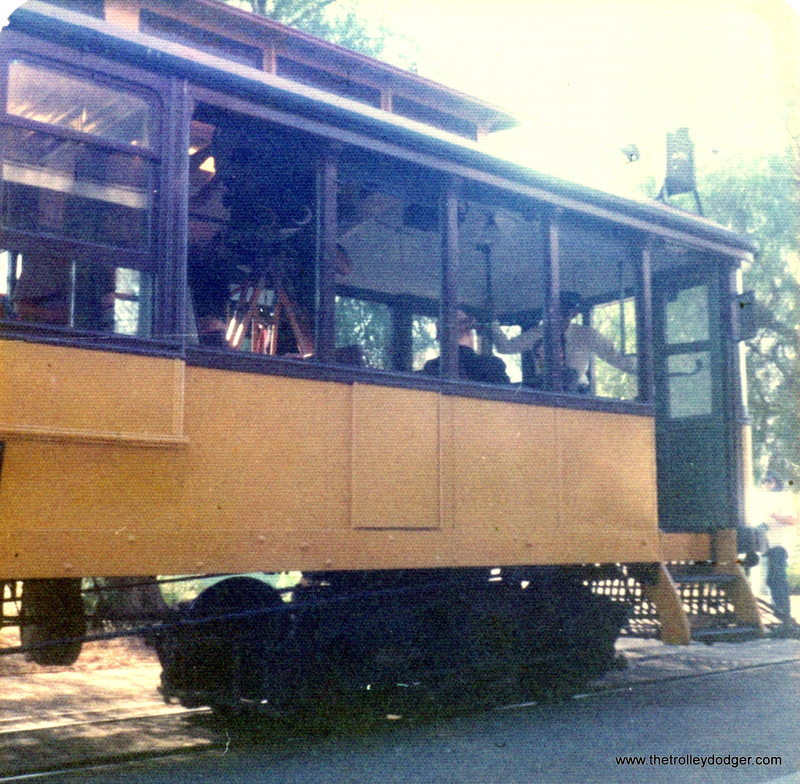 This San Francisco cable car was on display at the Santa Clara County Fairgrounds on May 26, 1973. 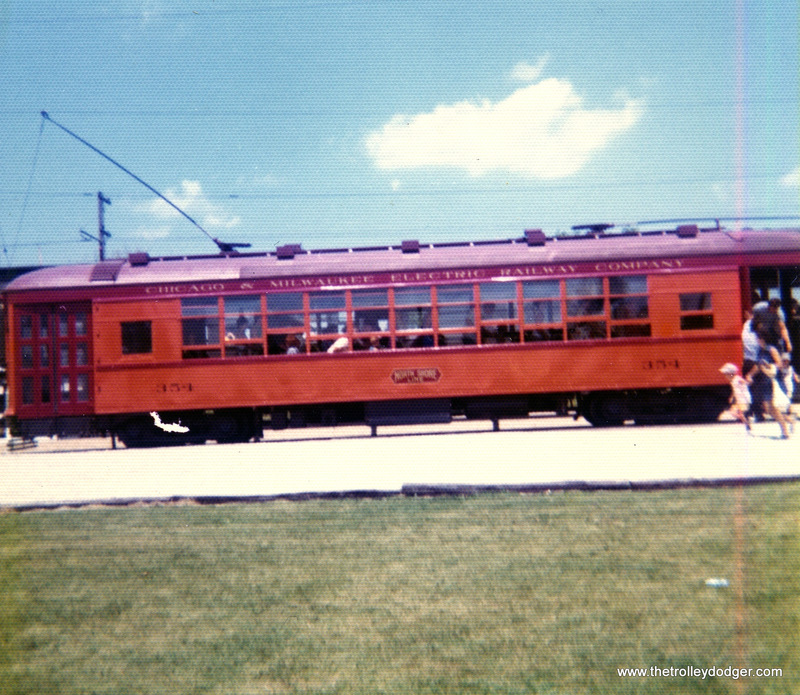 Many children played on this car over the years. 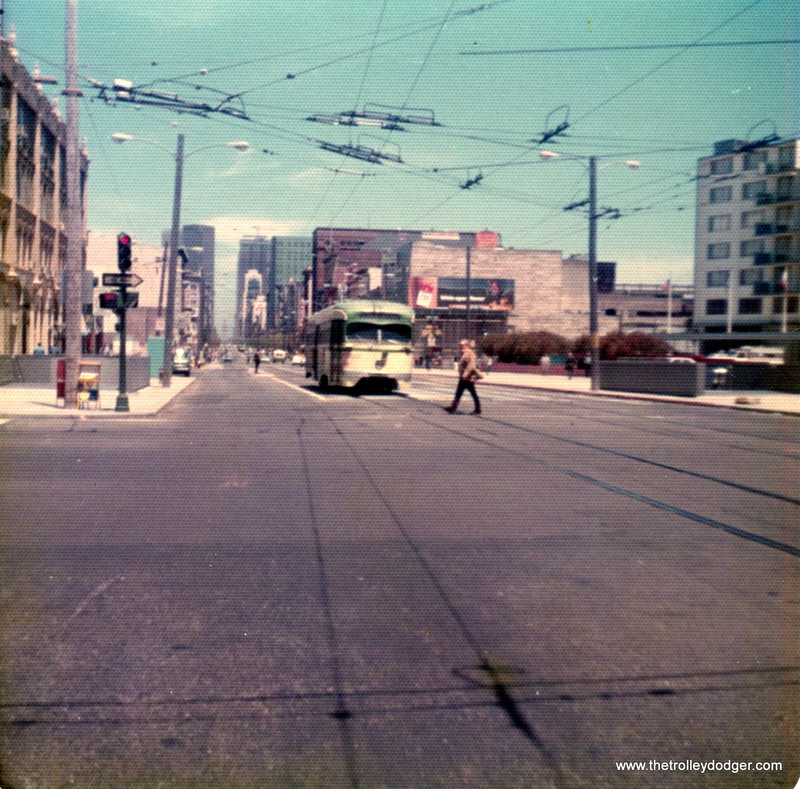 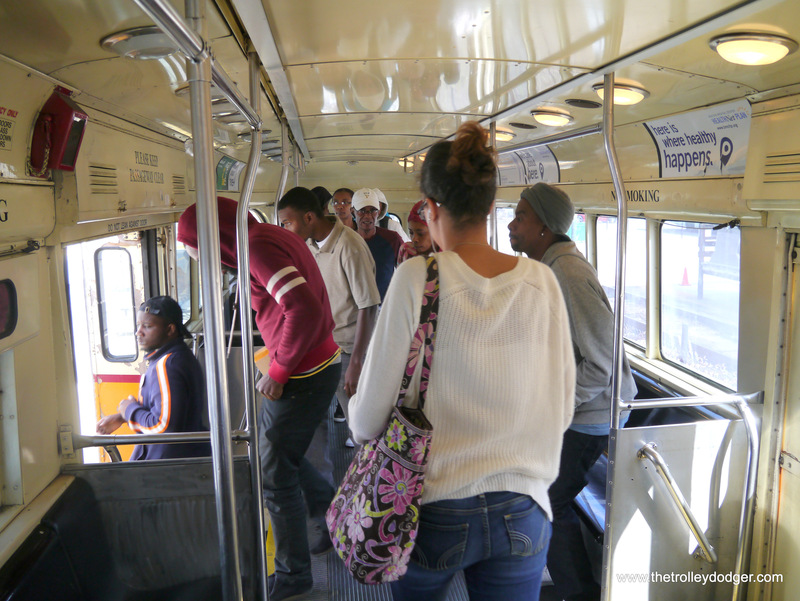 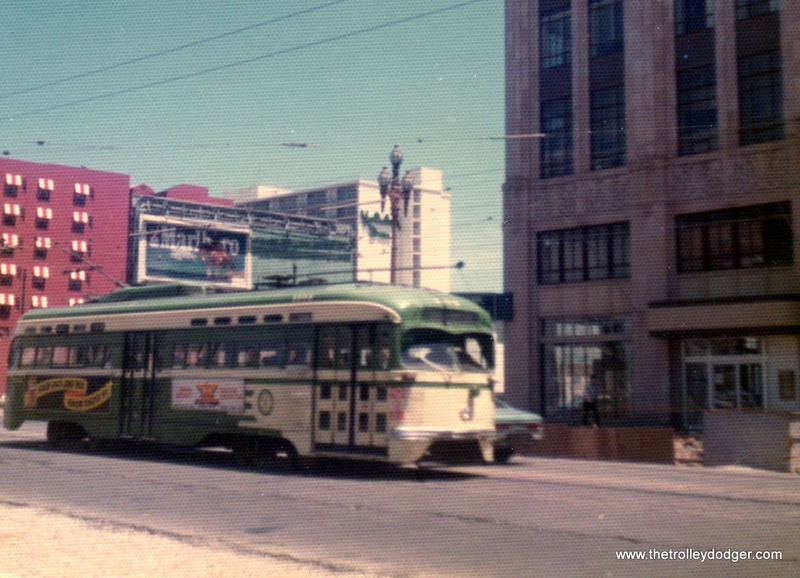 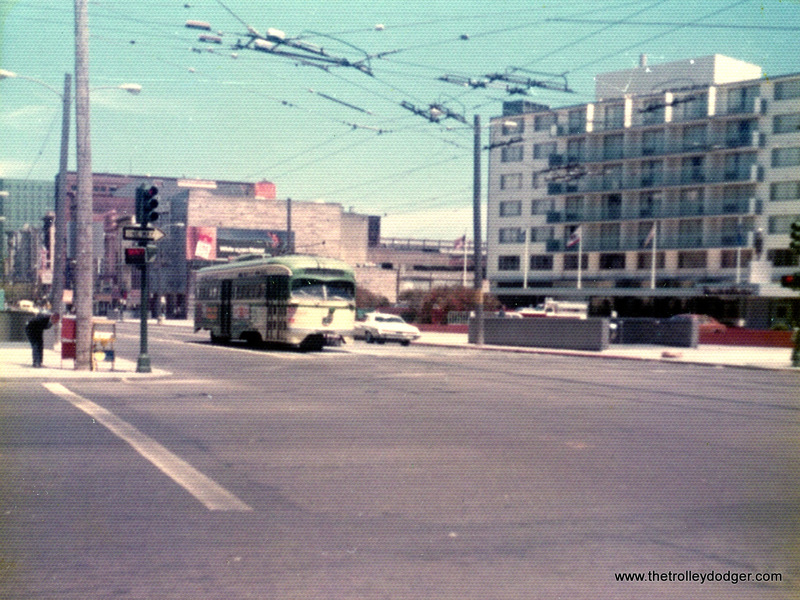 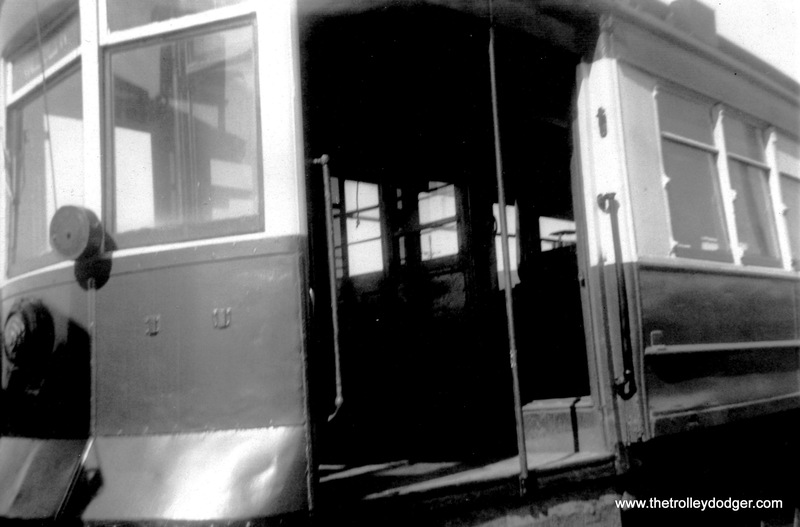 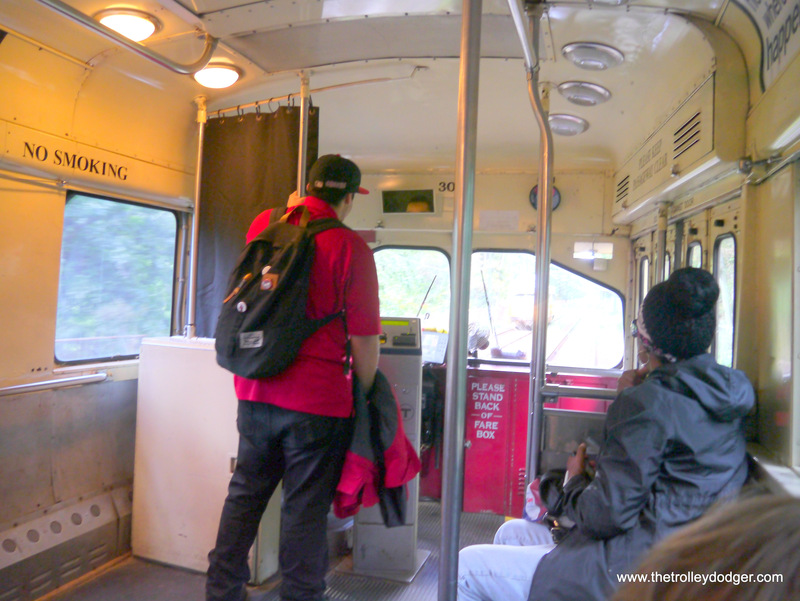 It was originally a California Street car using a side grip and was not updated when Muni took over the line. 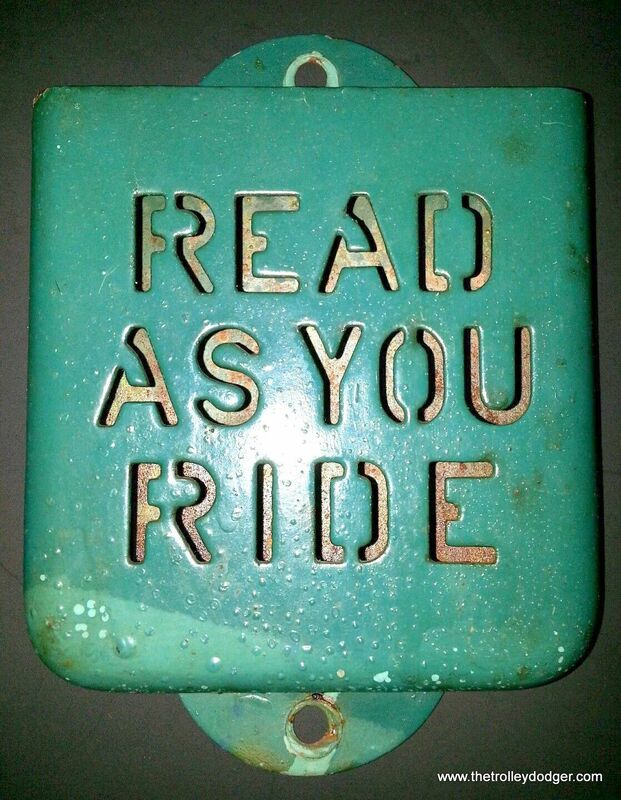 I read that in 2005 it was in storage, listed as being in poor condition with a broken frame. 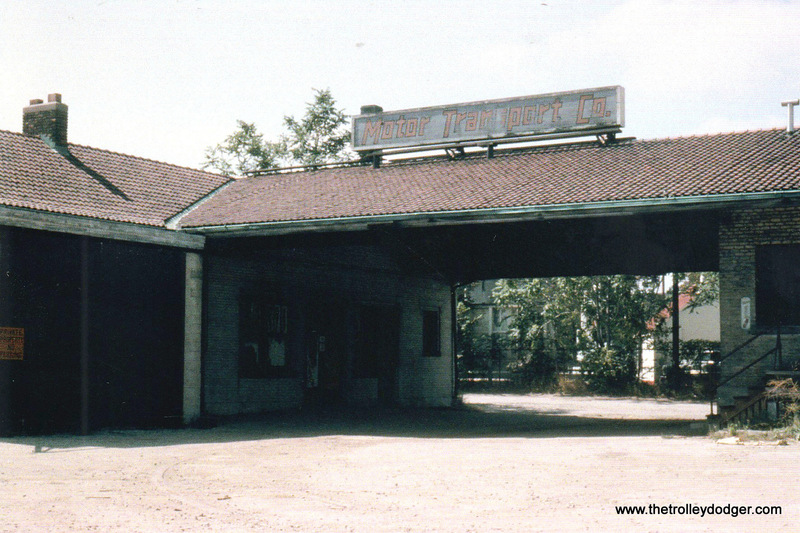 I am not sure if it still exists. 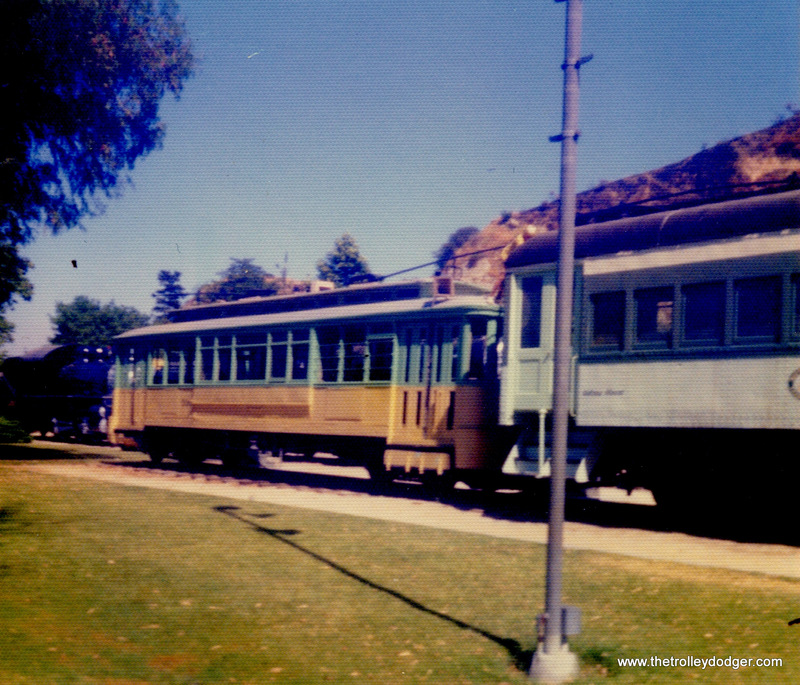 This equipment is at the Travel Town Museum at Griffith Park in Los Angeles on August 26, 1977. 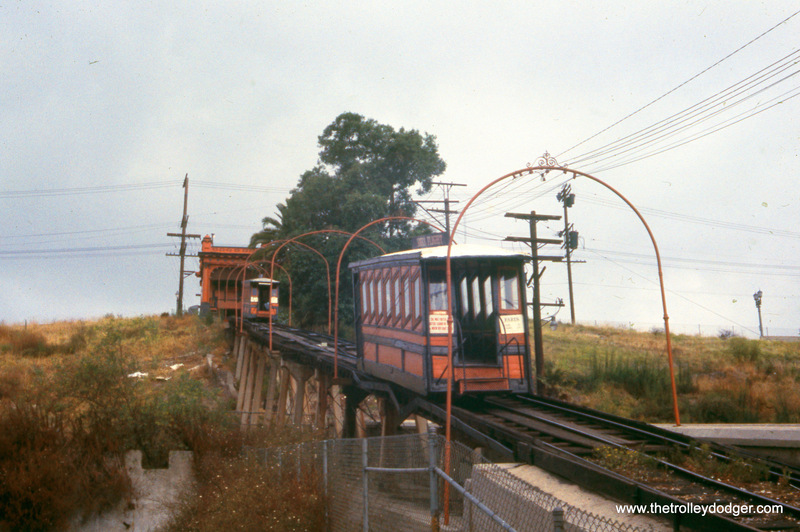 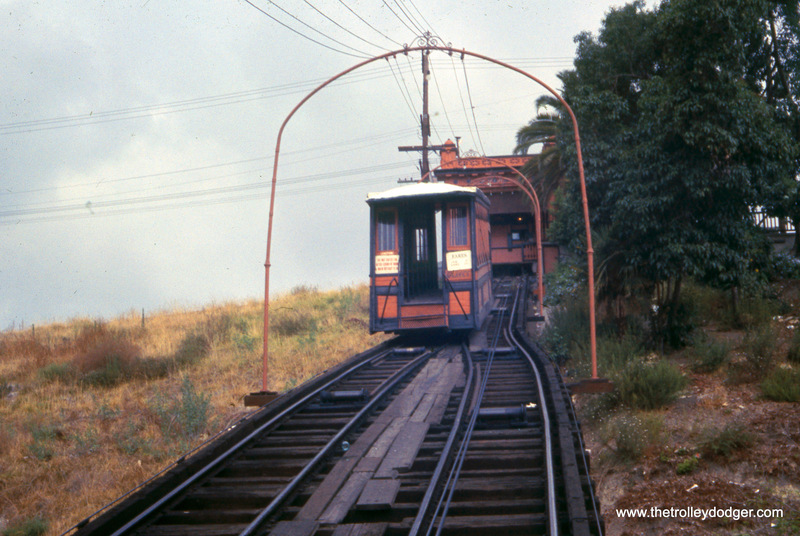 A Los Angeles streetcar and a Pacific electric “Blimp” interurban at Griffith Park on July 5, 1977. 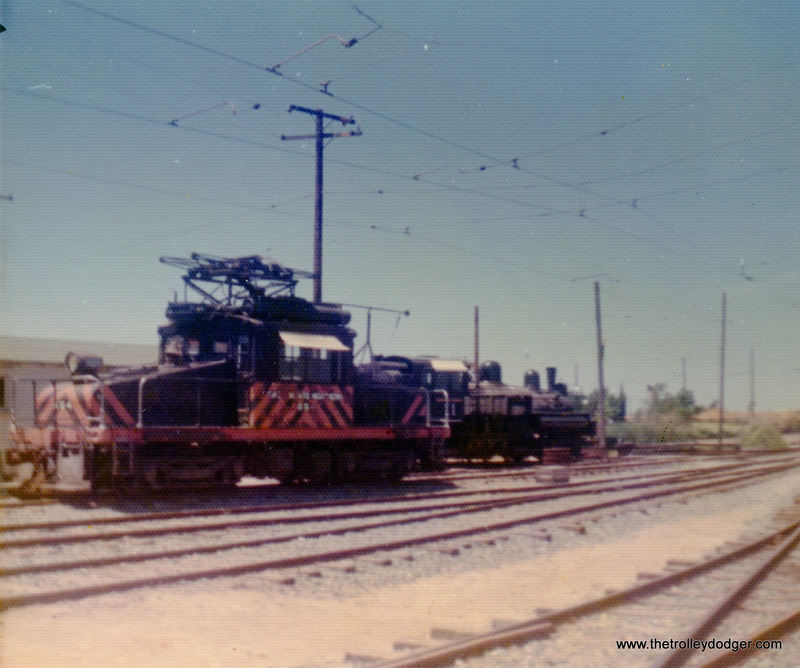 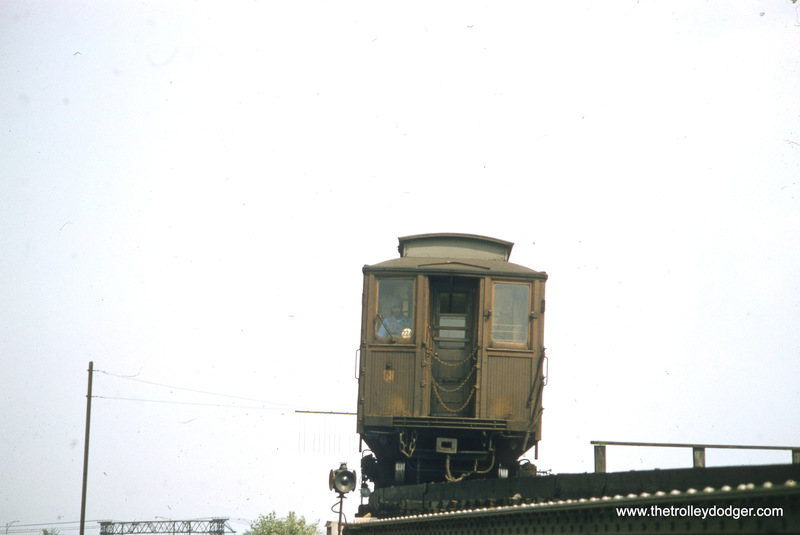 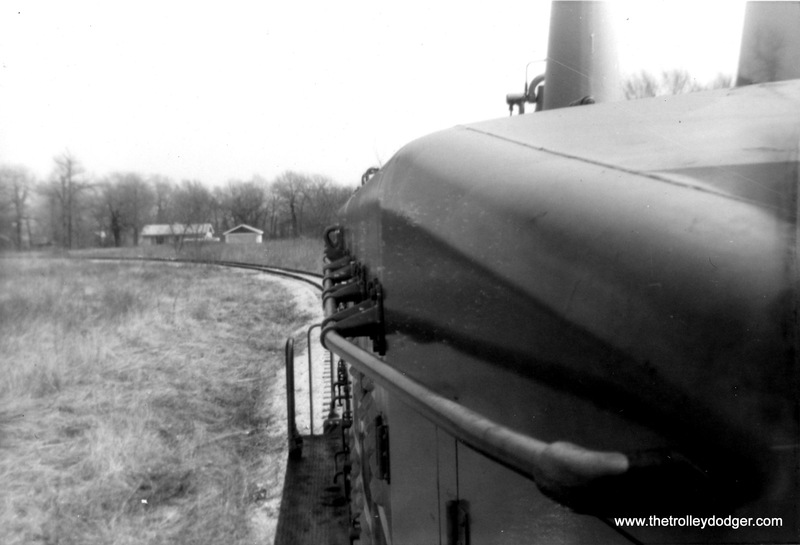 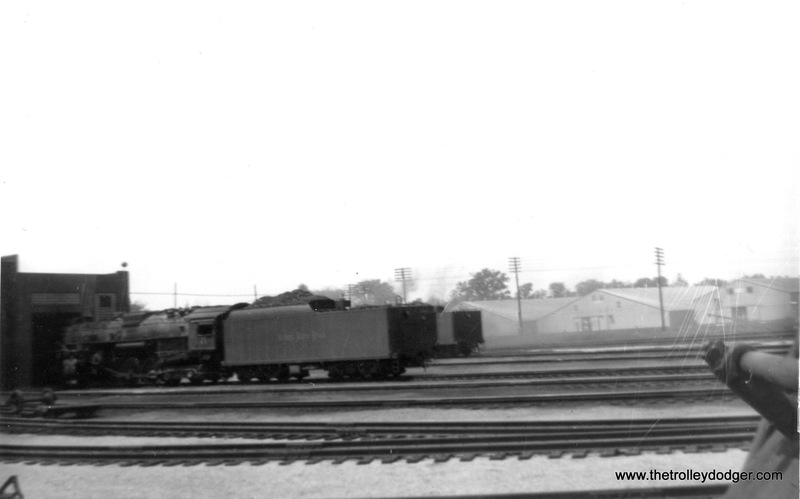 In the distance, we see a pair of Key System bridge units at the Western Railway Museum on May 26, 1974. 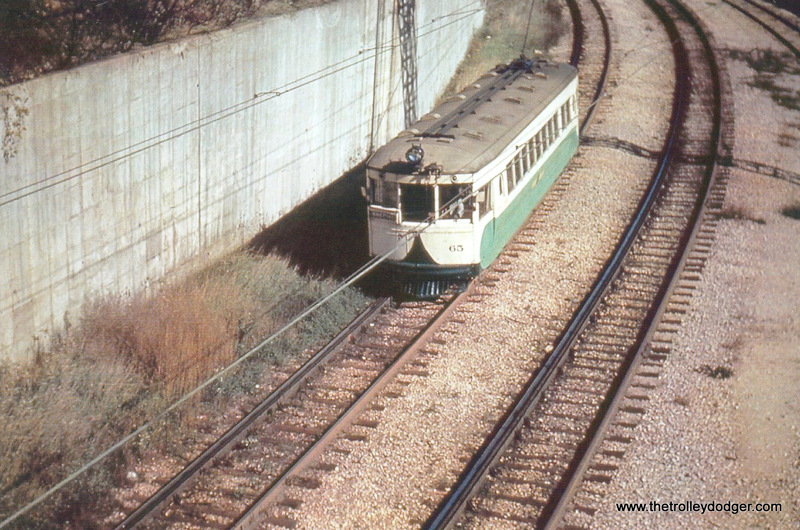 These ran in Oakland over the bay Bridge, and were retired in 1958. 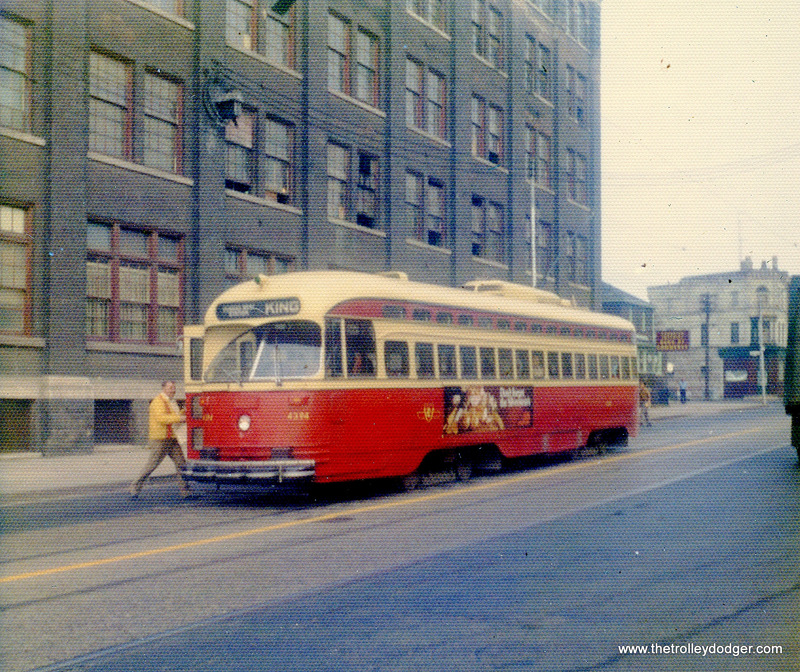 Toronto PCC 4394 on October 25, 1973. 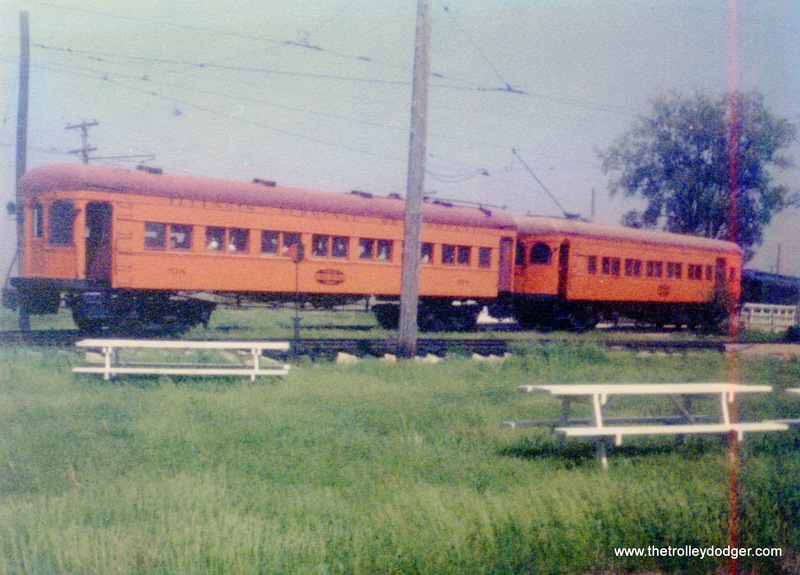 North Shore Line car 757 at East Troy, Wisconsin on June 23, 1974. 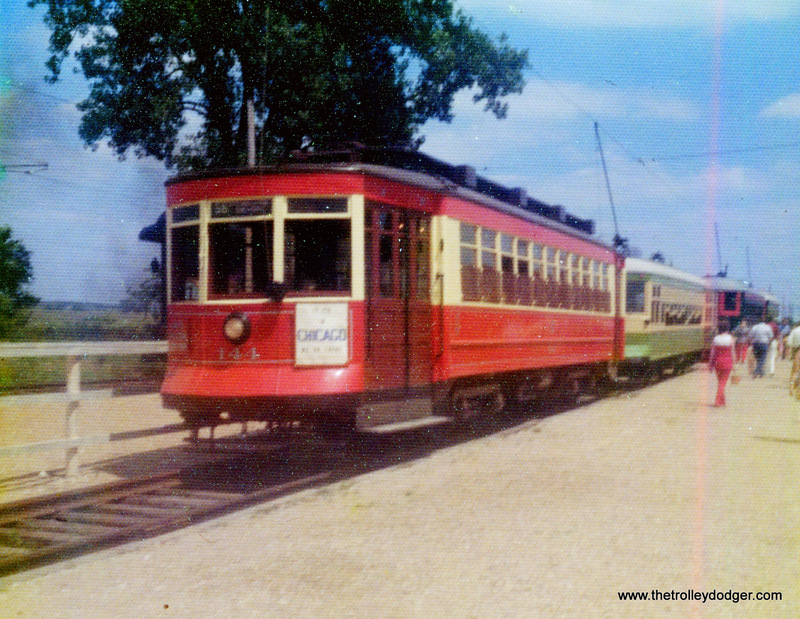 This car has since gone to the Illinois Railway Museum. 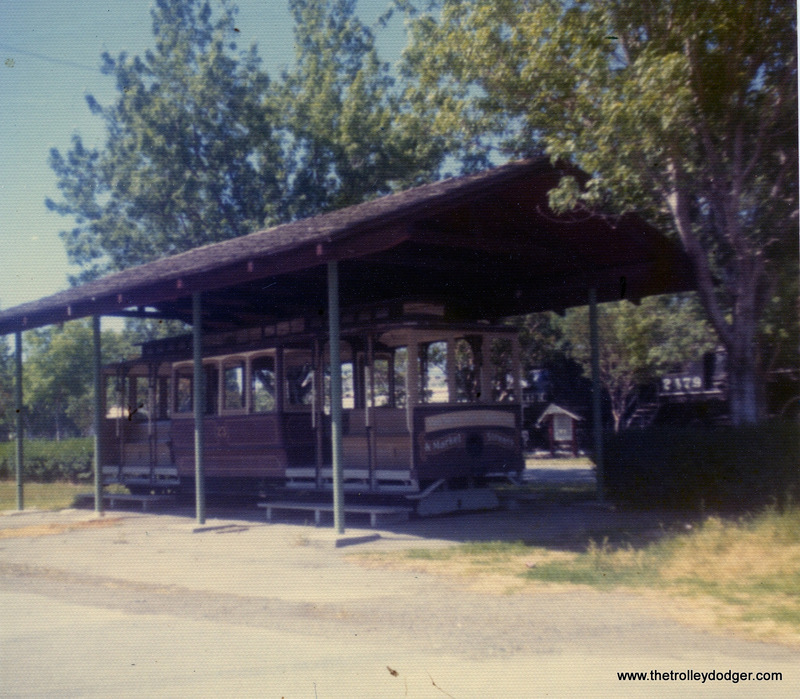 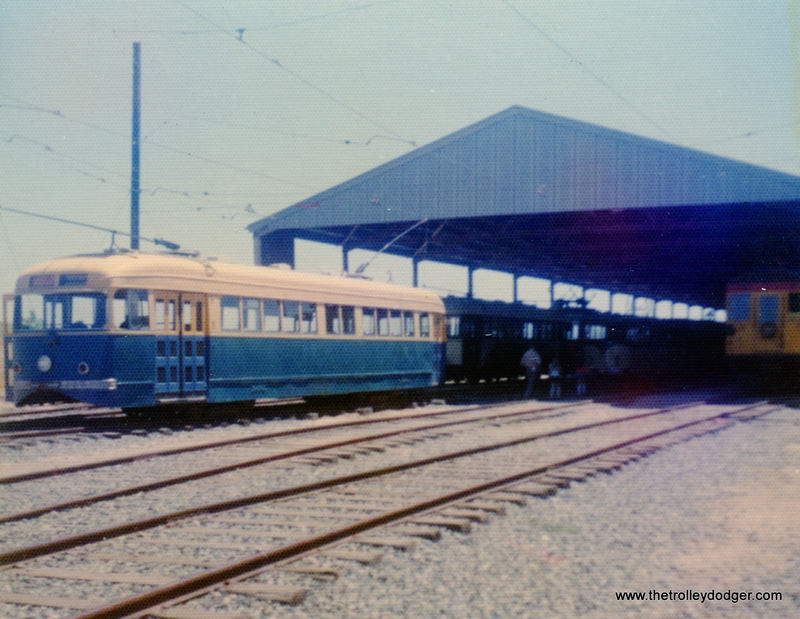 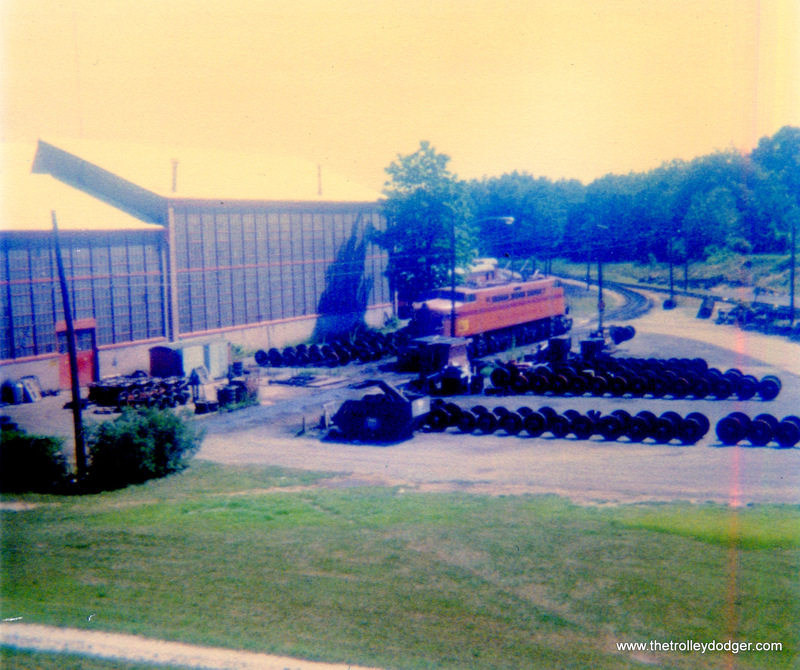 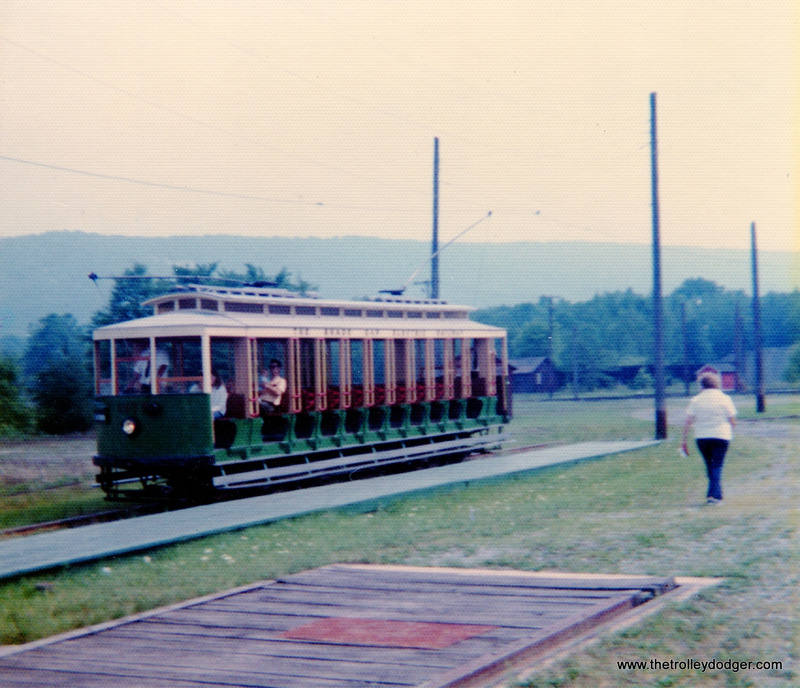 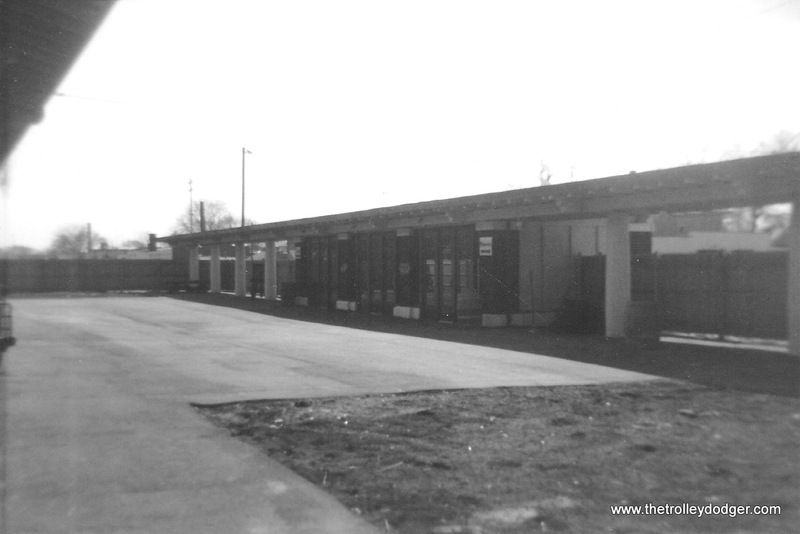 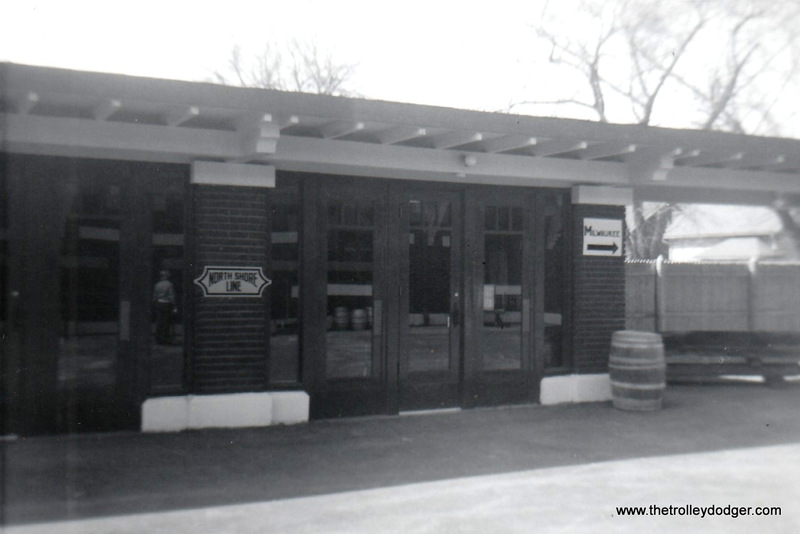 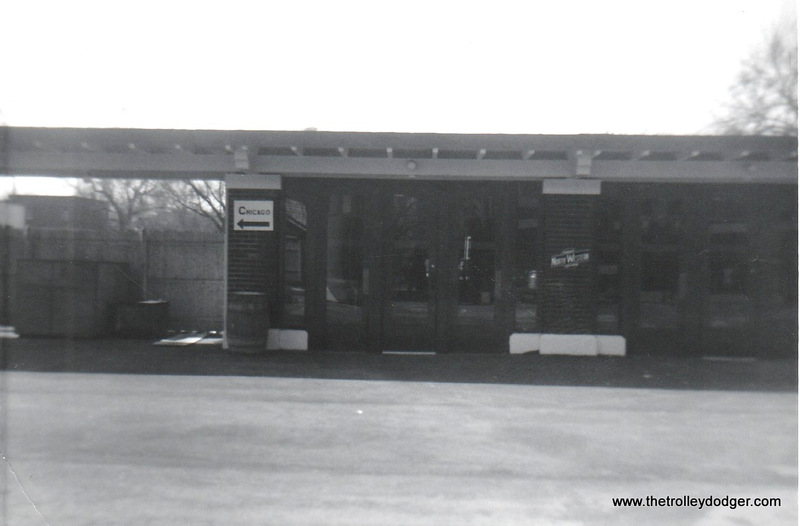 The East Troy Trolley Museum, June 23, 1974. 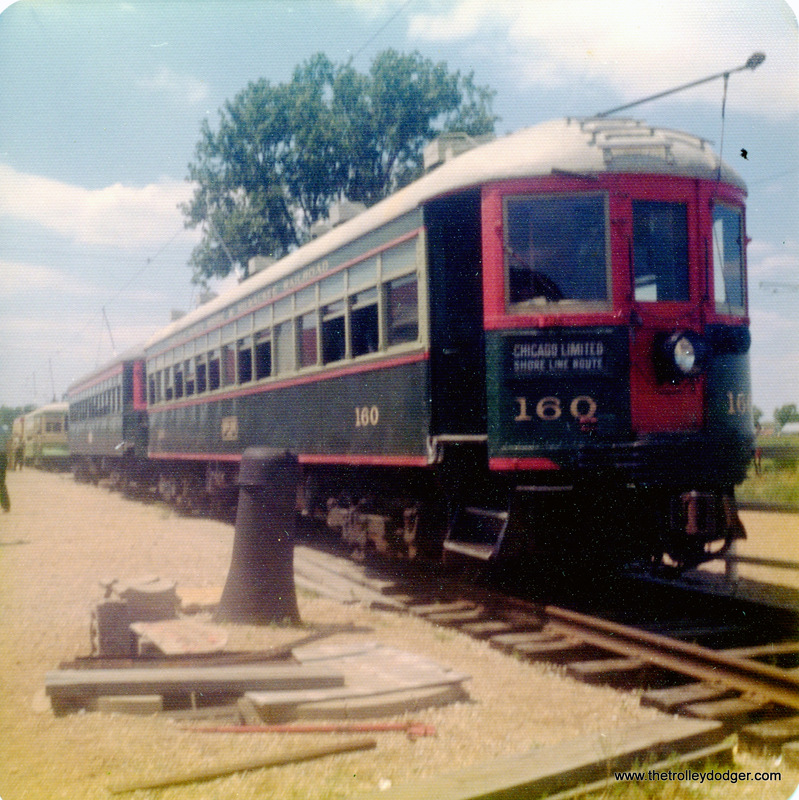 A Chicago Transit Authority 4000-series “L” car in Louisville, Kentucky on June 3, 1974. 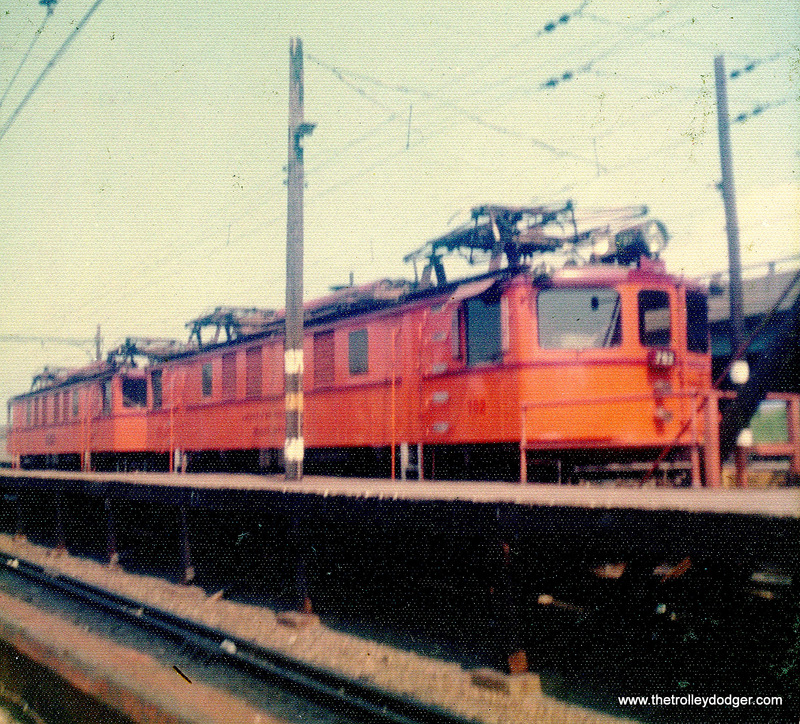 A pair of 700-series South Shore Line freight locos at the Gary, Indiana station in 1974. 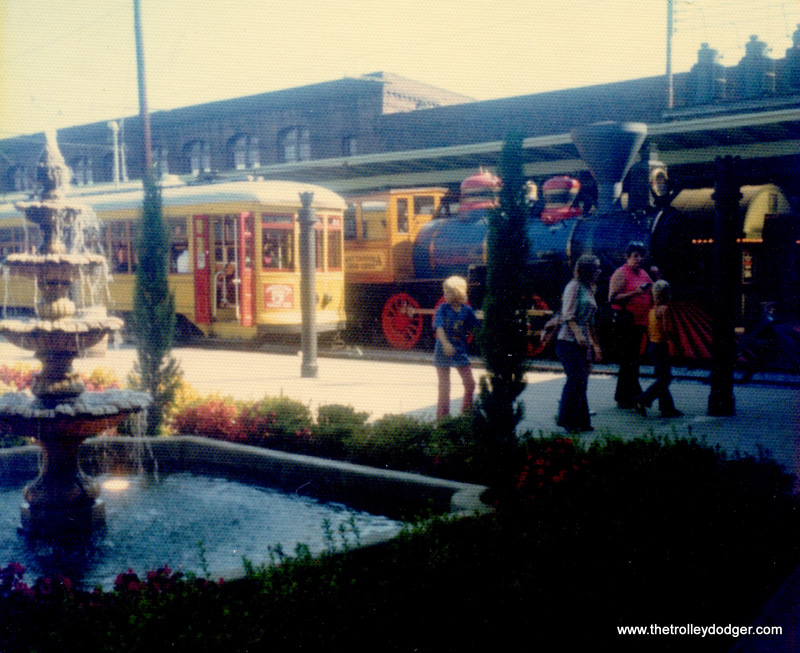 Chattanooga, Tennessee on June 2, 1974. 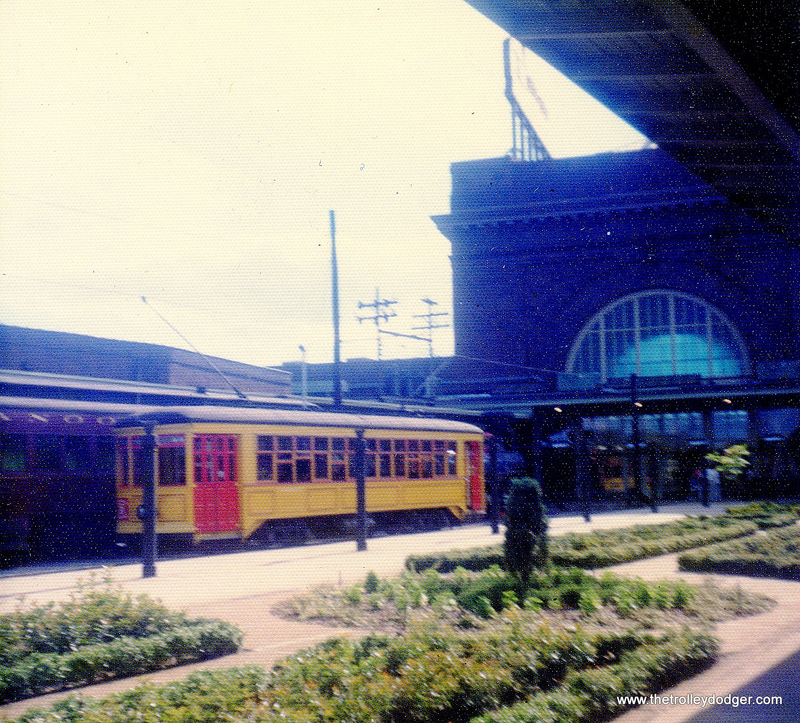 A New Orleans streetcar at Union Station in Chattanooga, June 2, 1974. 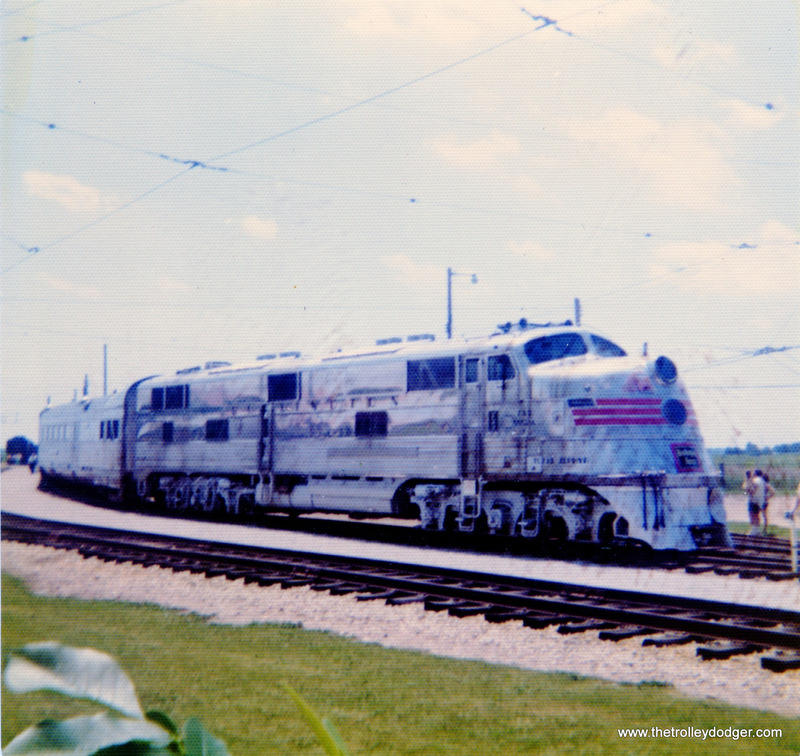 Steam at Union, Illinois, August 8, 1976. 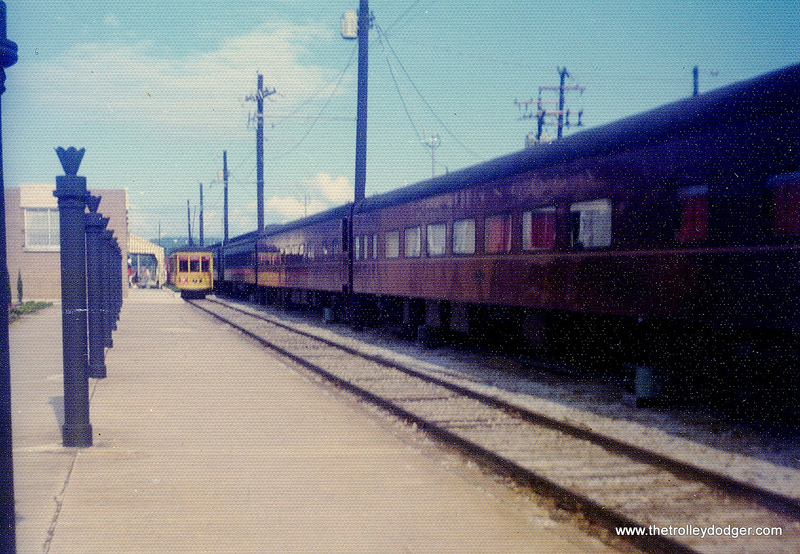 The Burlington Zephyr at IRM, 1976. 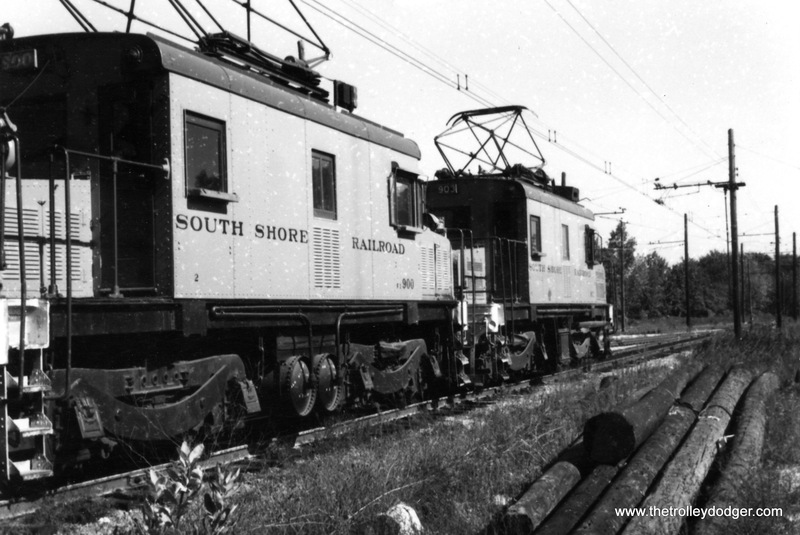 South Shore Line cars in storage at Michigan City, Indiana on July 17, 1977. 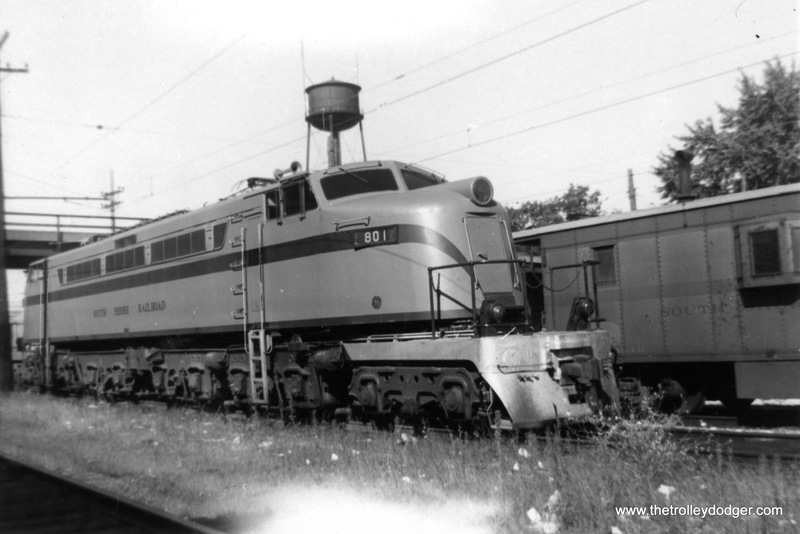 A “Little Joe” in Michigan City, July 17, 1977. 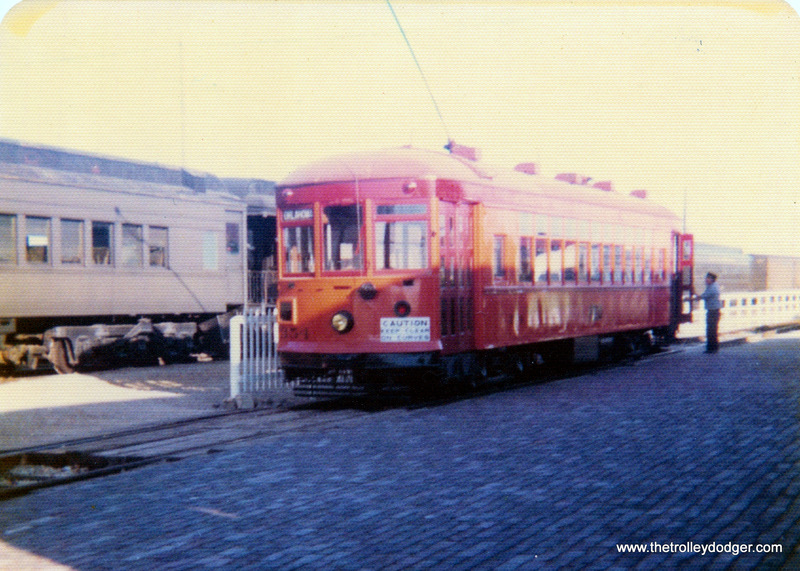 Illinois Terminal cars at IRM, July 1977. 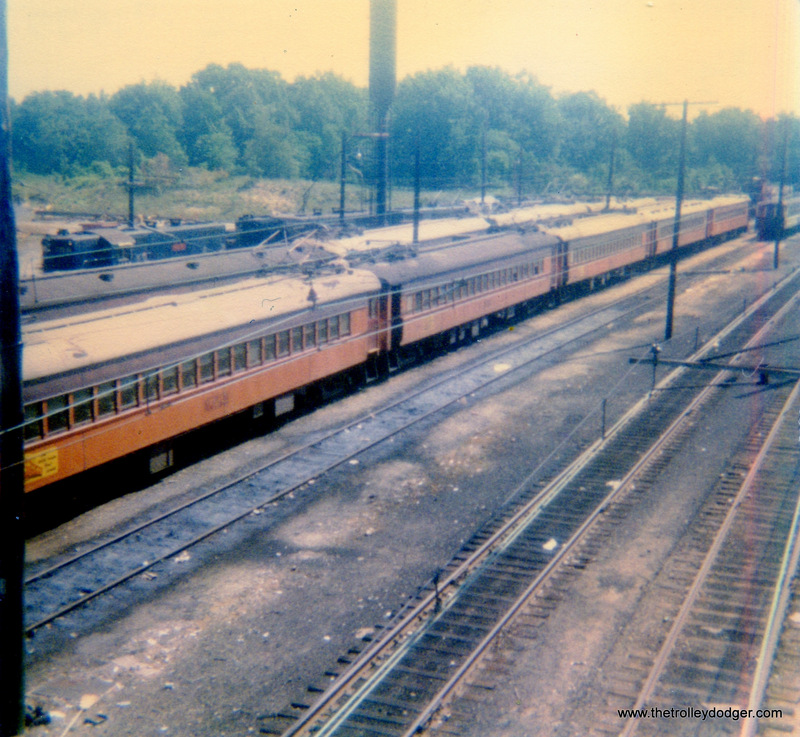 Illinois Terminal cars at IRM, June 23, 1974. 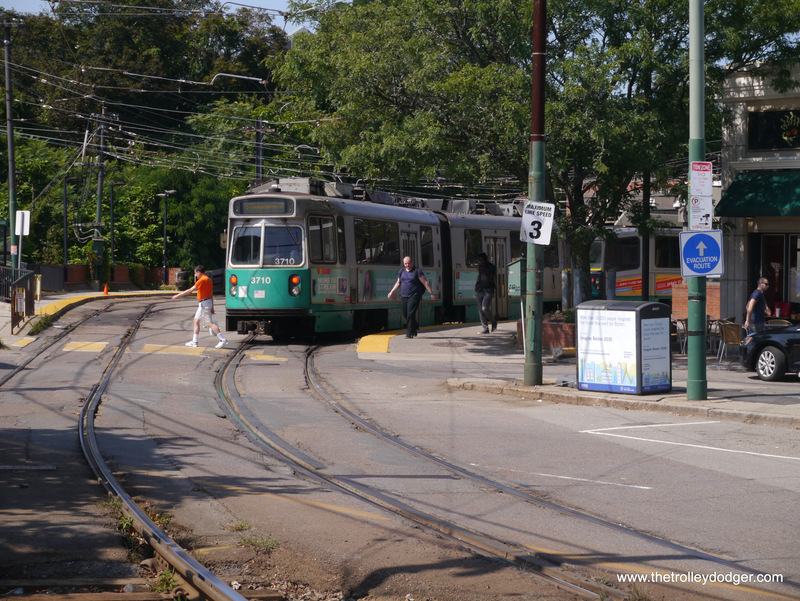 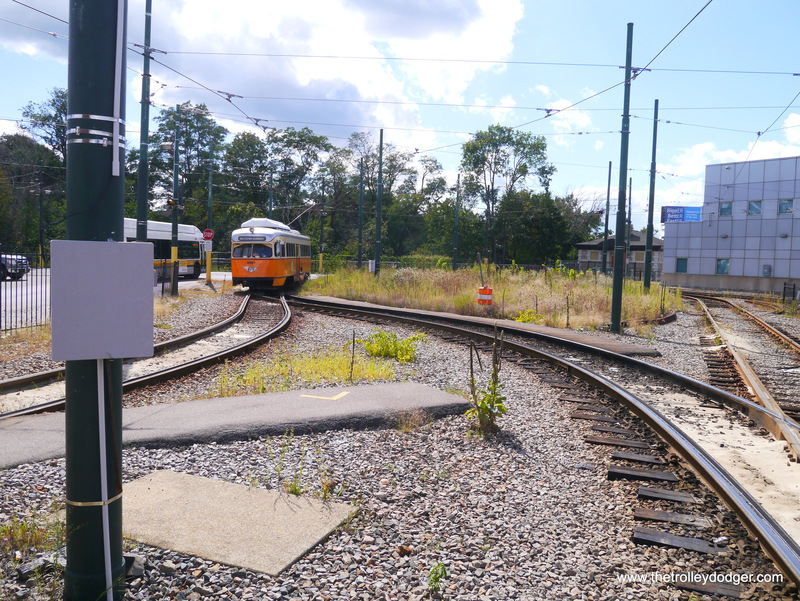 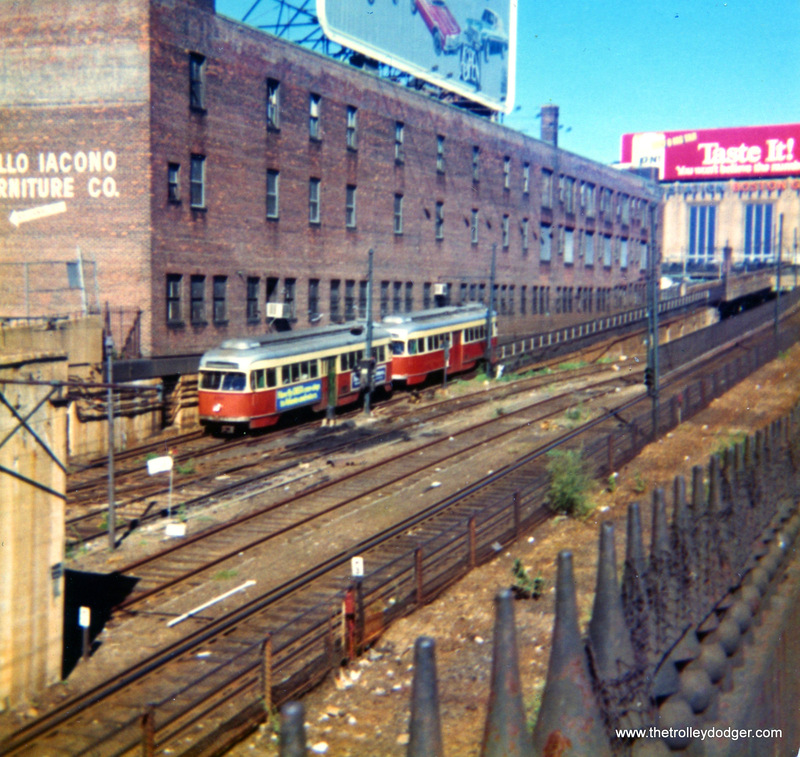 Boston MTA 3292, signed for Braves Field, is on a double-track loop with the ball park at the right. 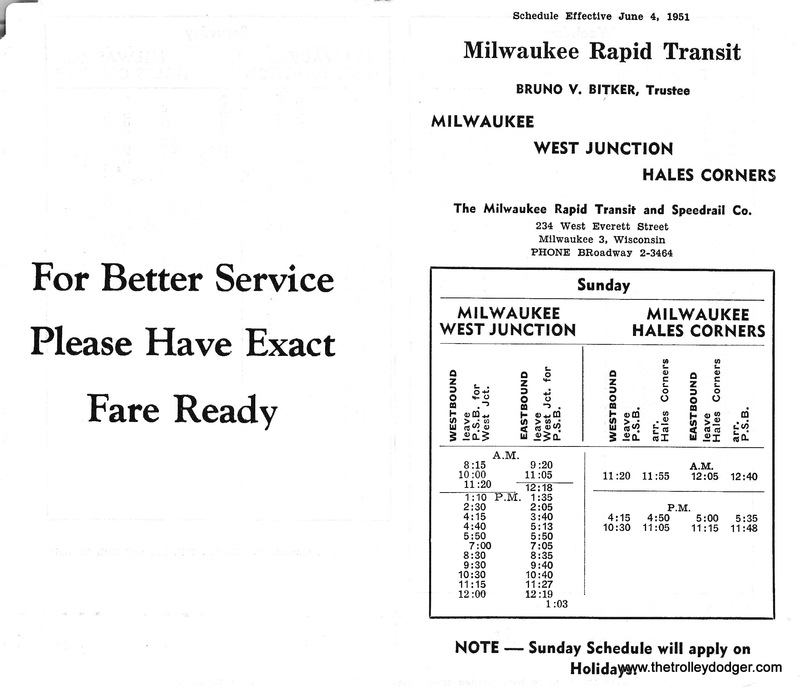 The Boston Braves played there last game here on September 21, 1952 (exactly 65 years ago today), after which the team was moved to Milwaukee. 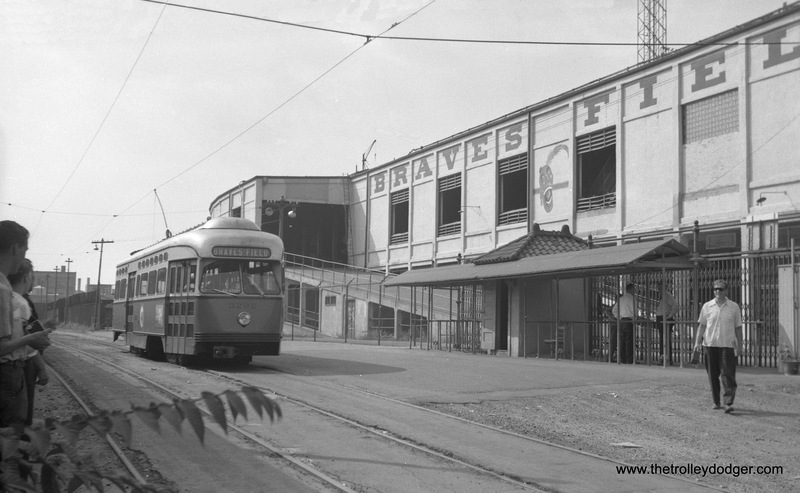 Following the 1965 season, they became the Atlanta Braves. 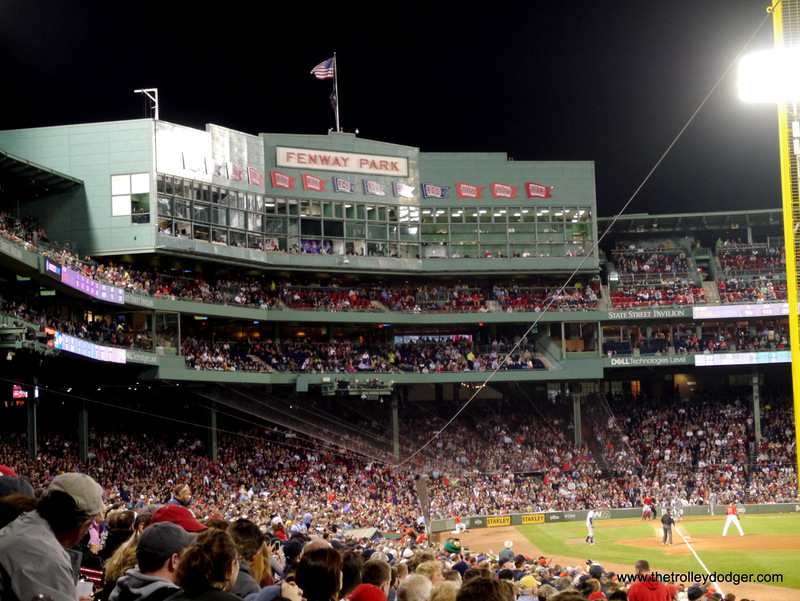 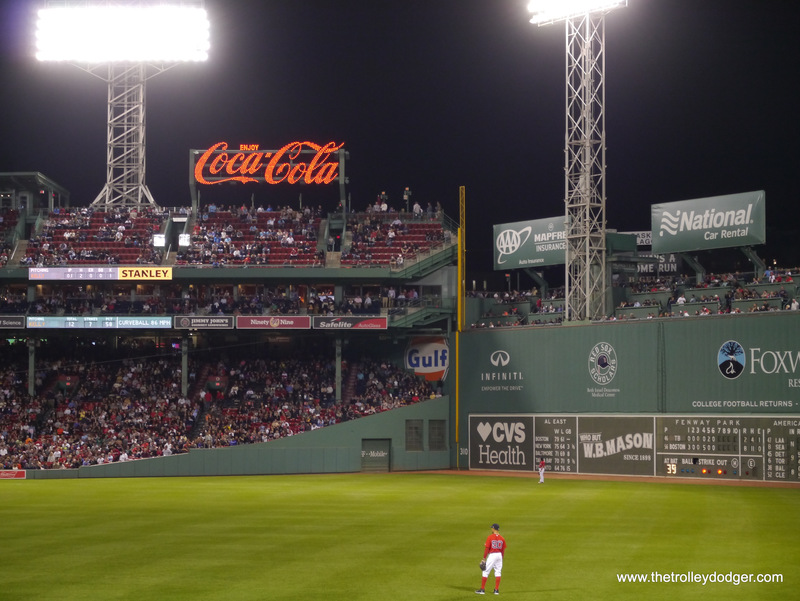 A portion of Braves Field still exists as part of Boston College’s Nickerson Field. 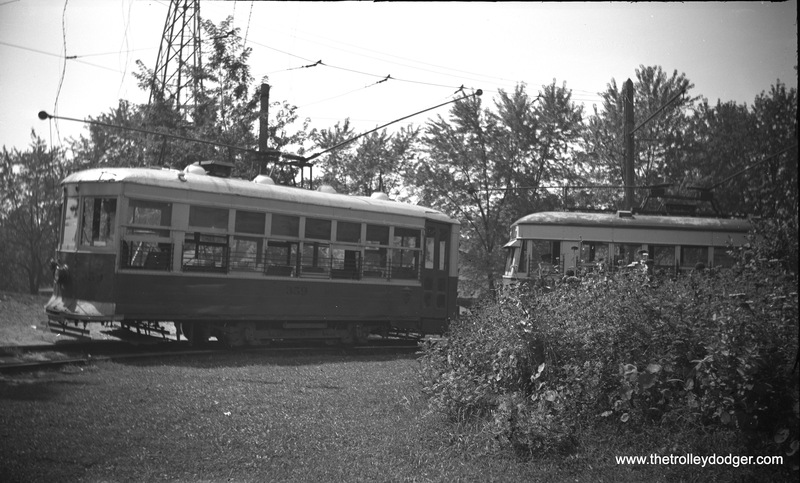 We discussed streetcar service to Braves Field in our previous post More Mystery Photos (July 29, 2016). 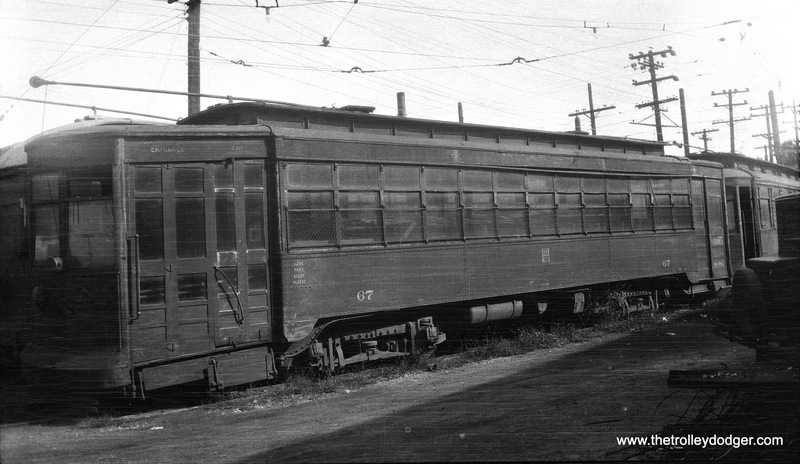 Hammond, Whiting & East Chicago car 67 was built by American Car in 1917 and was converted to one-man operation in 1932. 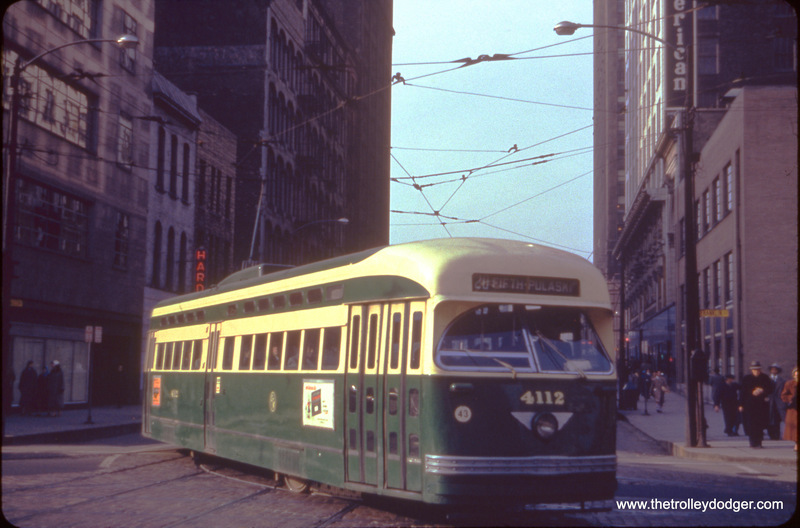 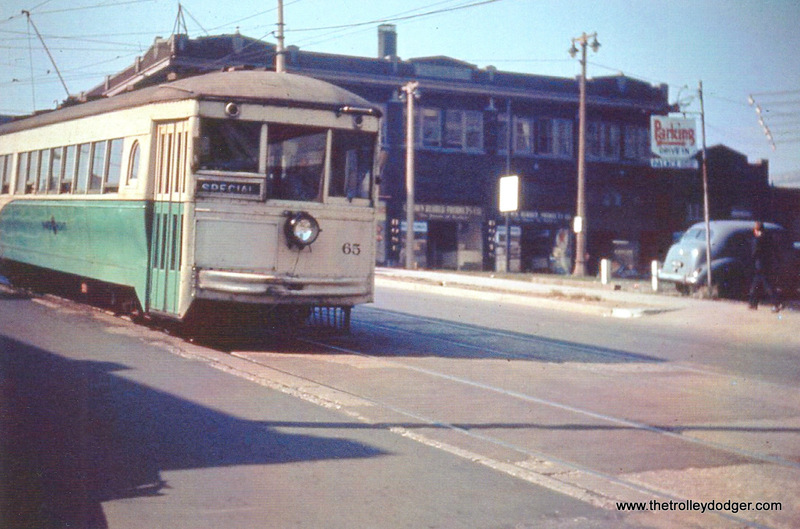 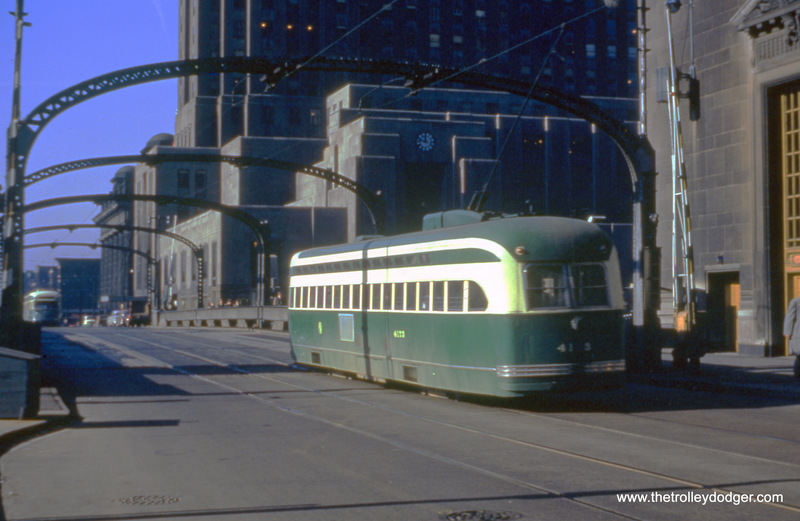 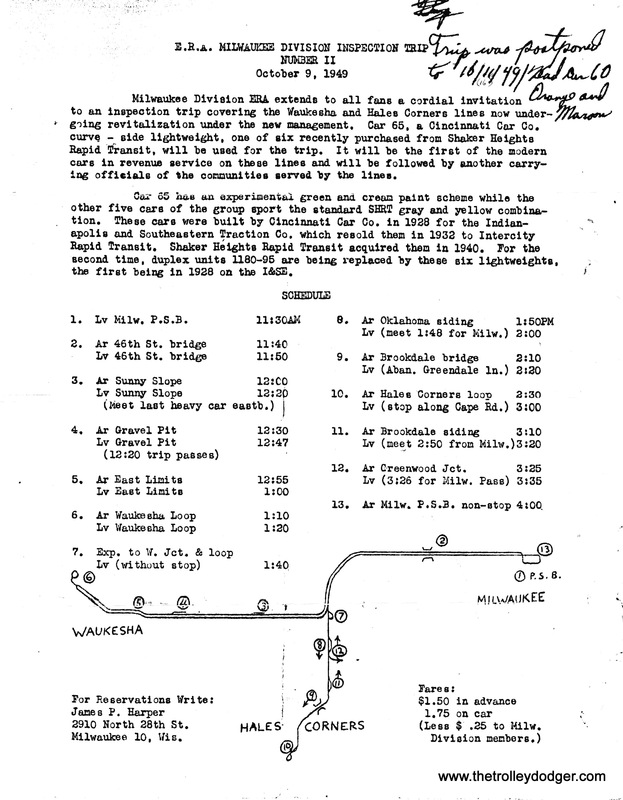 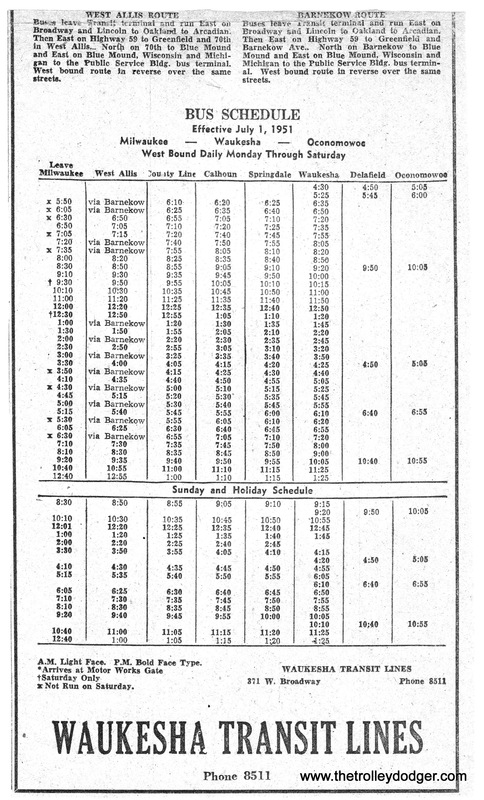 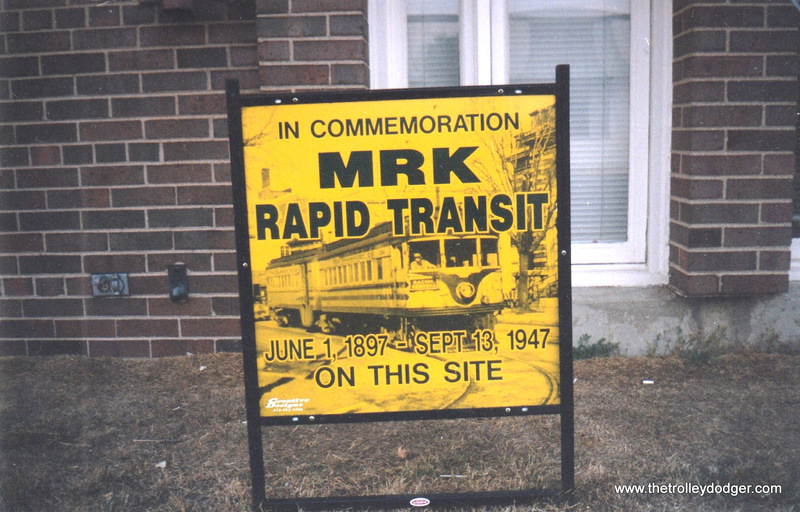 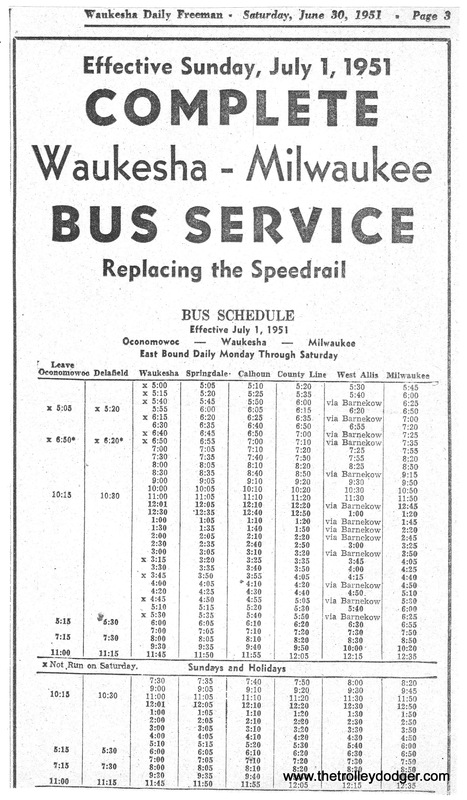 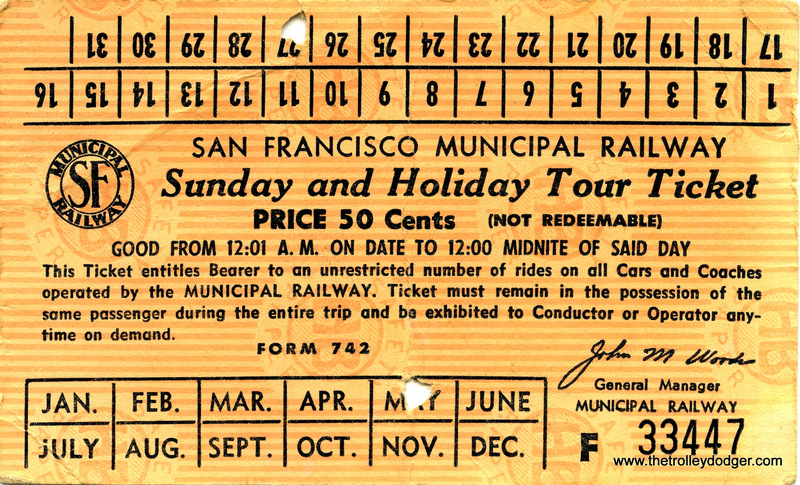 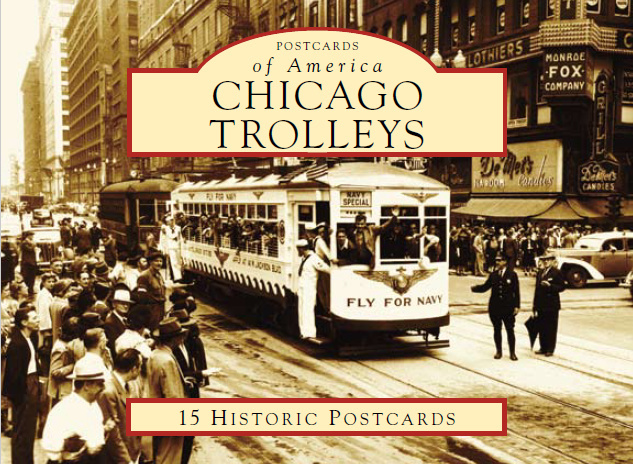 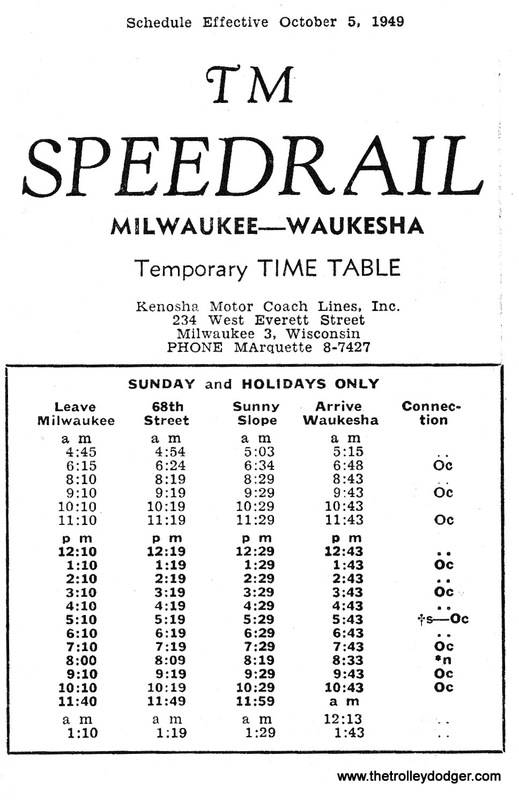 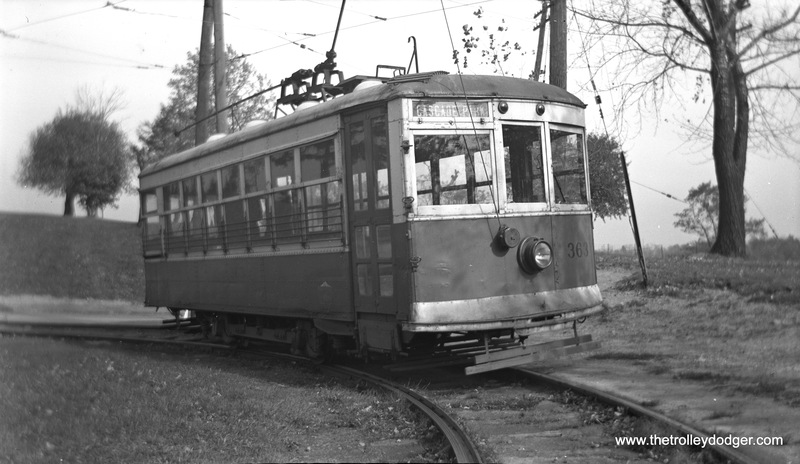 Streetcar service ended in 1940. 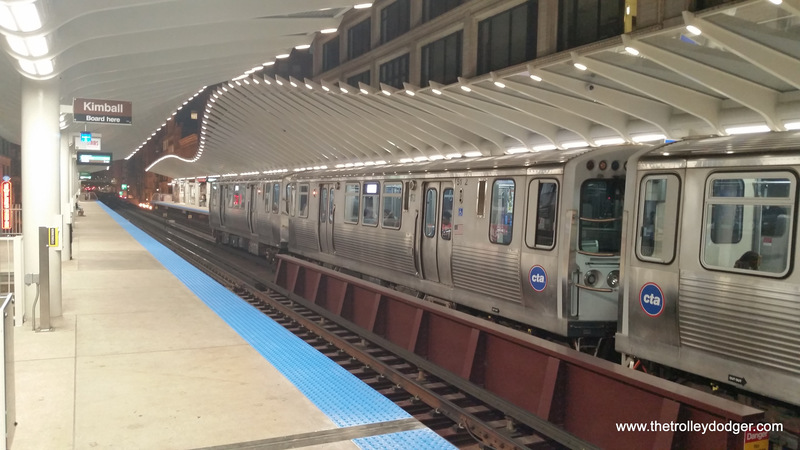 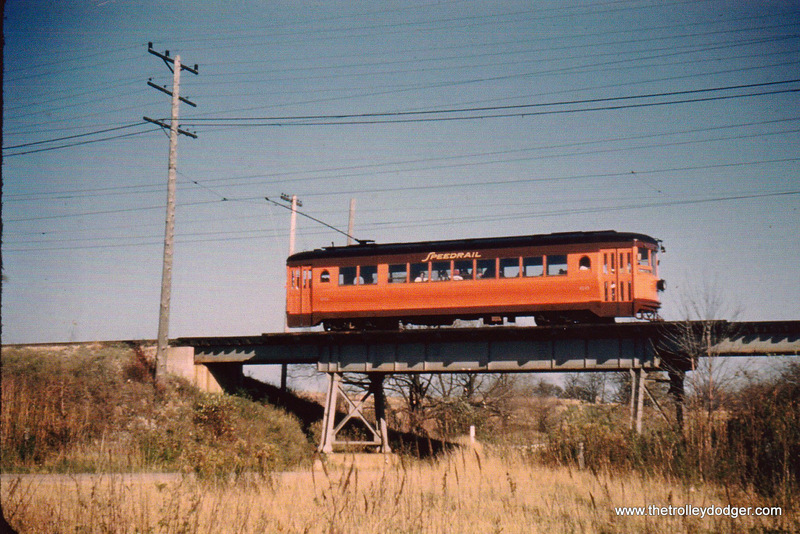 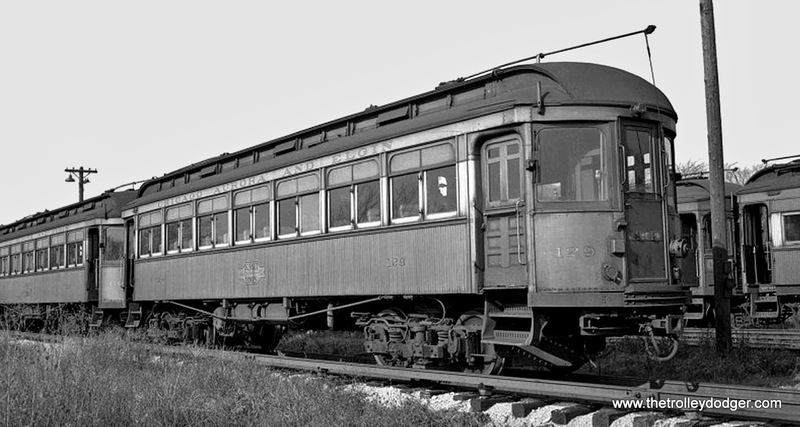 Notice how similar this car is to some operated by the Chicago Surface Lines. 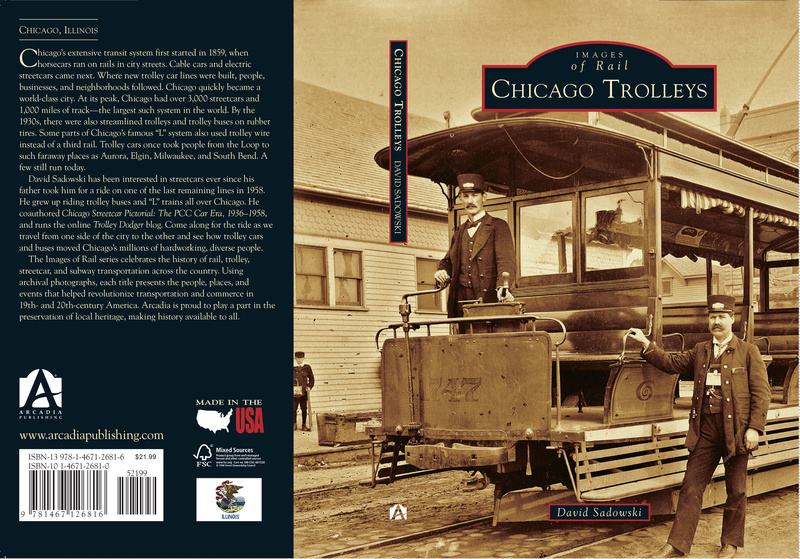 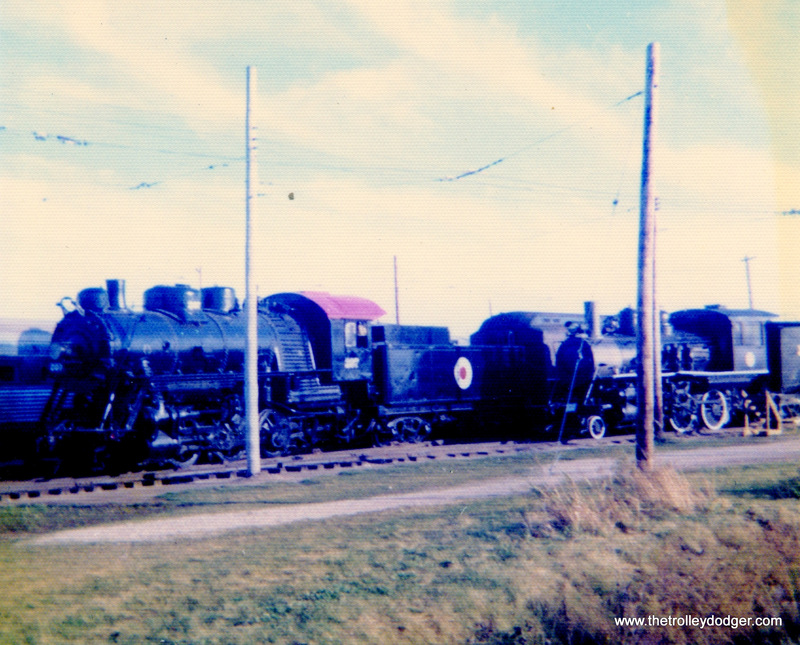 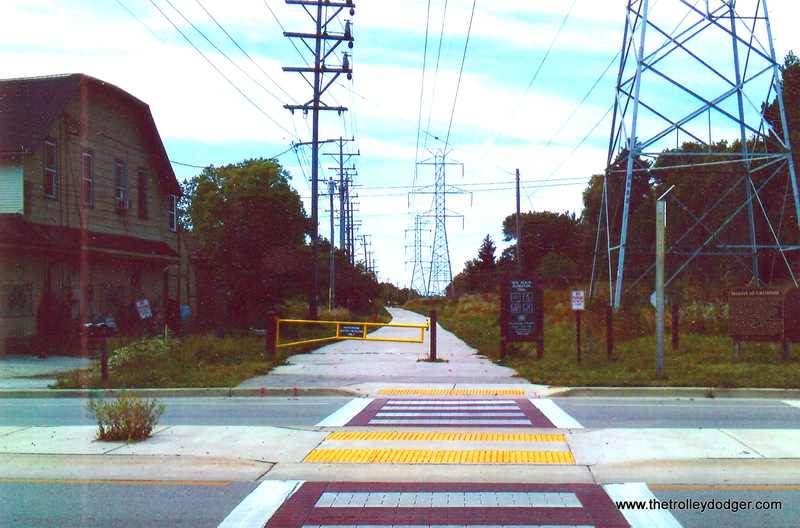 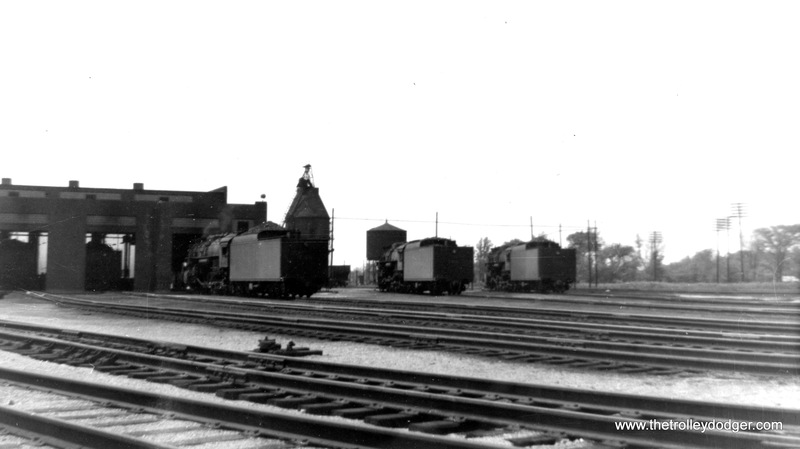 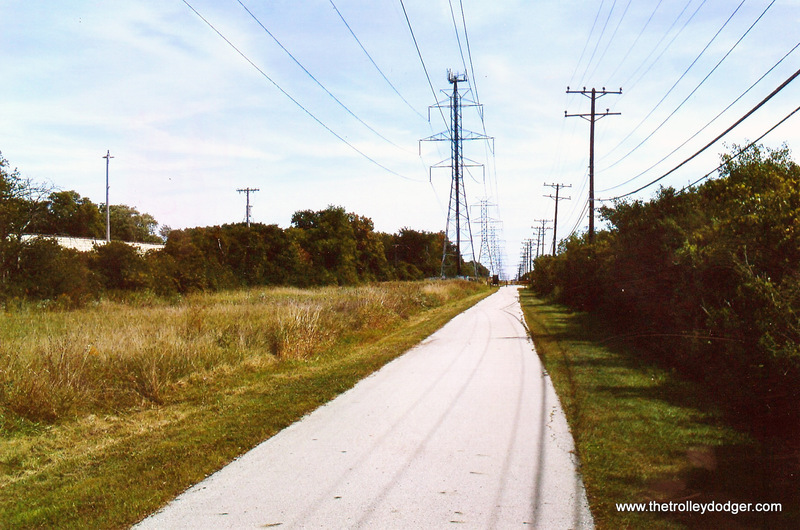 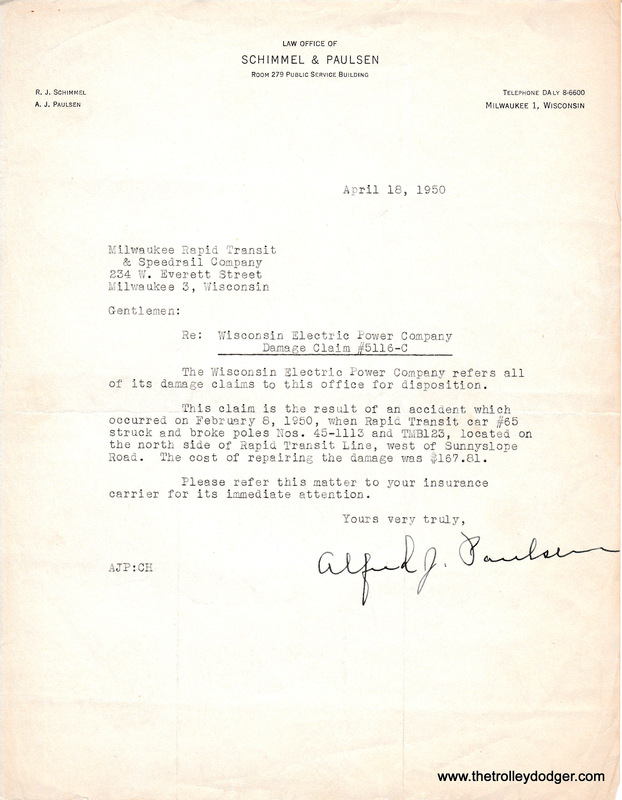 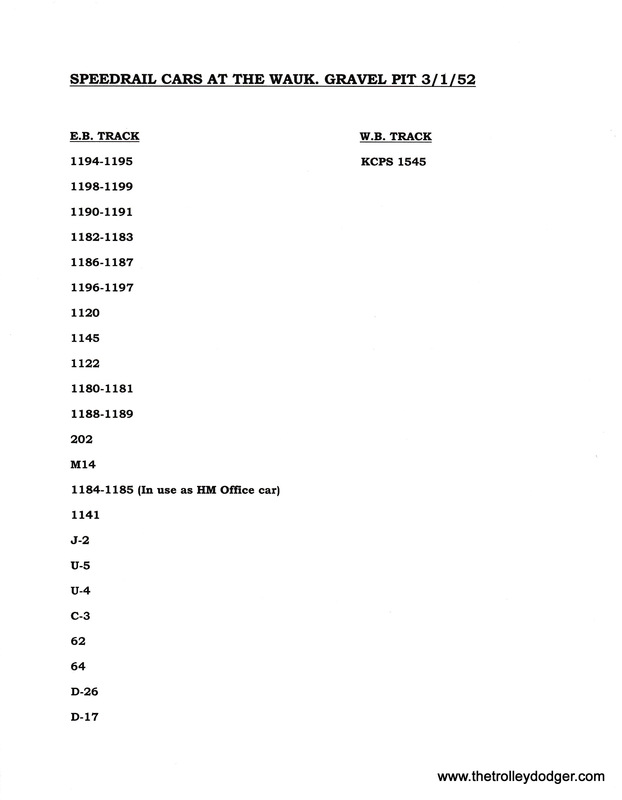 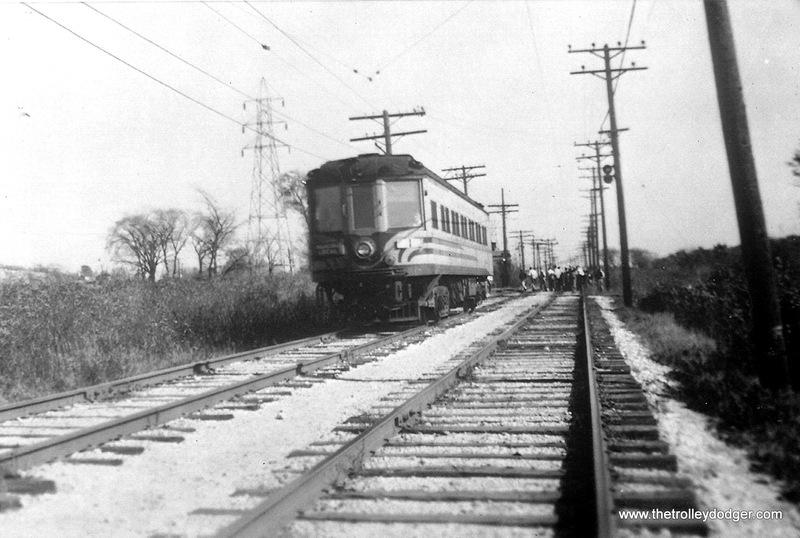 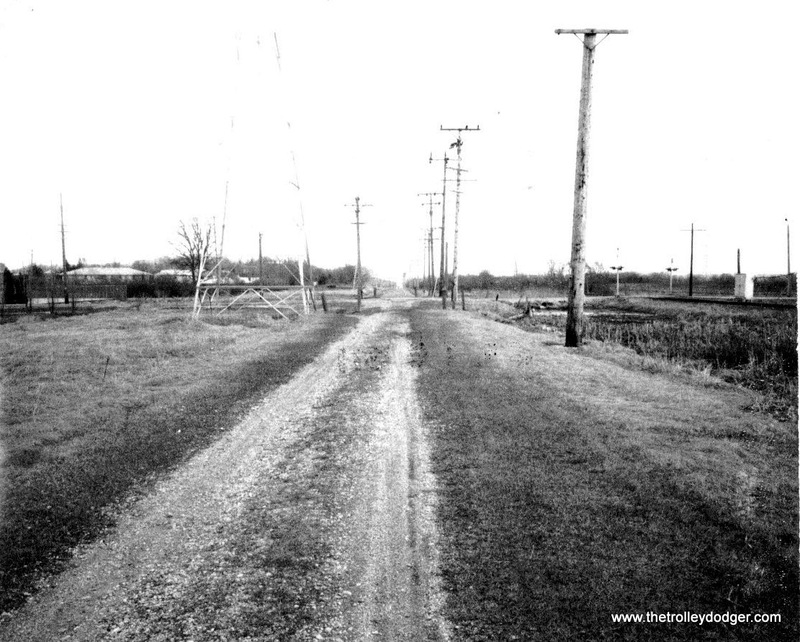 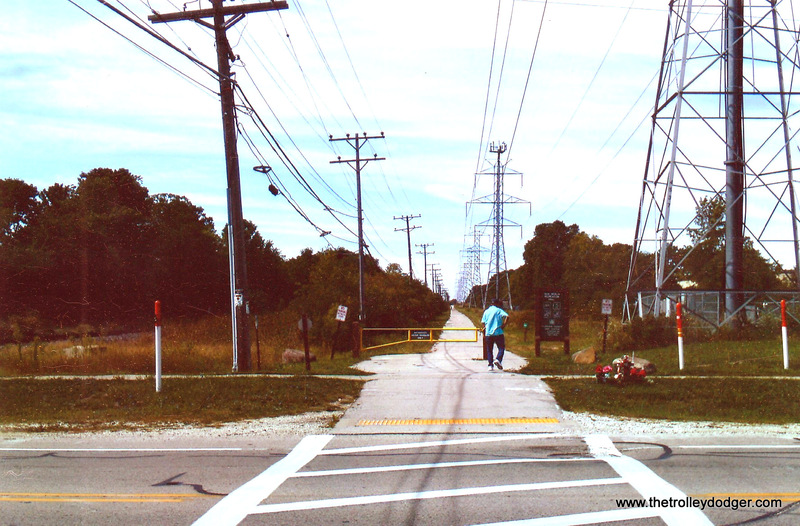 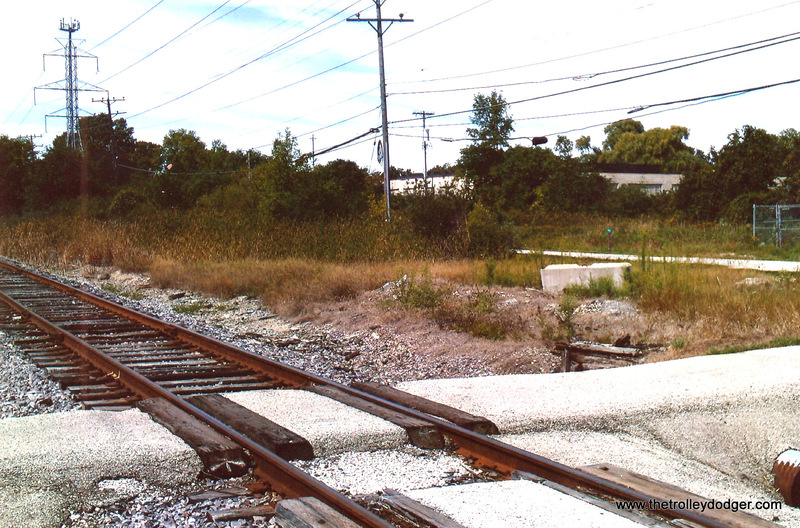 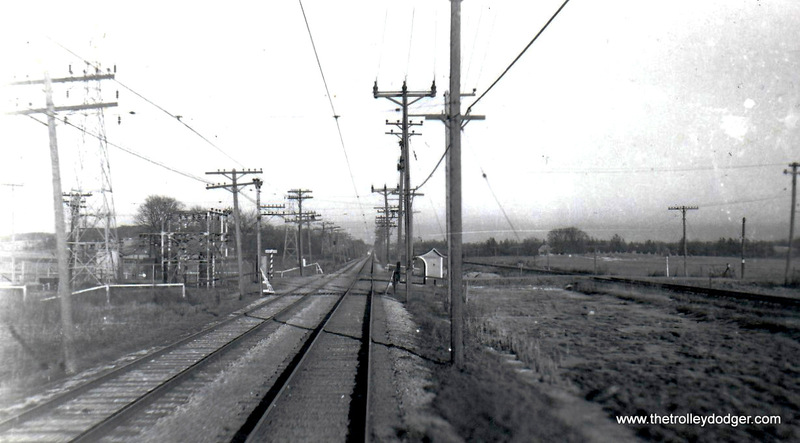 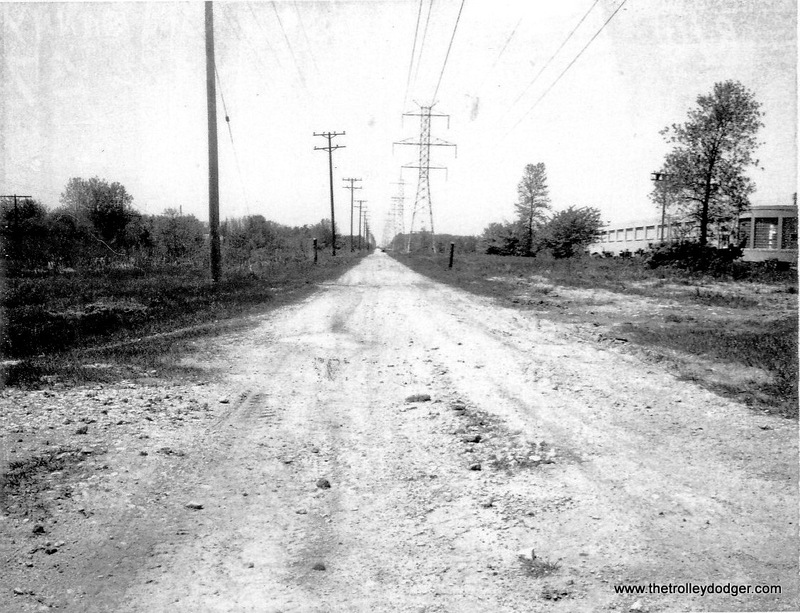 For much of its history, the HW&EC was run by the Calumet & South Chicago Railway, which became part of CSL in 1914. 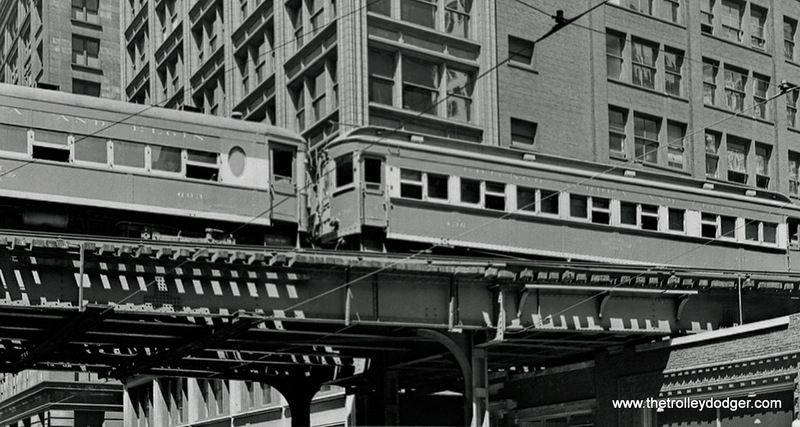 Chicago Surface Lines crane X-3 at Dearborn and Washington in 1942. 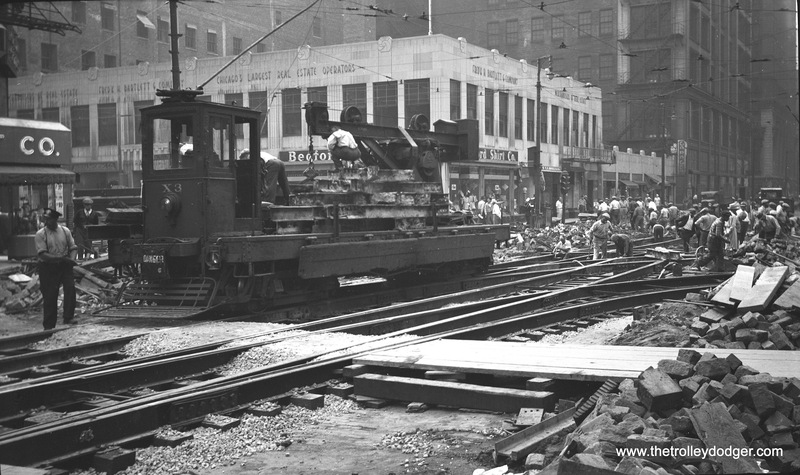 Tracks were being put back in the street after construction of the Dearborn Subway, which was 80% completed when work stopped due to wartime materials shortages. 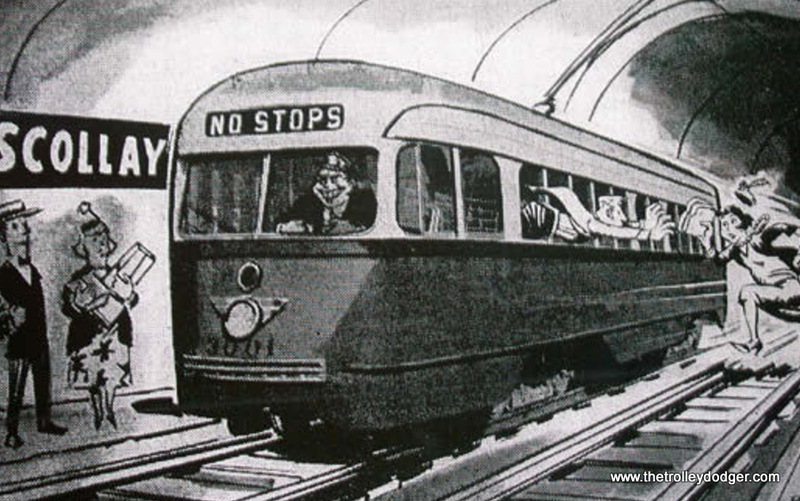 The subway did not open until 1951. 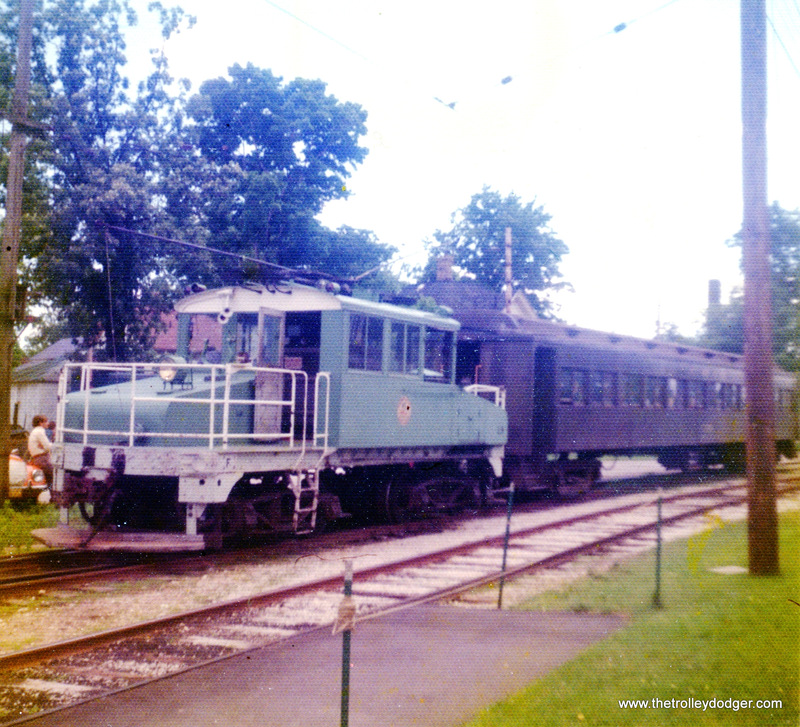 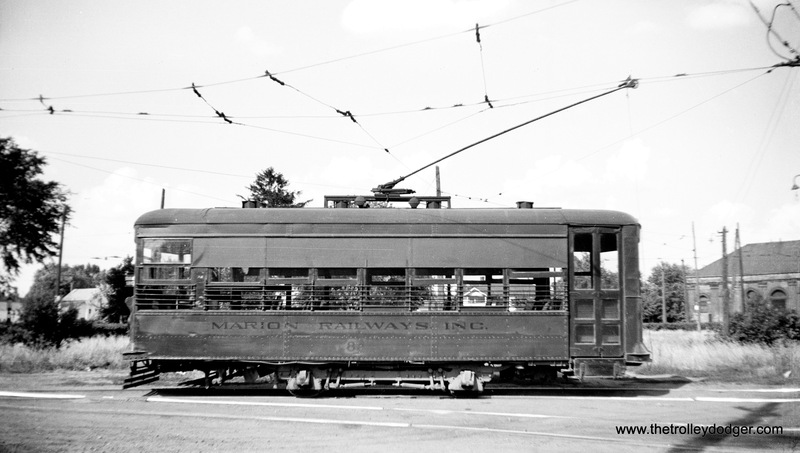 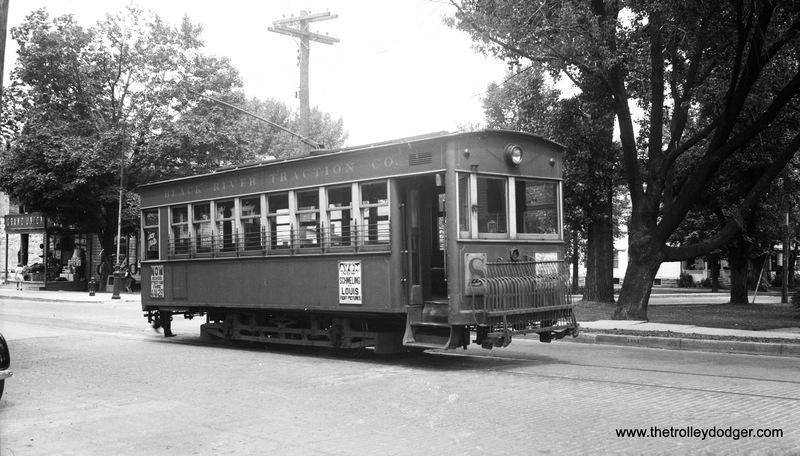 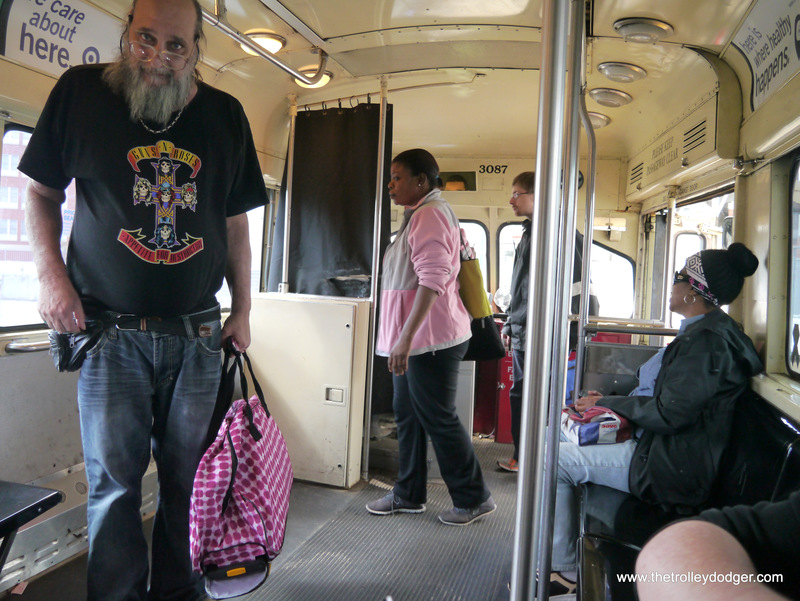 This odd, boxy streetcar is Black River Traction car #1 in Watertown, New York. 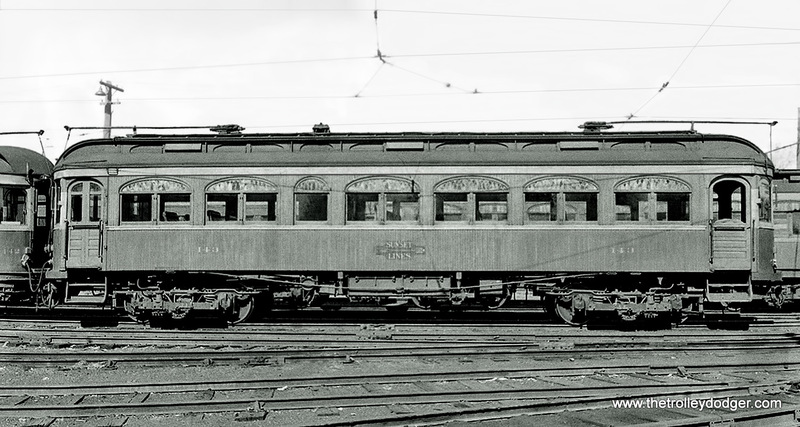 This was a 1906 product of the Barber Car Co. 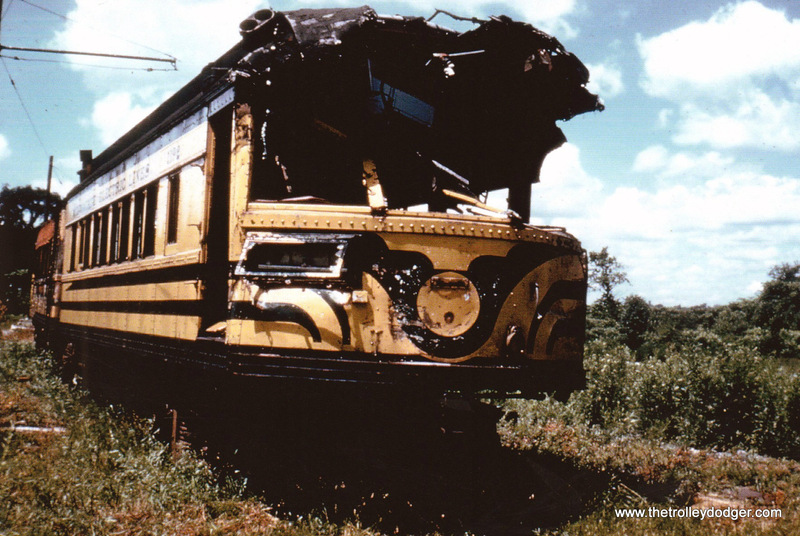 Some consider this an ugly design, but apparently these cars were well-built. 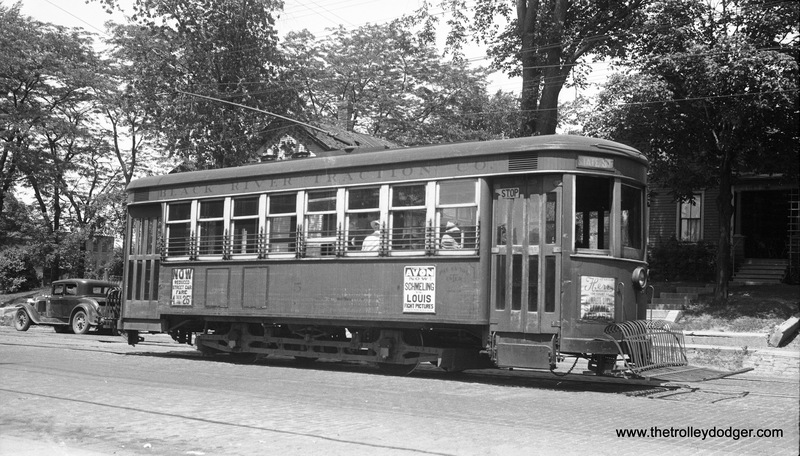 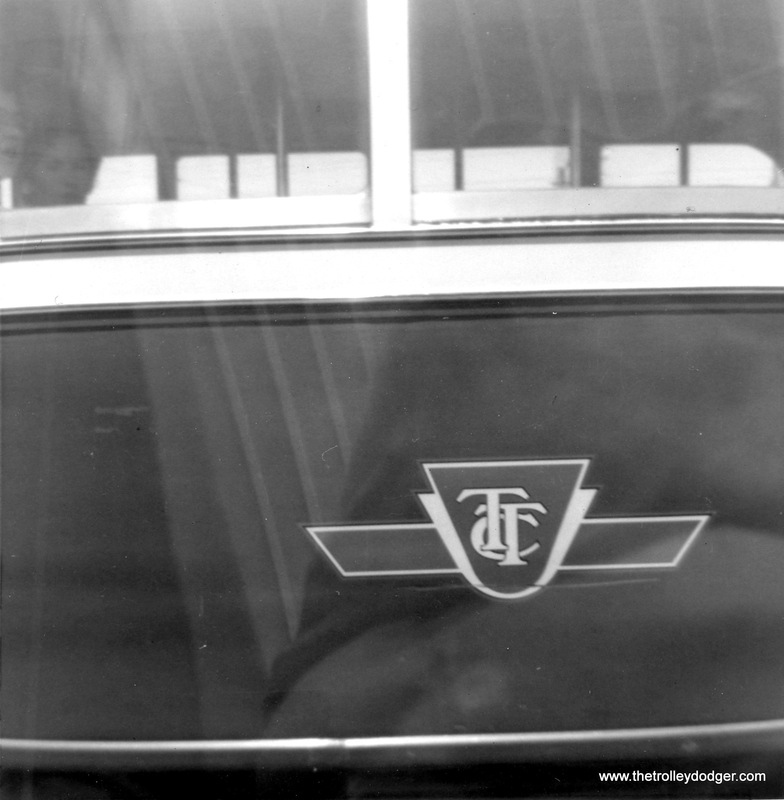 Apparently this line abandoned streetcar service on August 17, 1937, but this negative is dated June 20, 1938. 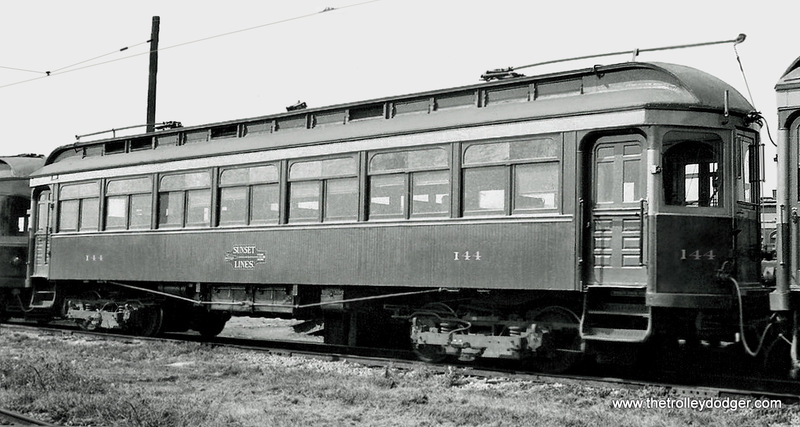 The sign on the side of the car doesn’t really solve this mystery– there were two championship heavyweight bouts between Joe Louis and Max Schmeling, and these took place on June 19, 1936 and June 22, 1938. 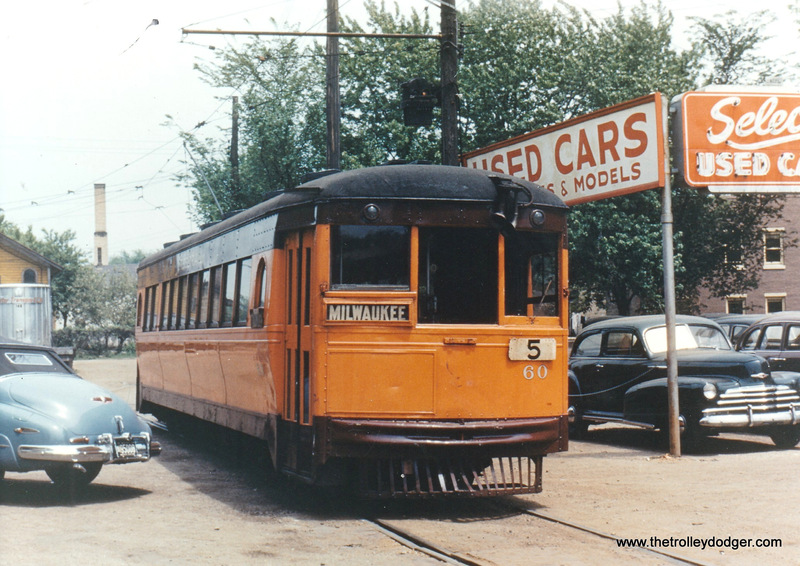 For more information on the Barber Car Company, click here. 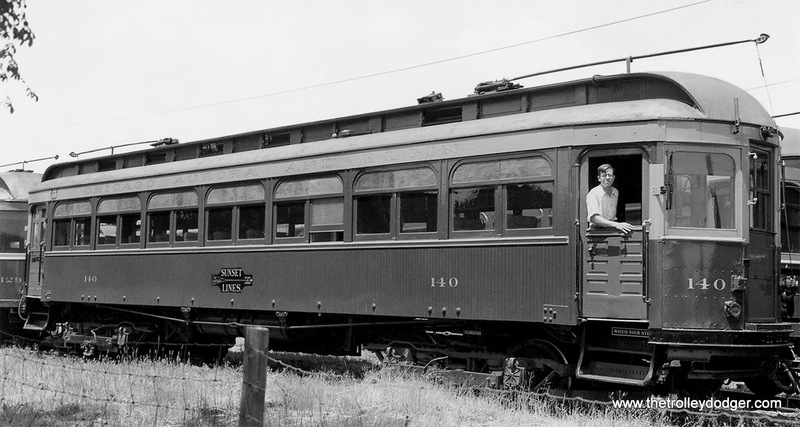 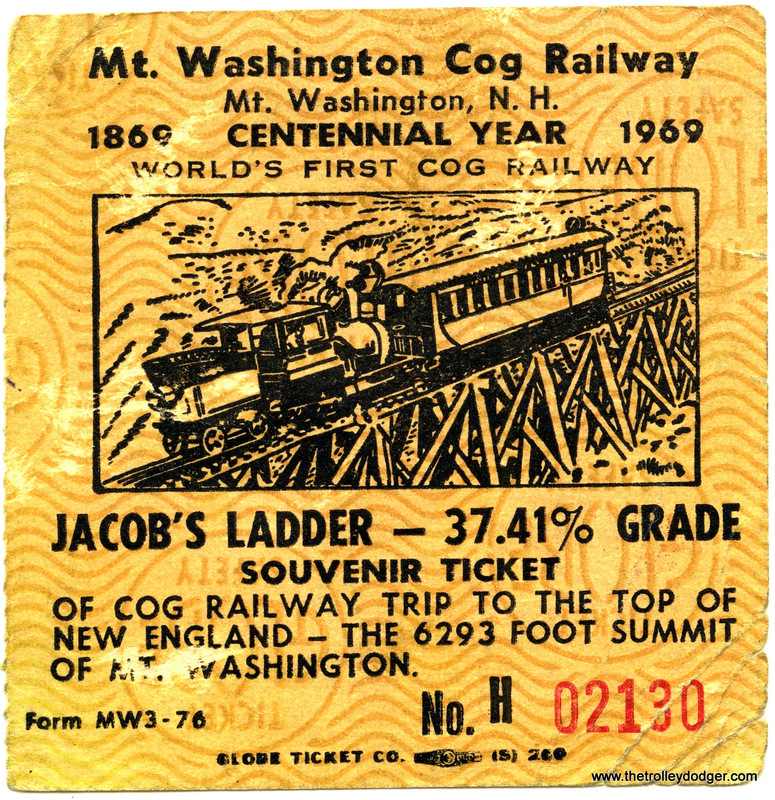 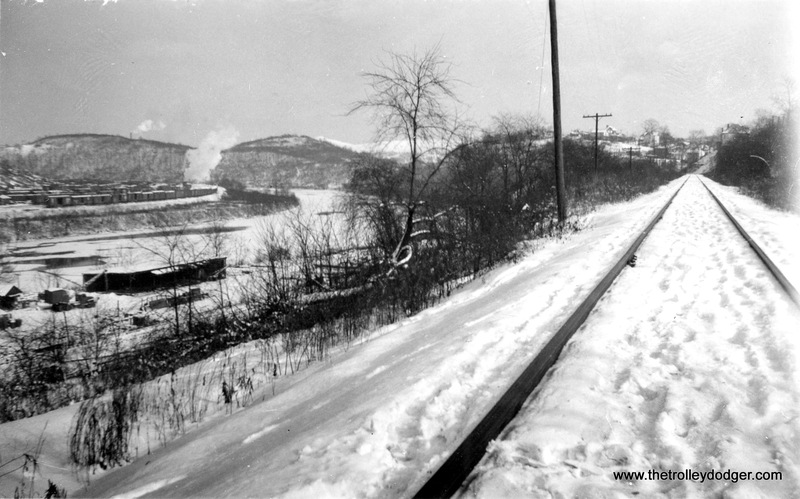 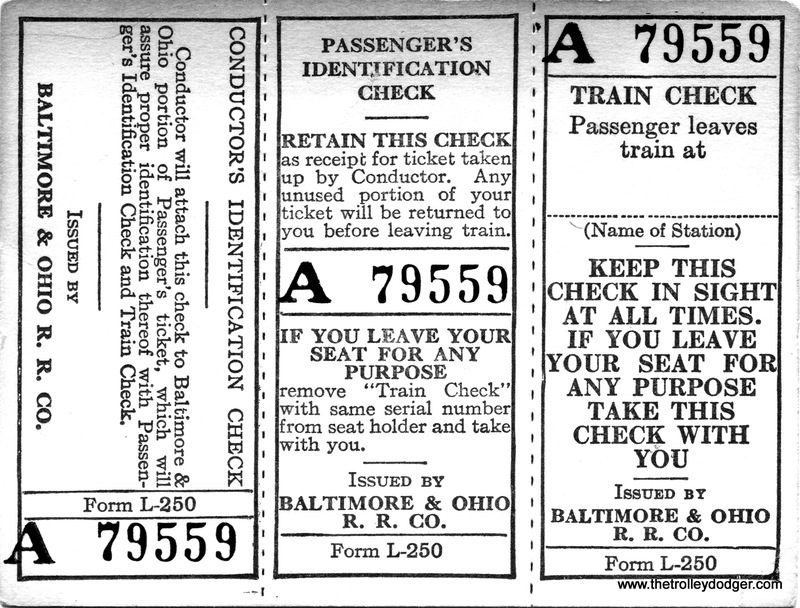 Black River Traction car 5, with a date given of June 20, 1938. 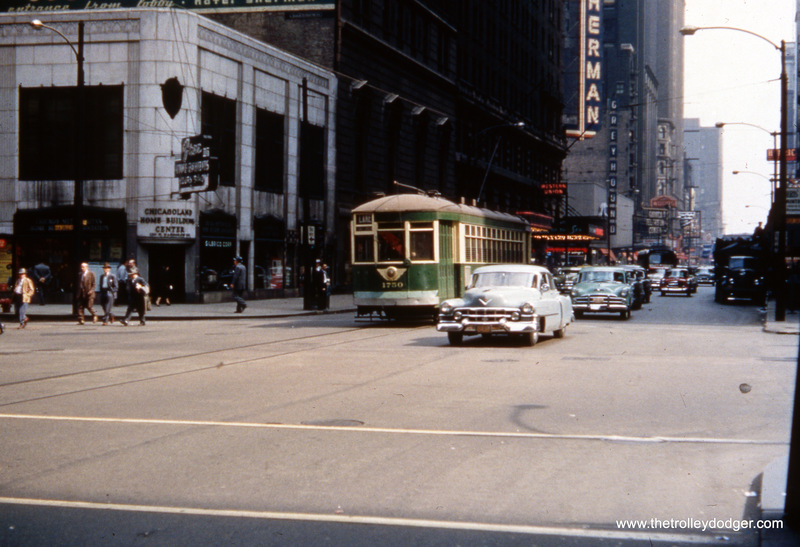 Not sure whether this car was also built by the Barber Car Company. 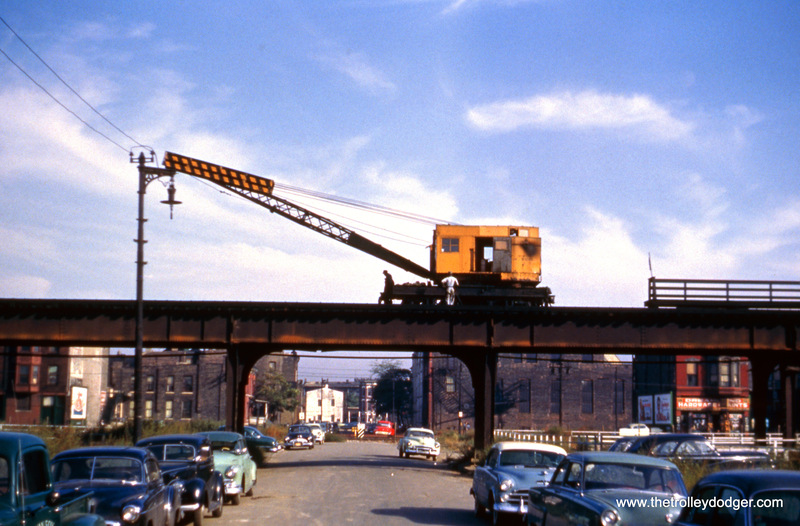 I recently came across this photo, and, after looking at it awhile I realized that this is an image of the CA&E crossing the Chicago River. 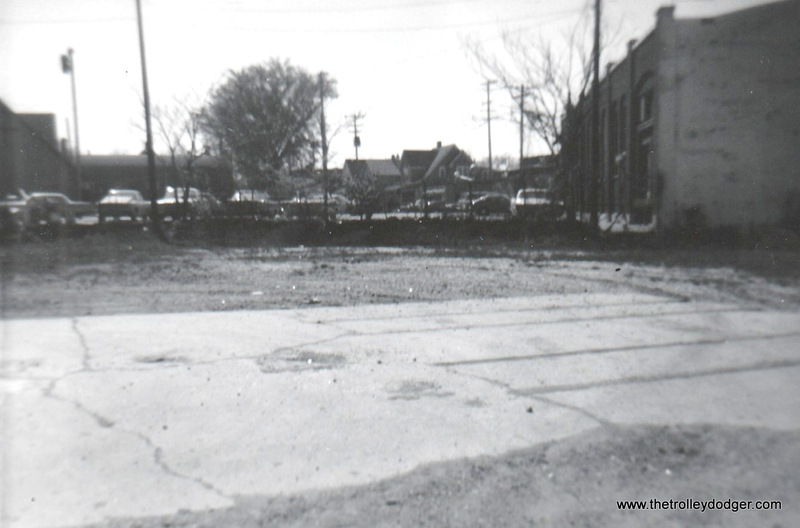 It appears to have been taken from Franklin Street looking generally northeast. 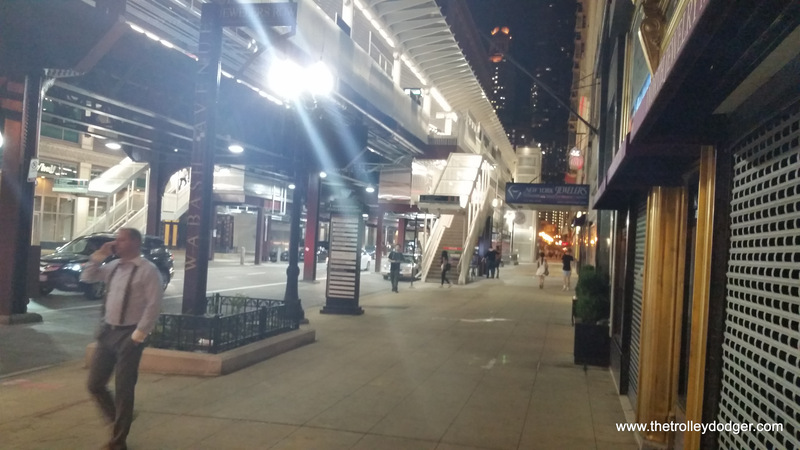 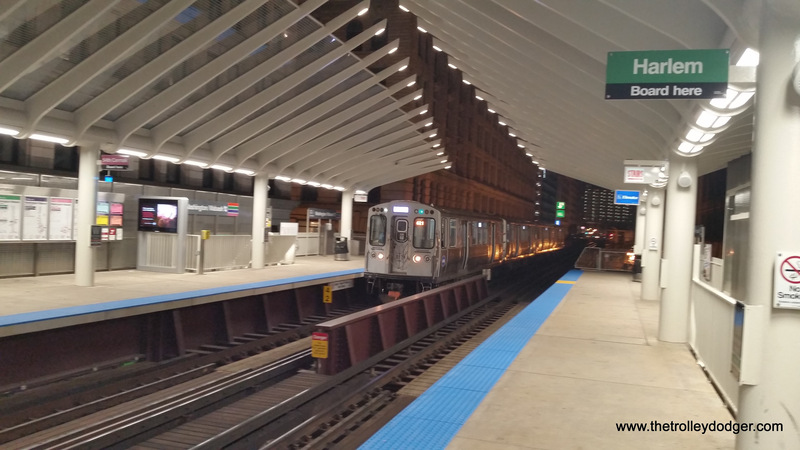 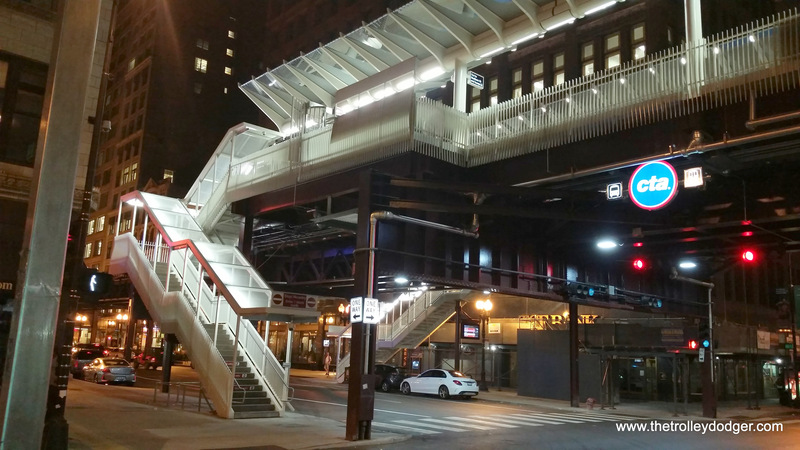 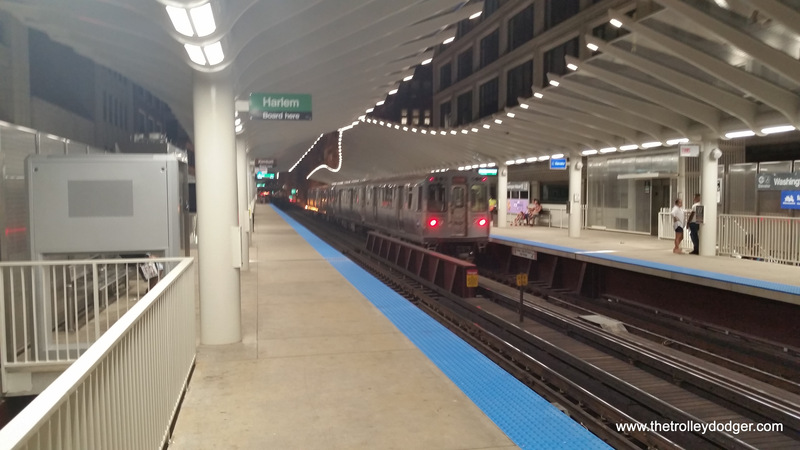 The train appears to be an eastbound train just entering the Wells Street Terminal. 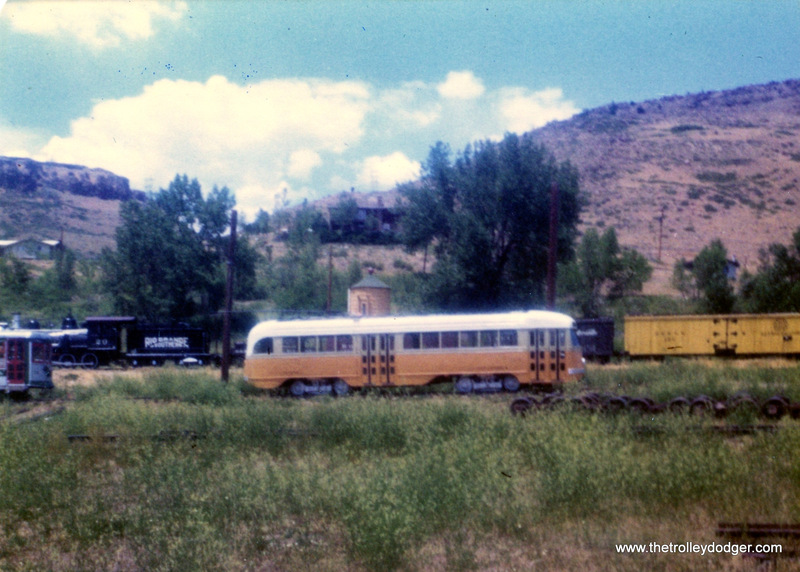 Look at the two cars and you’ll see Car 436 leading trailer 603. 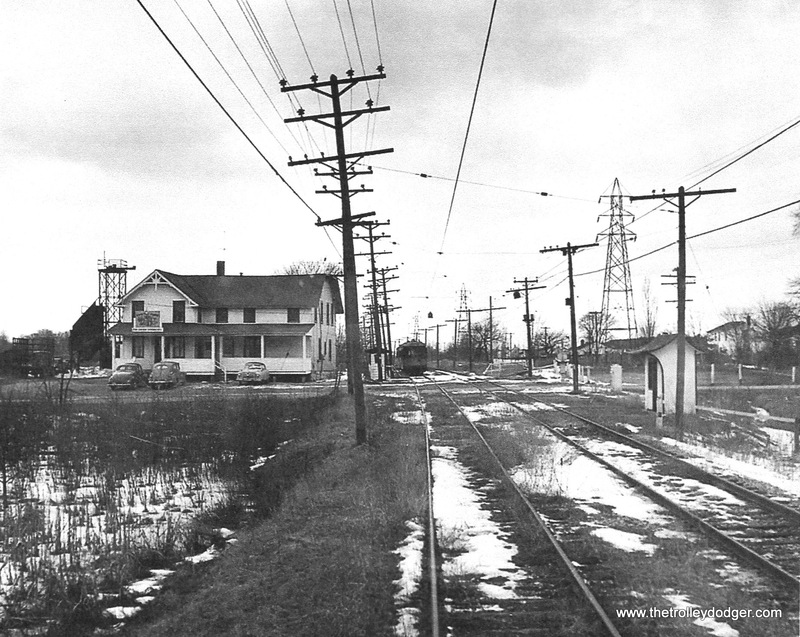 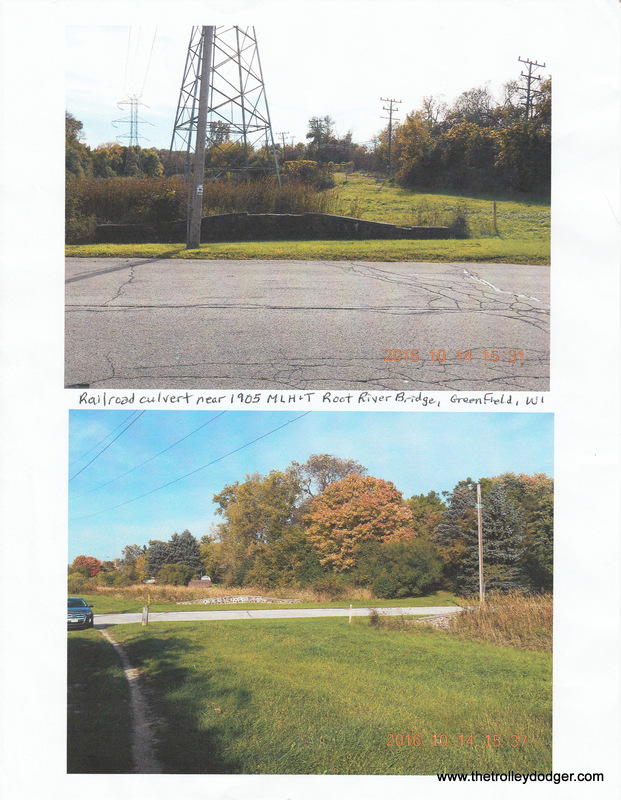 In addition, below the El structure there is the substation that provided the power for the terminal area. 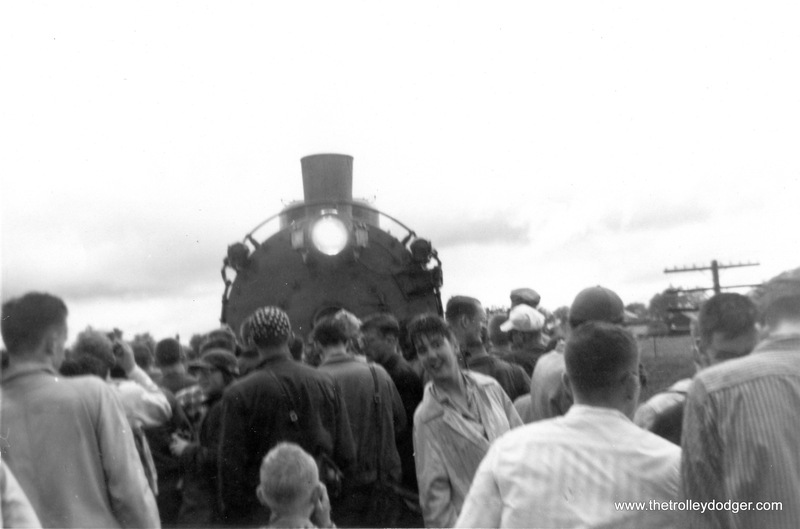 The picture was taken in 1939. 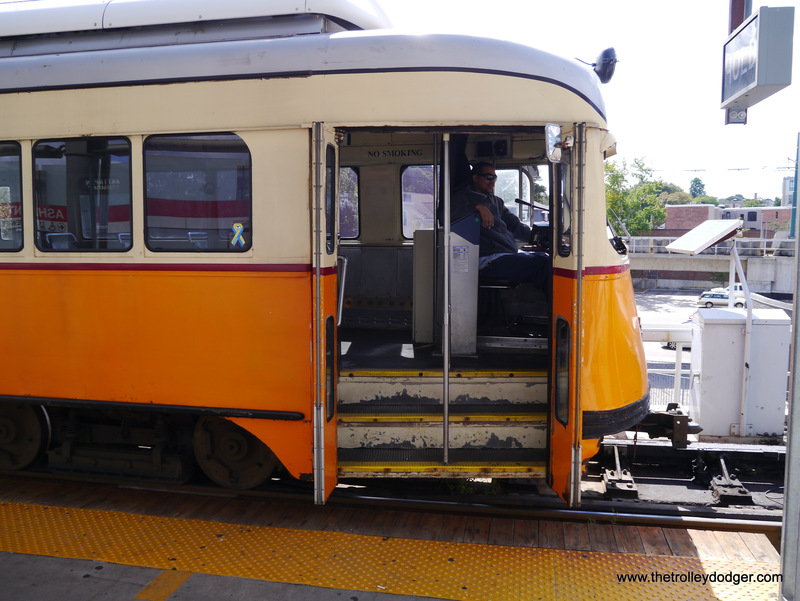 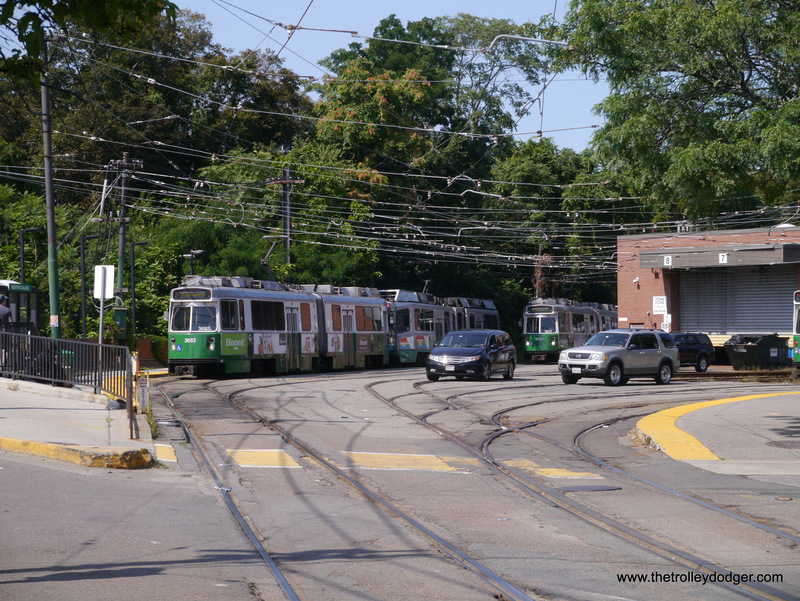 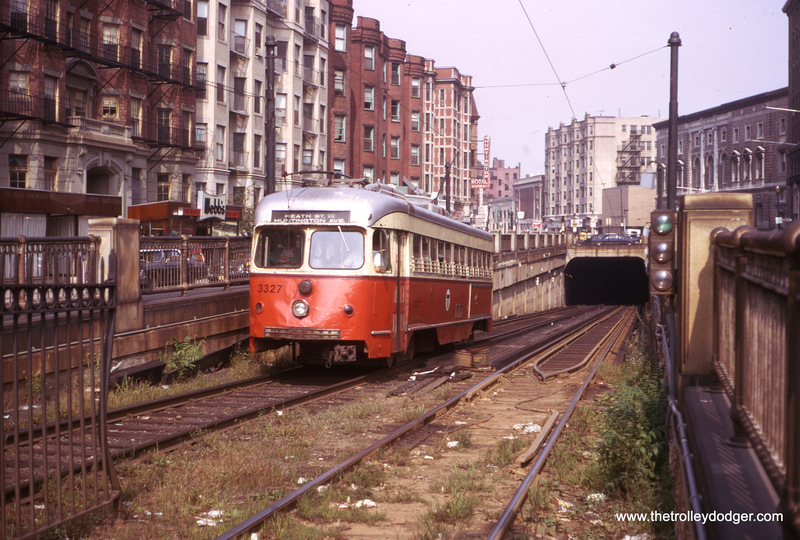 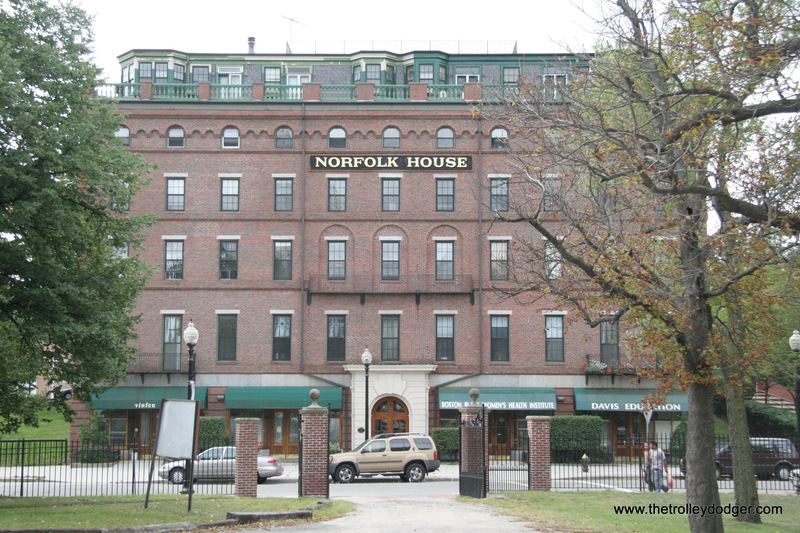 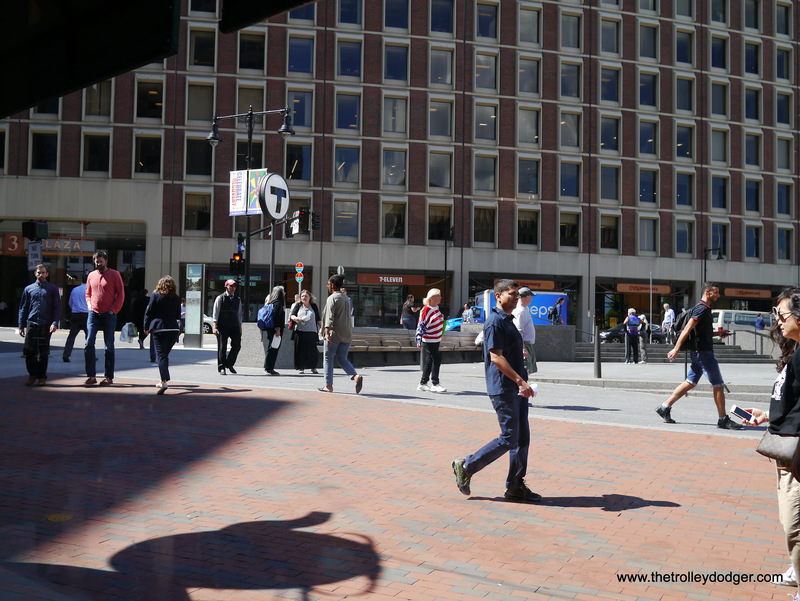 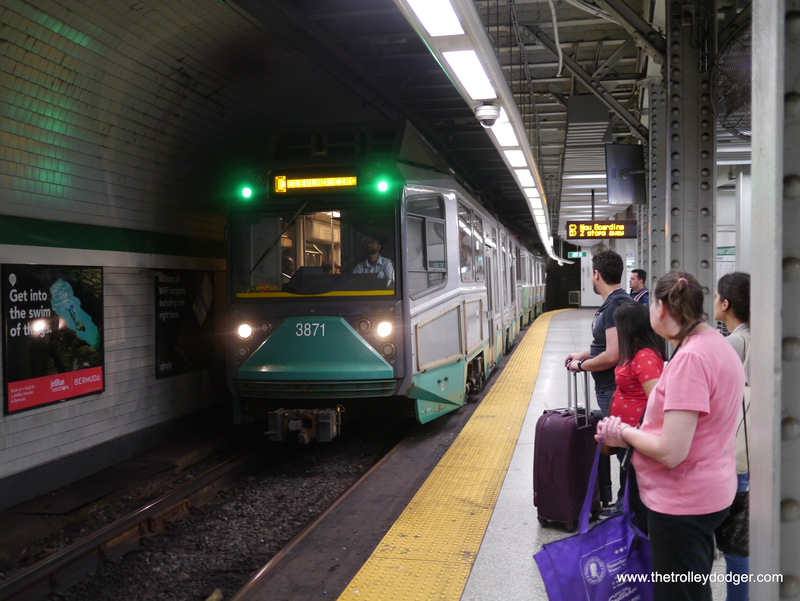 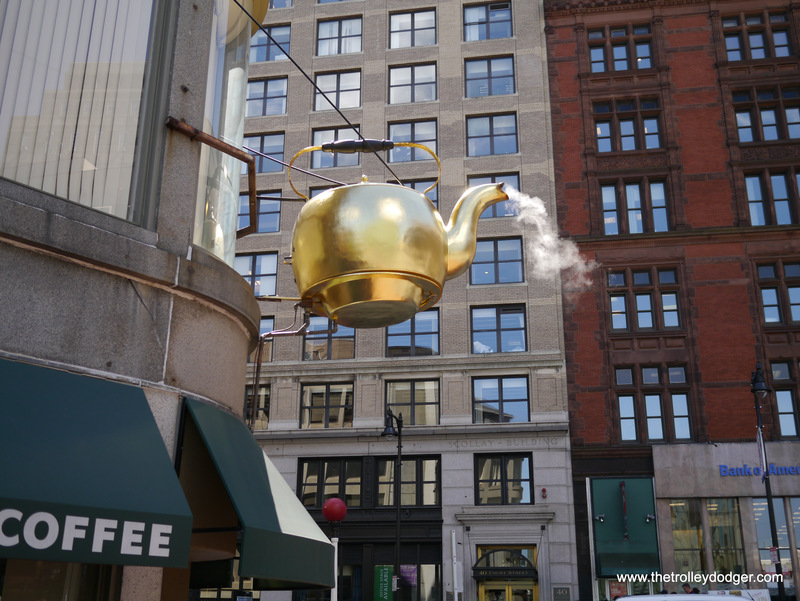 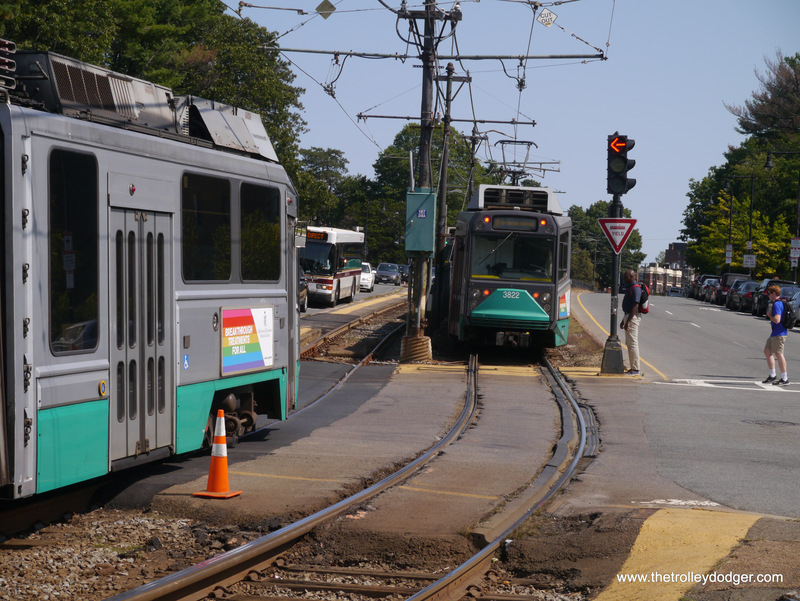 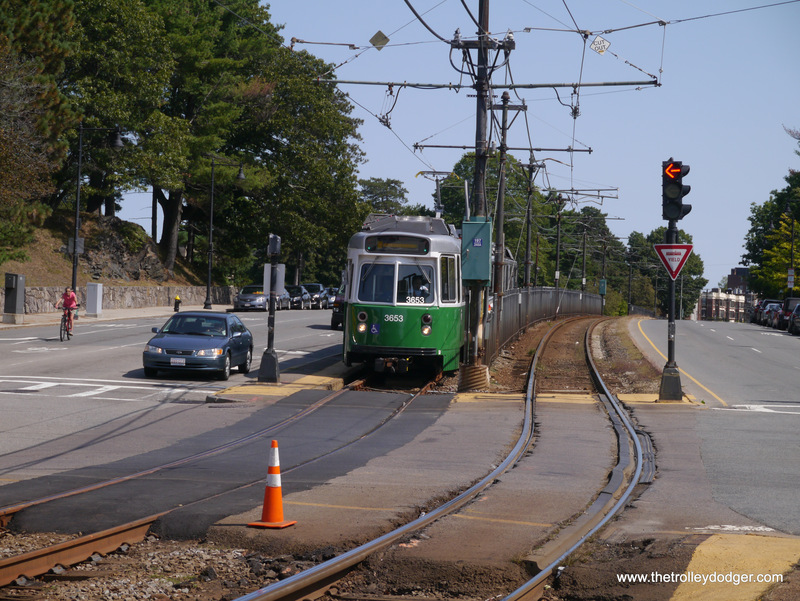 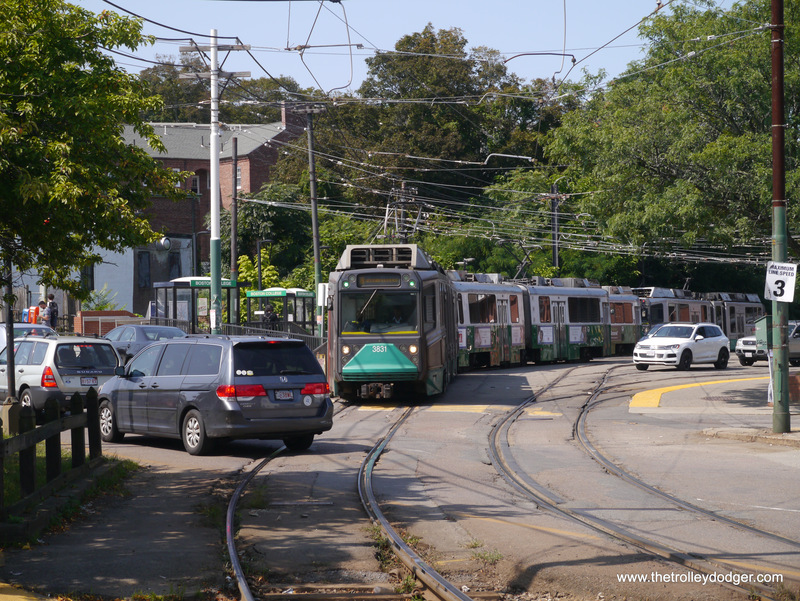 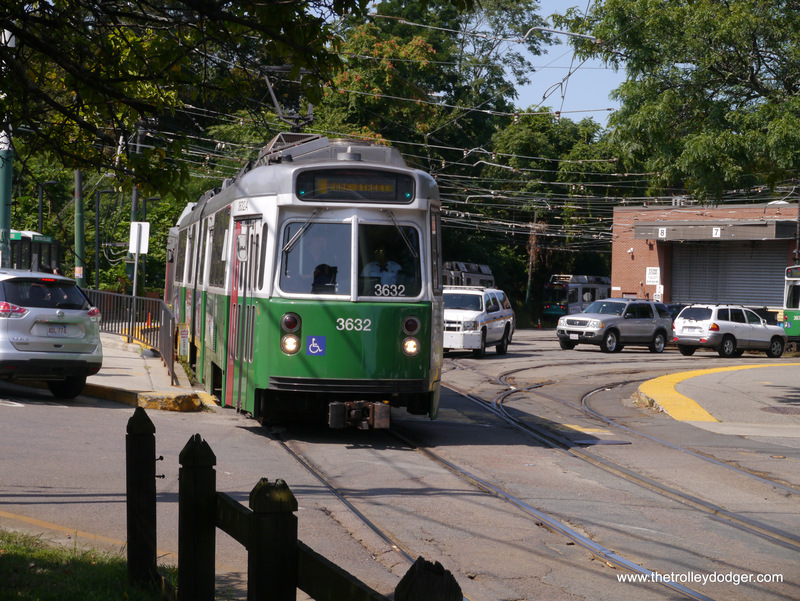 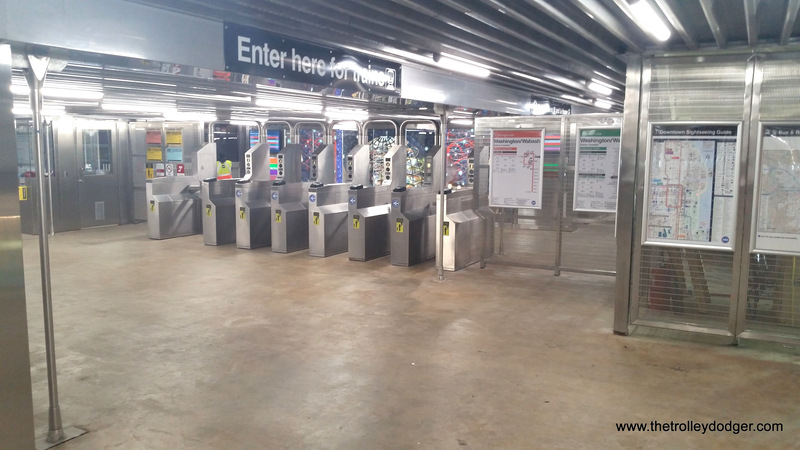 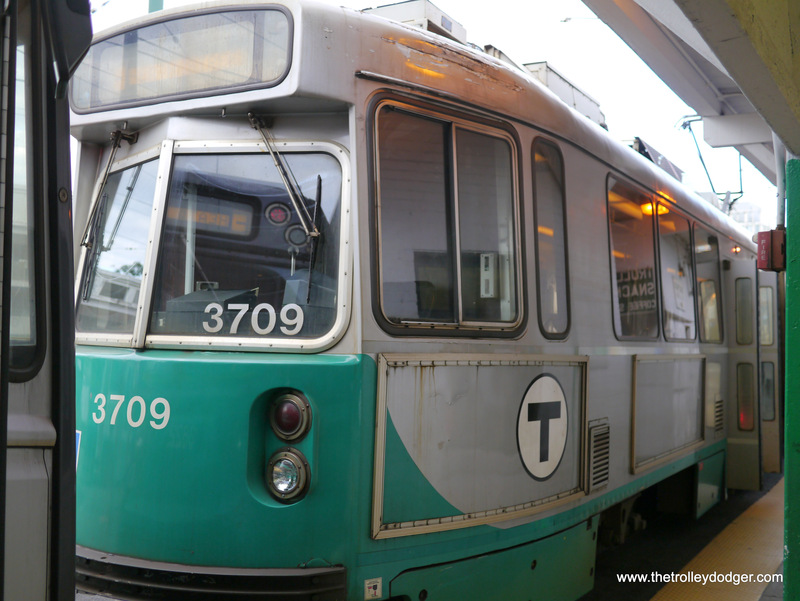 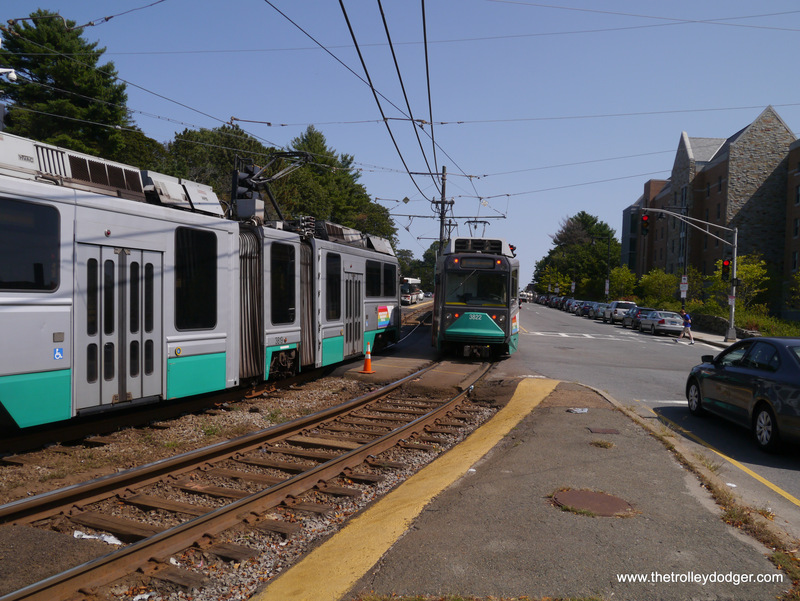 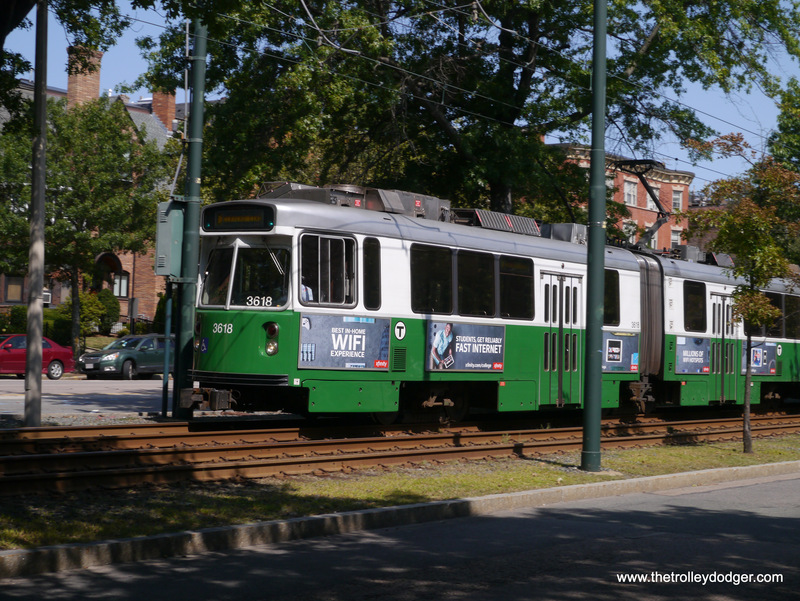 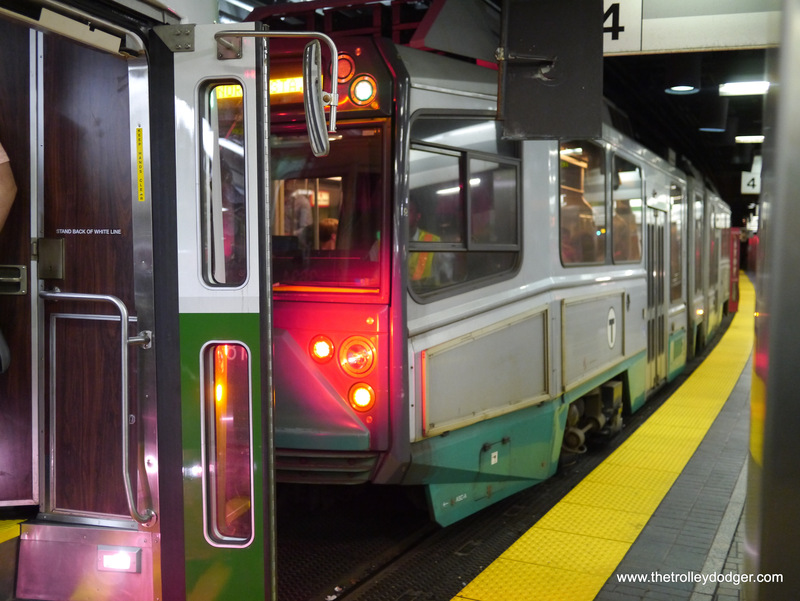 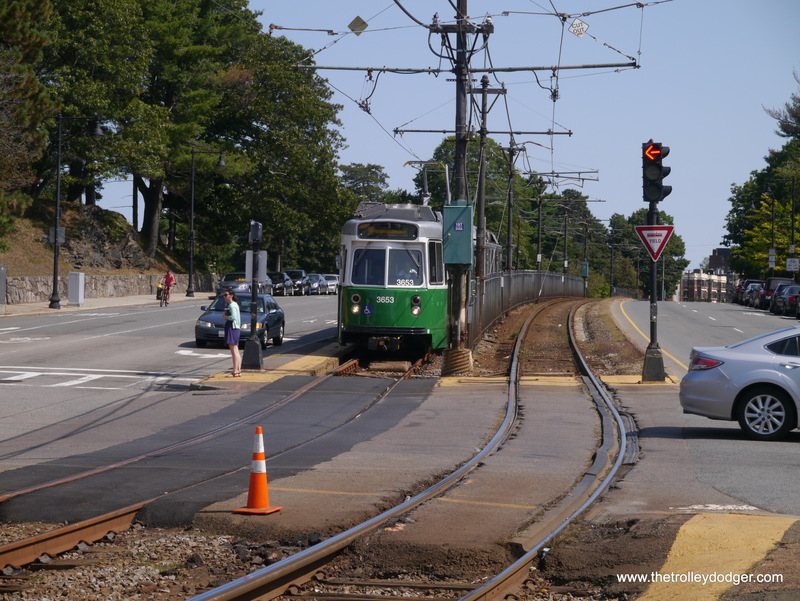 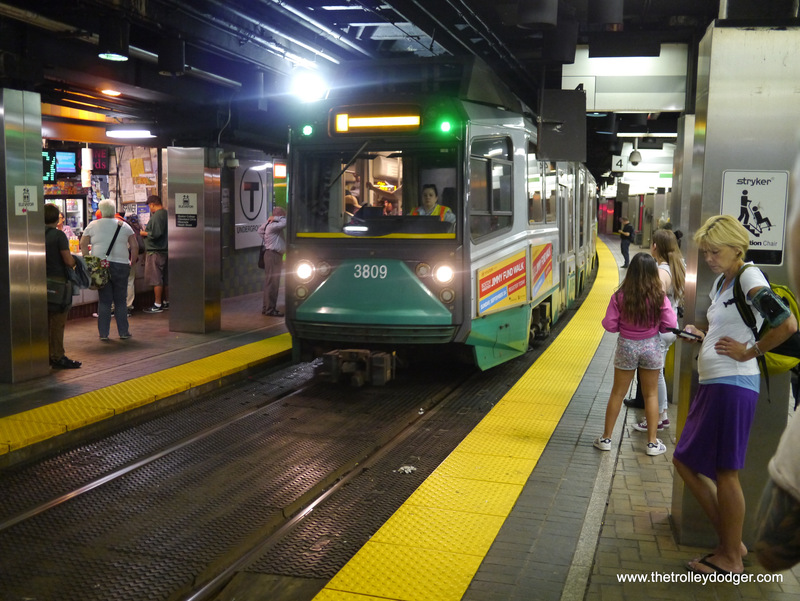 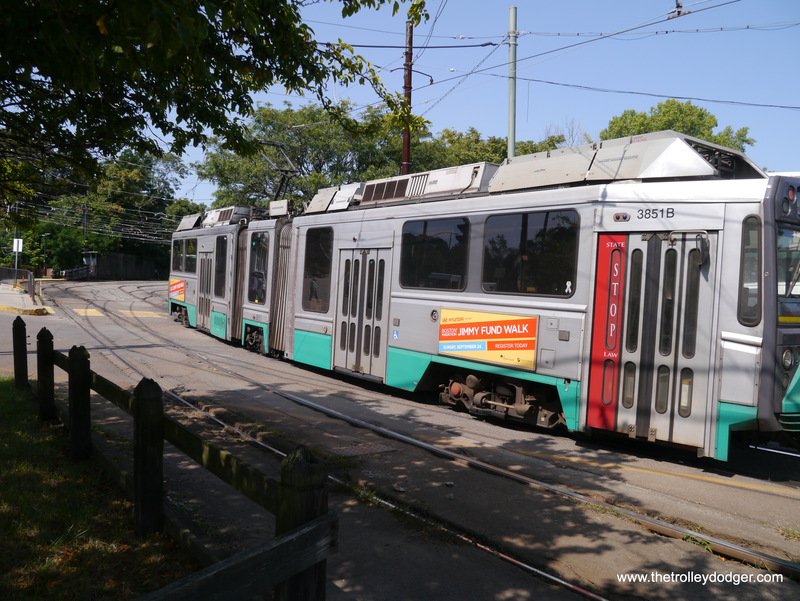 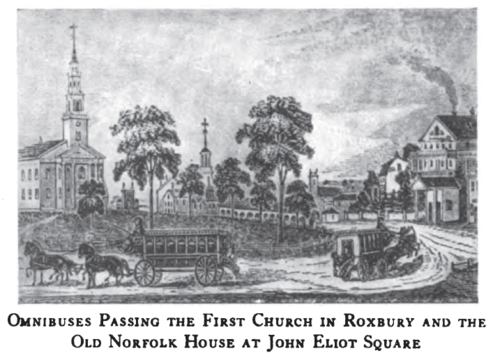 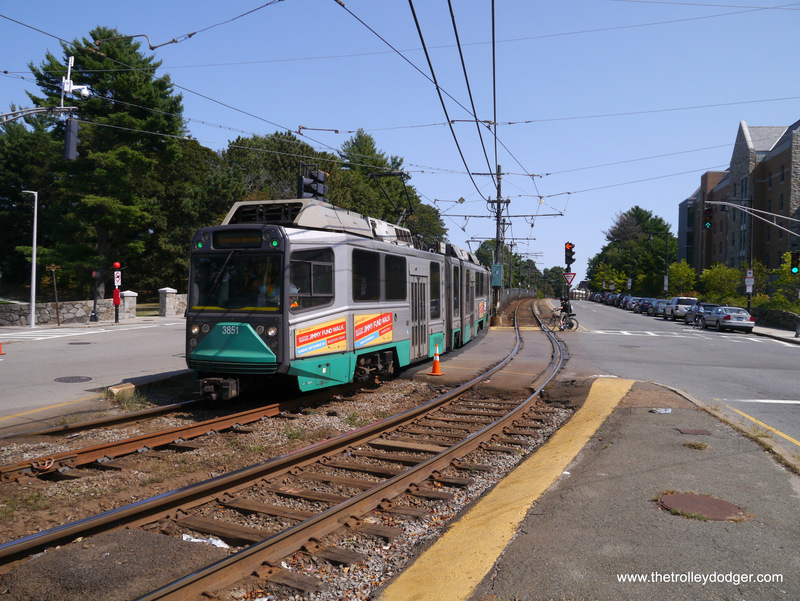 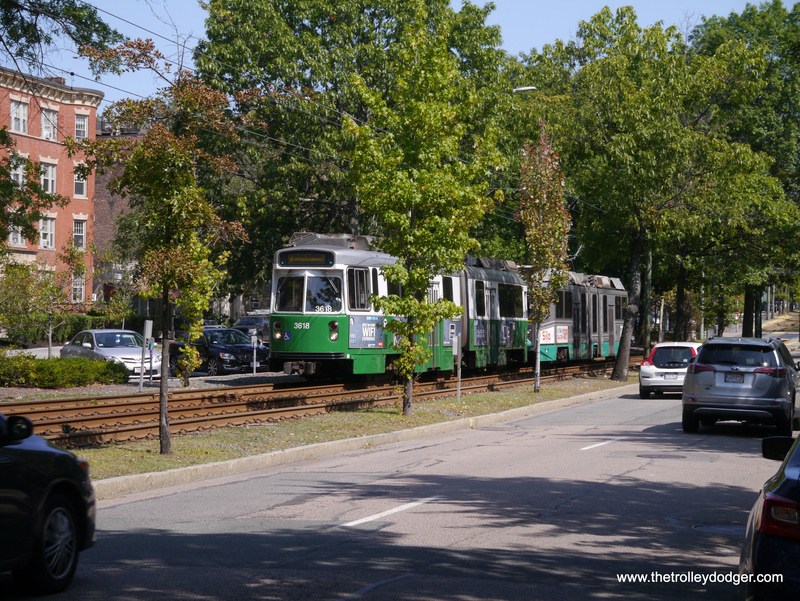 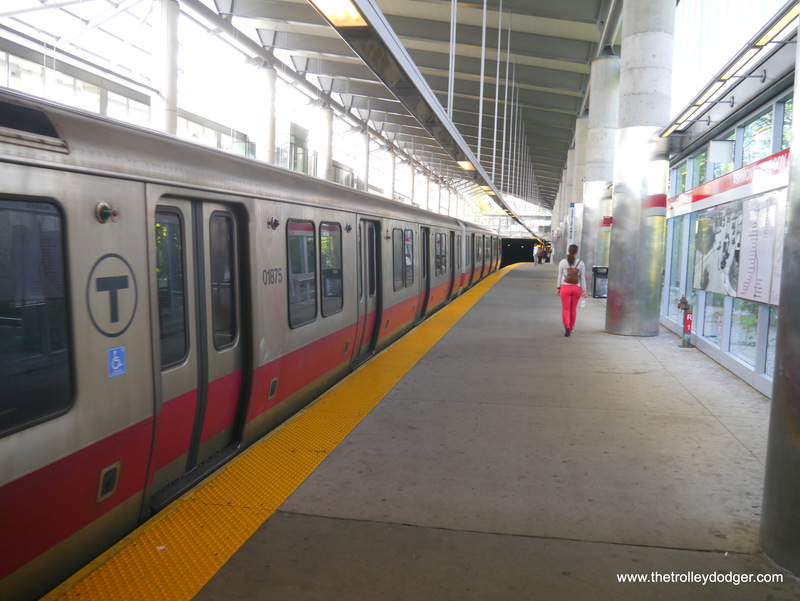 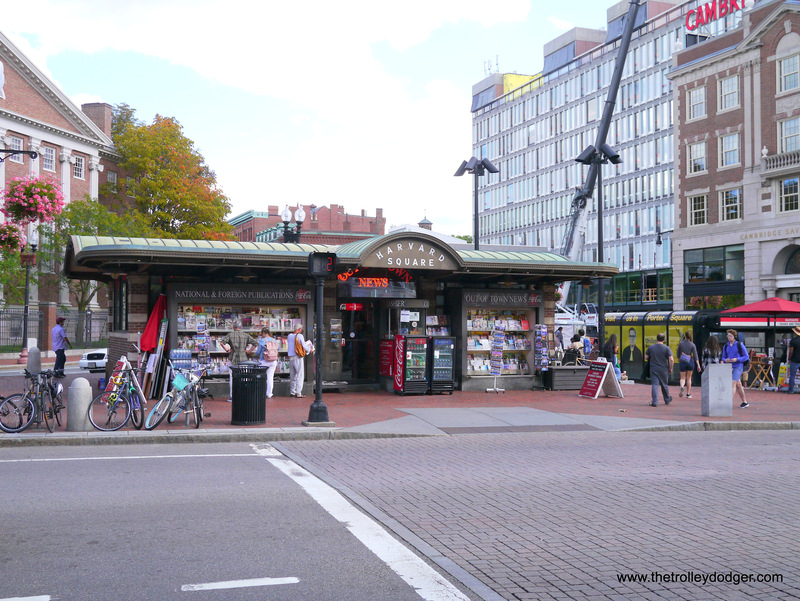 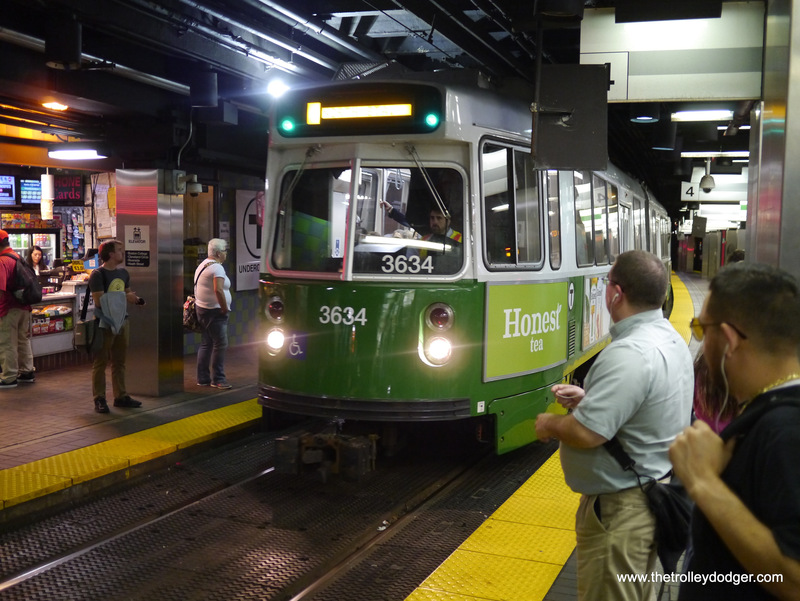 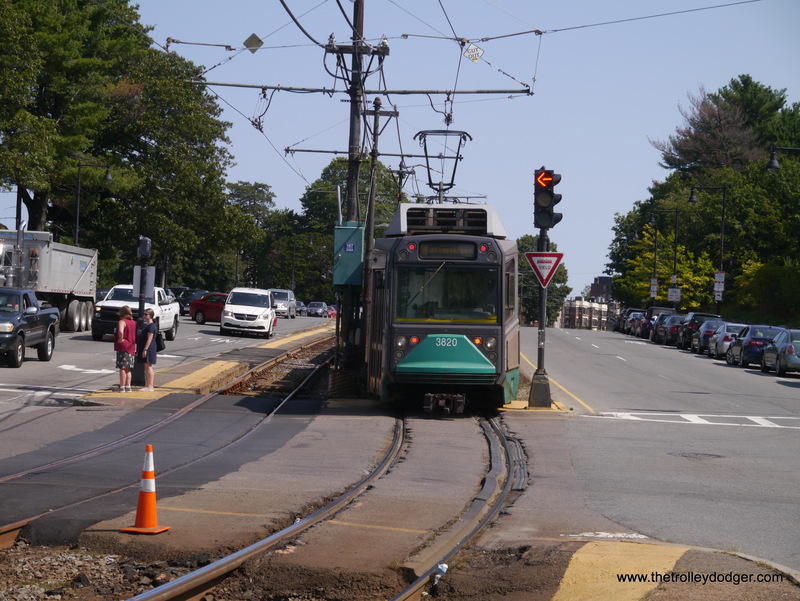 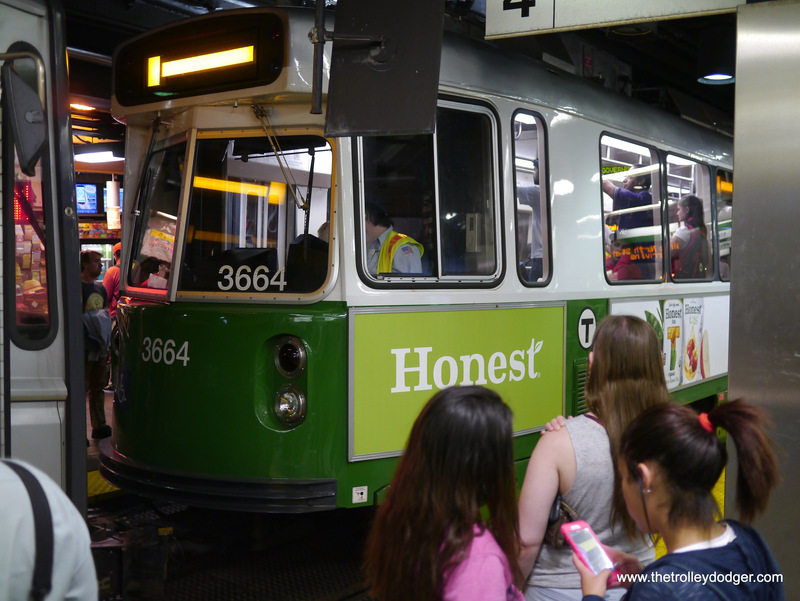 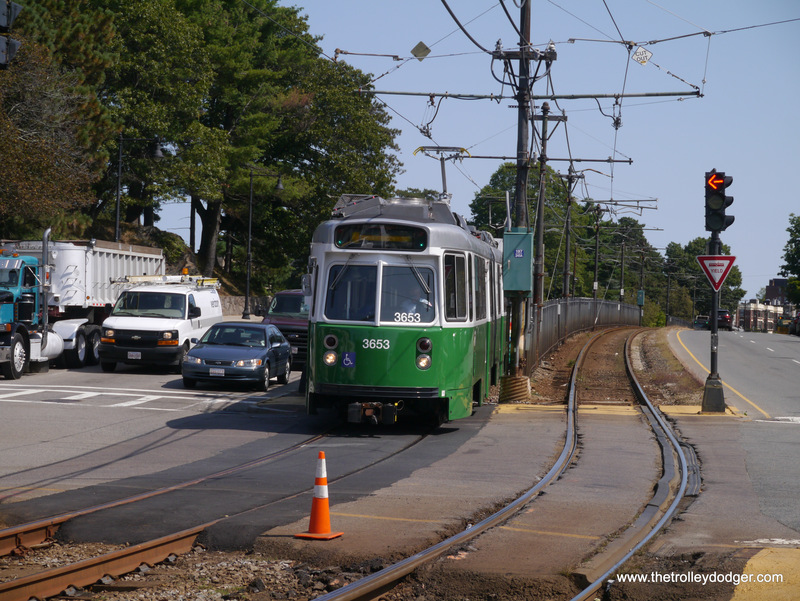 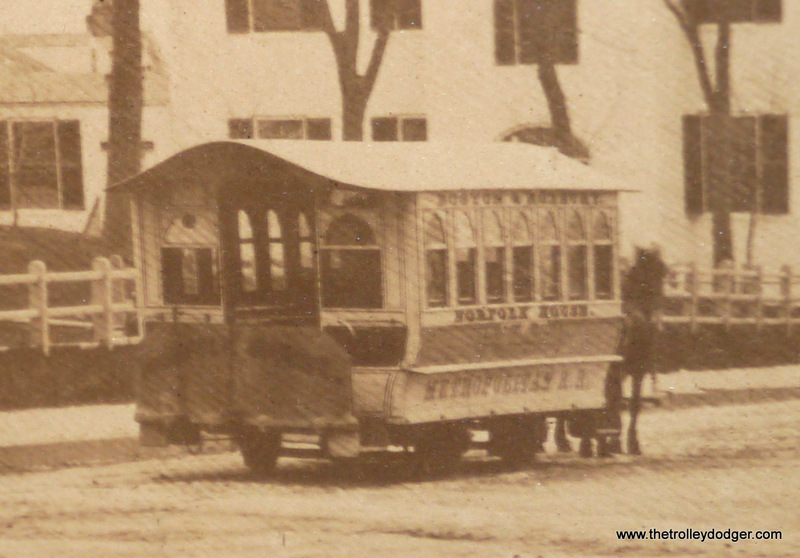 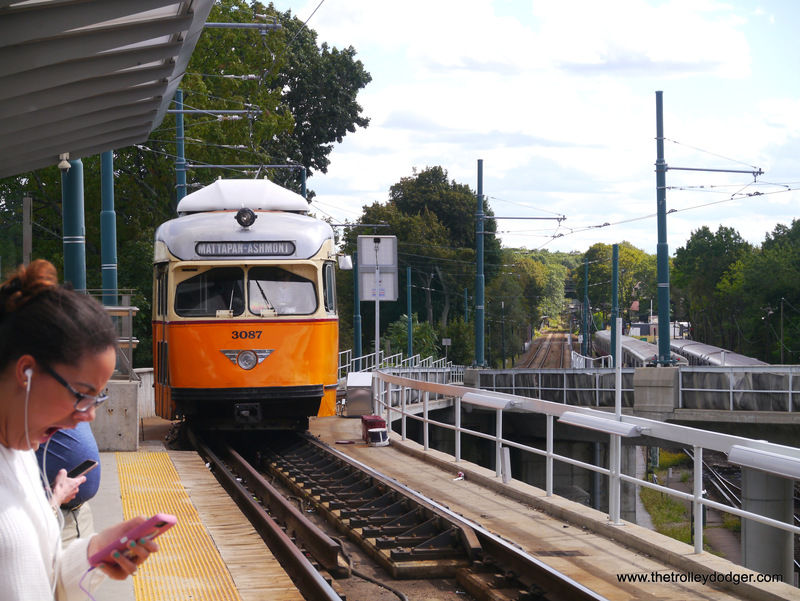 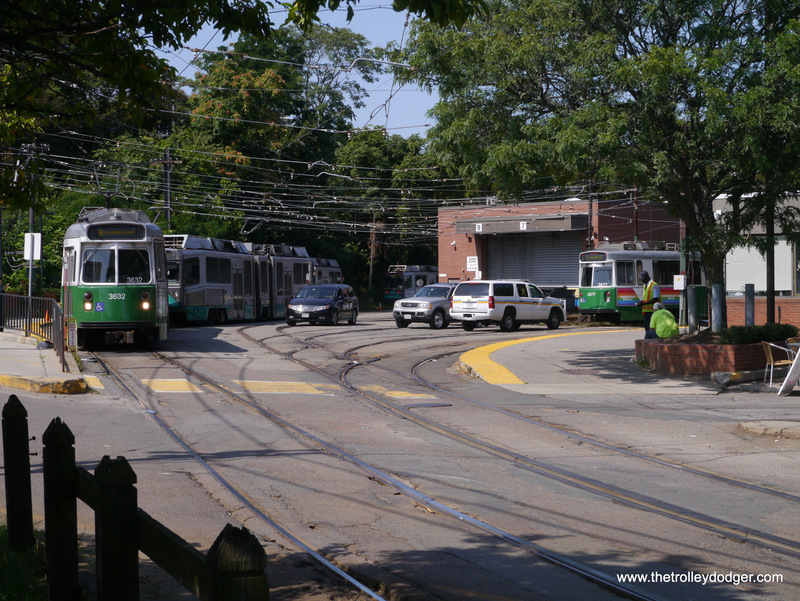 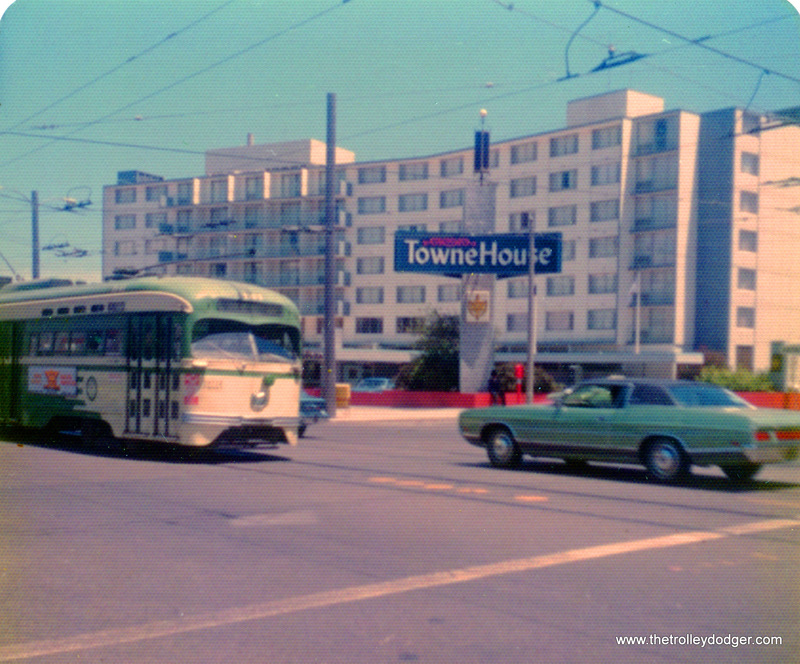 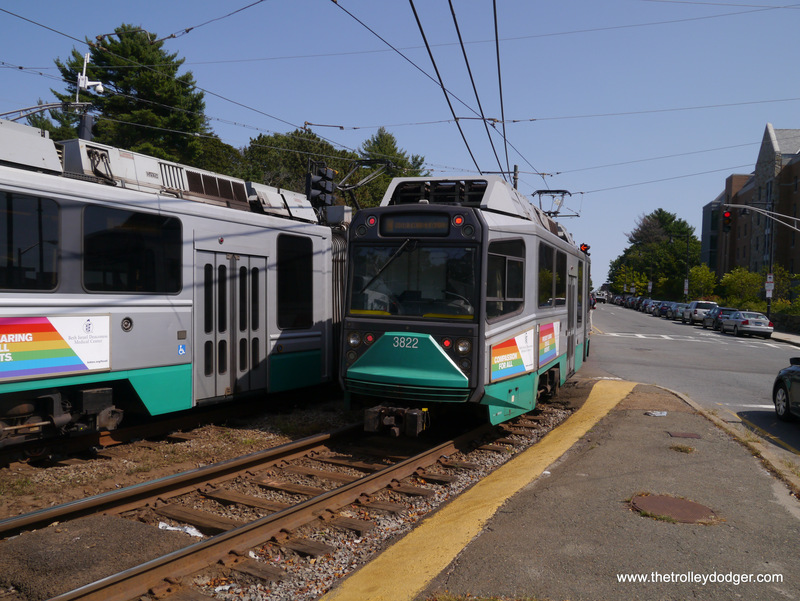 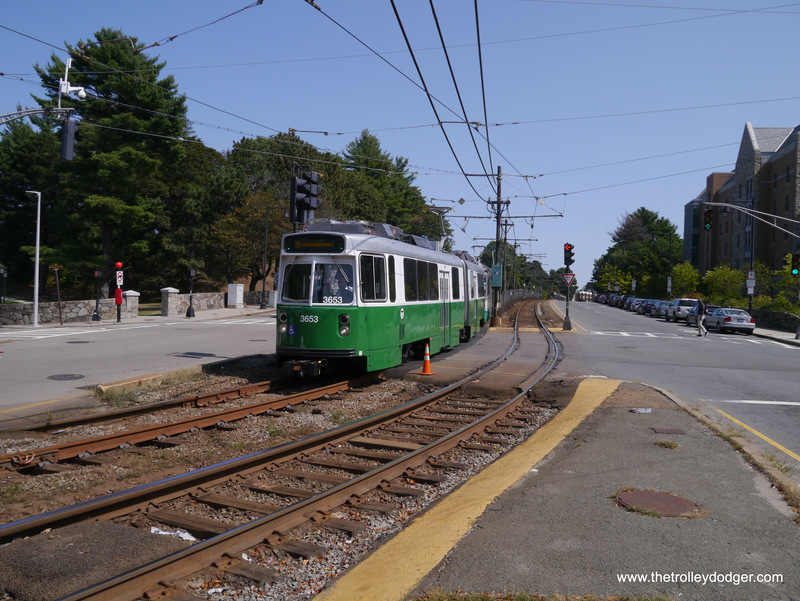 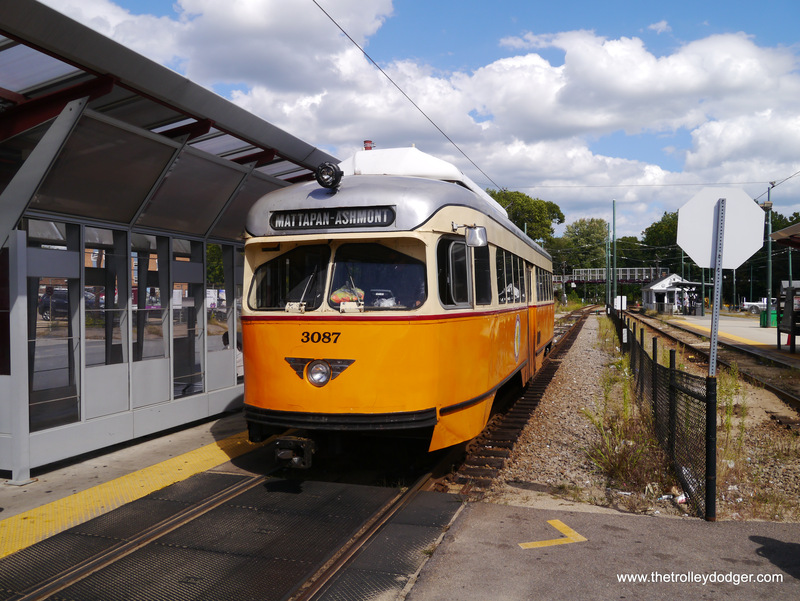 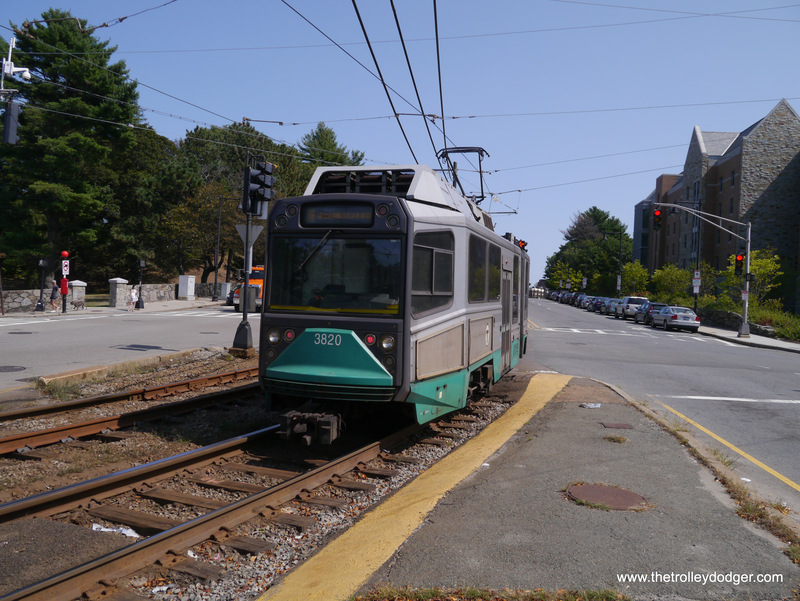 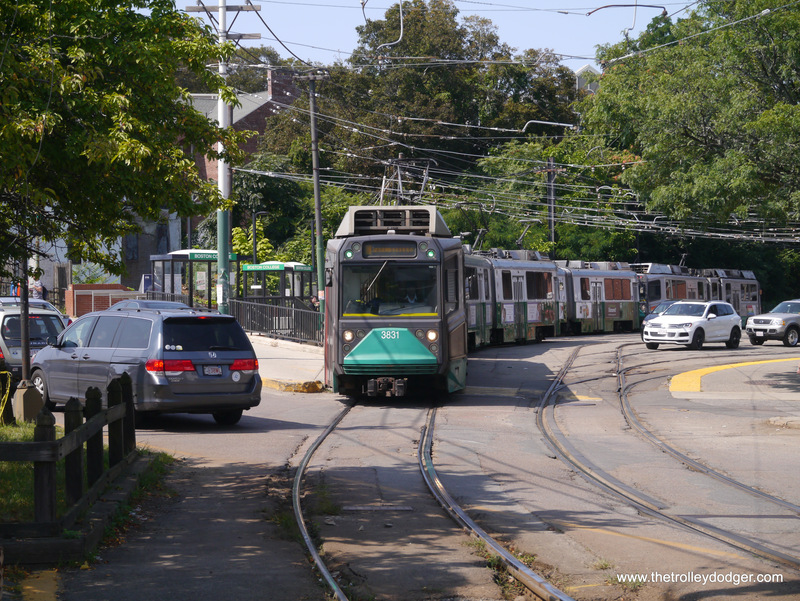 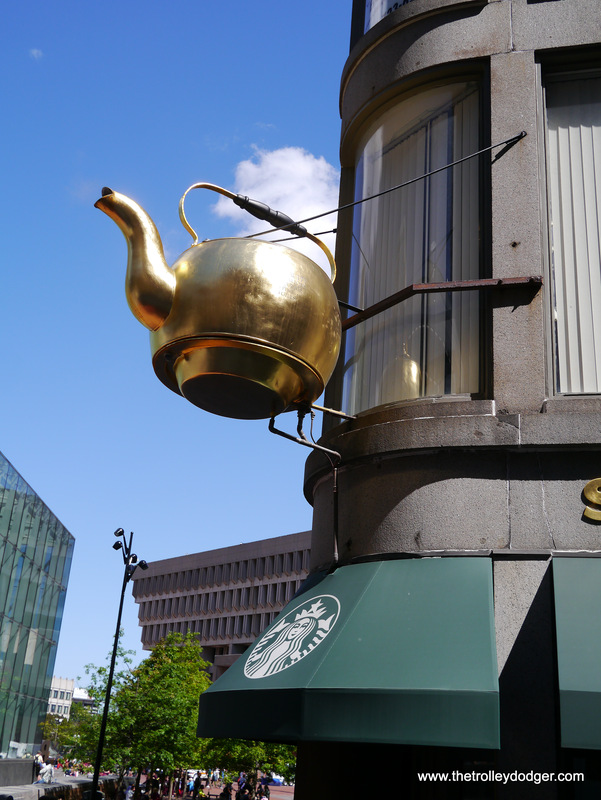 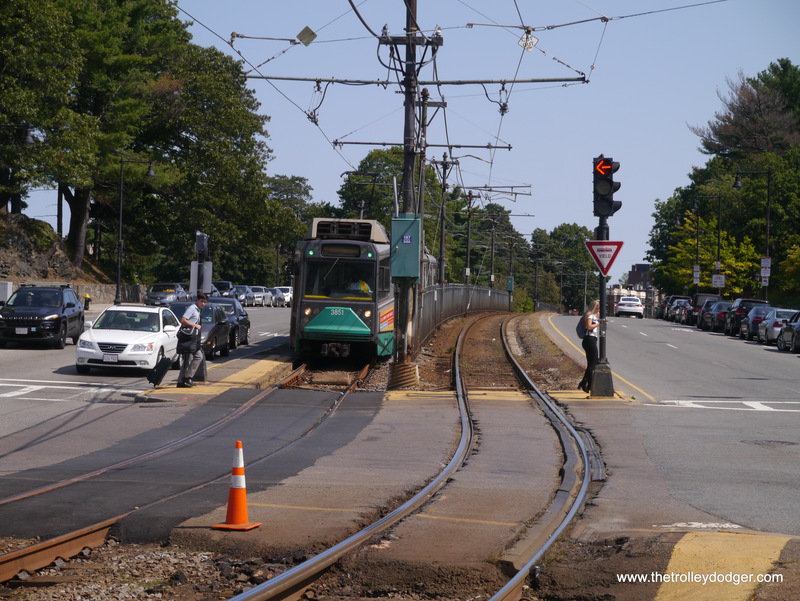 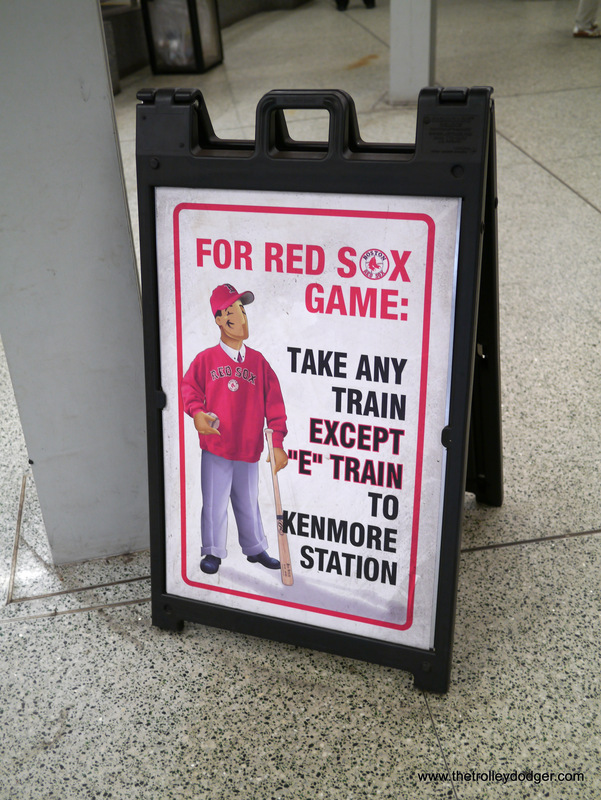 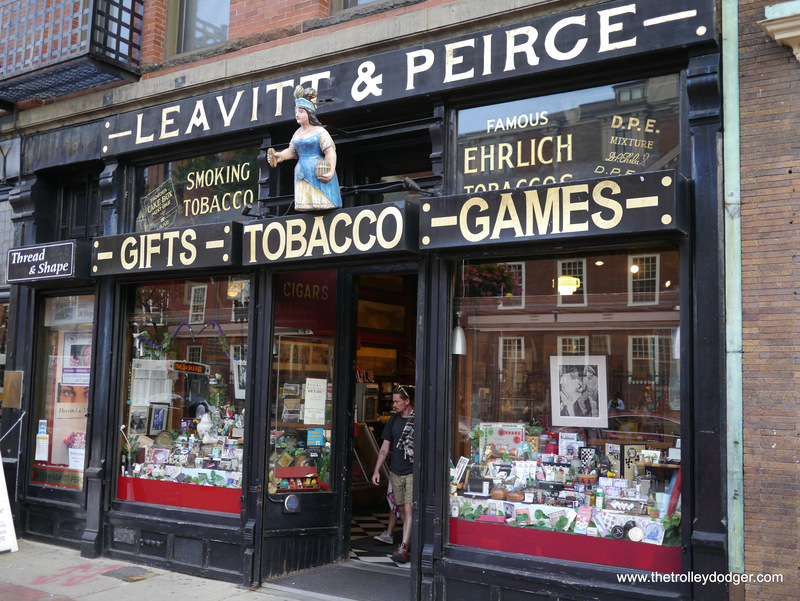 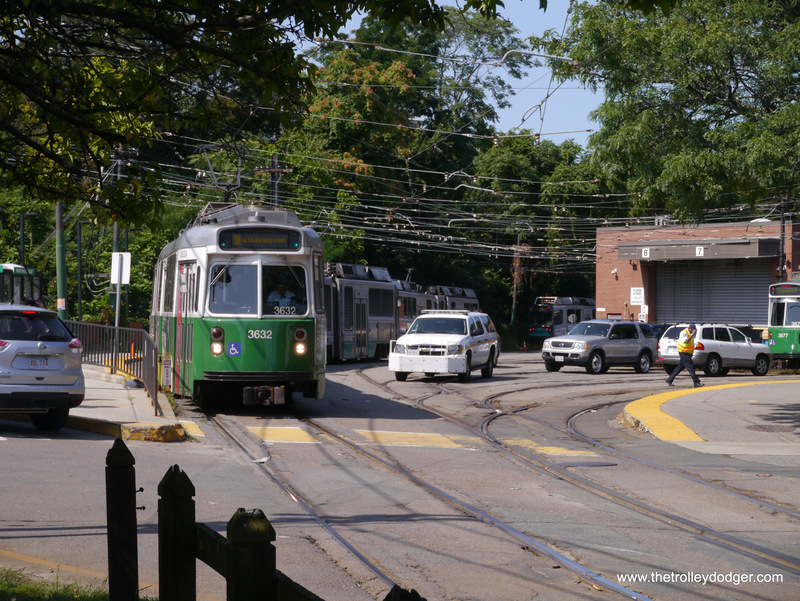 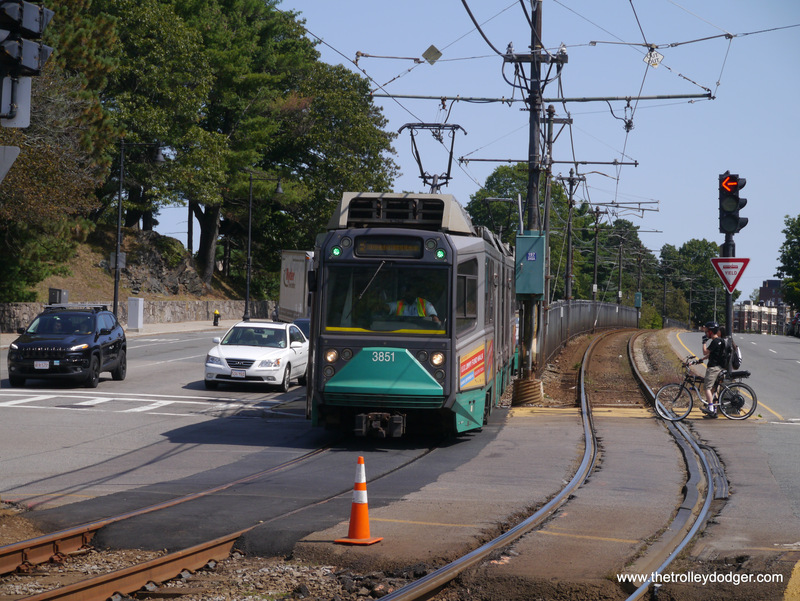 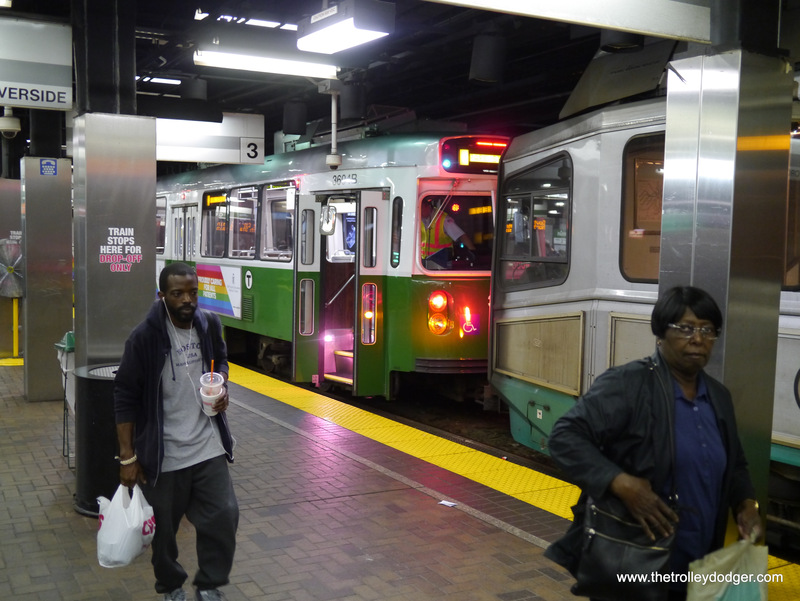 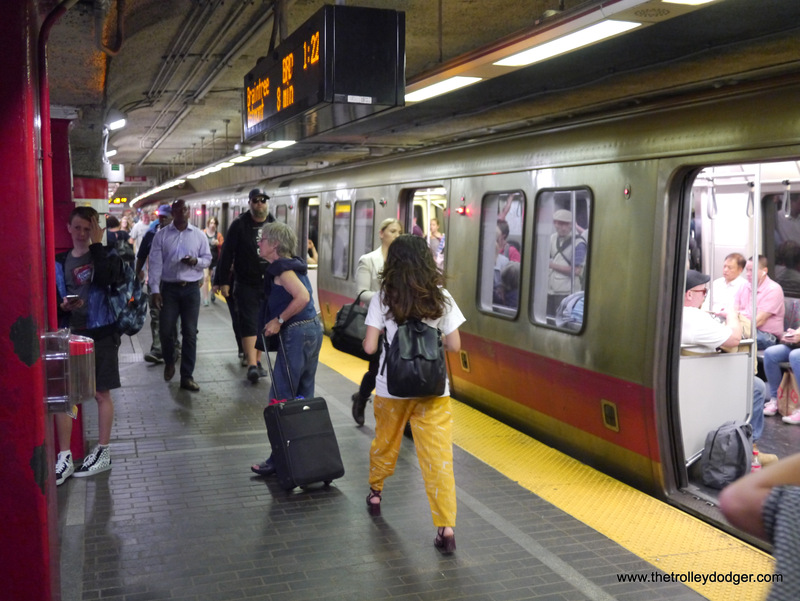 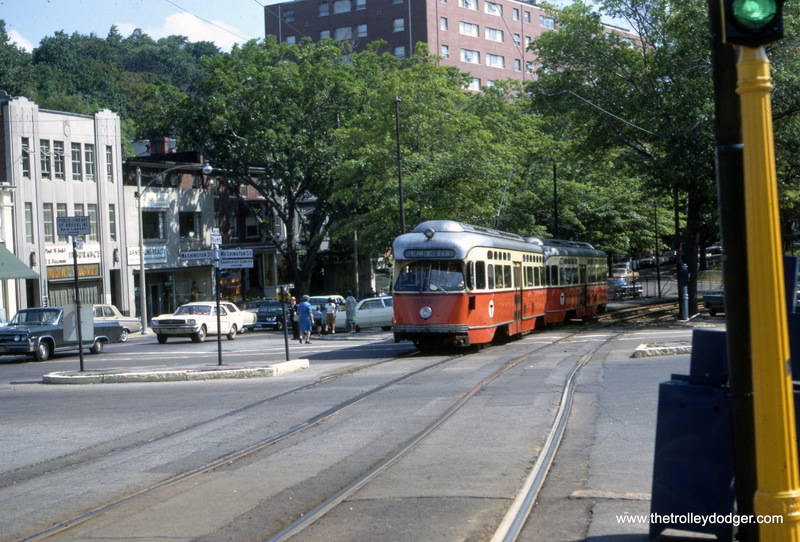 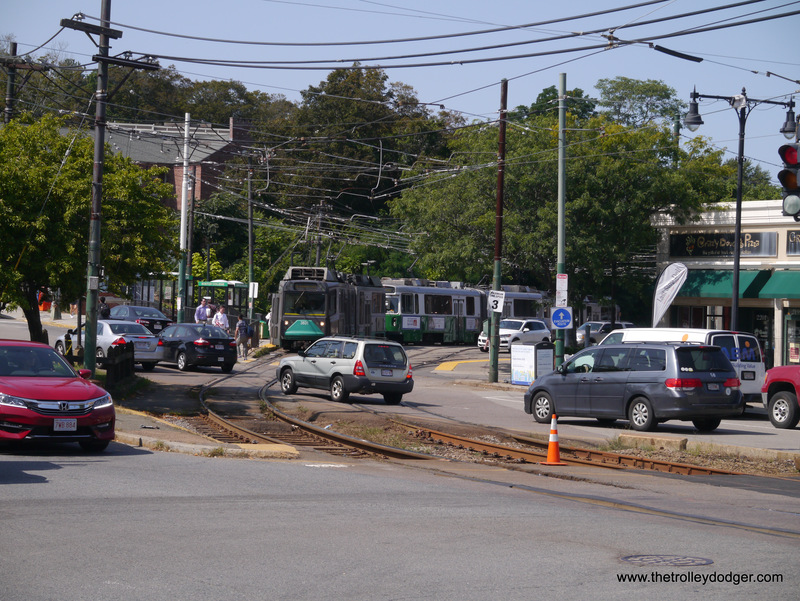 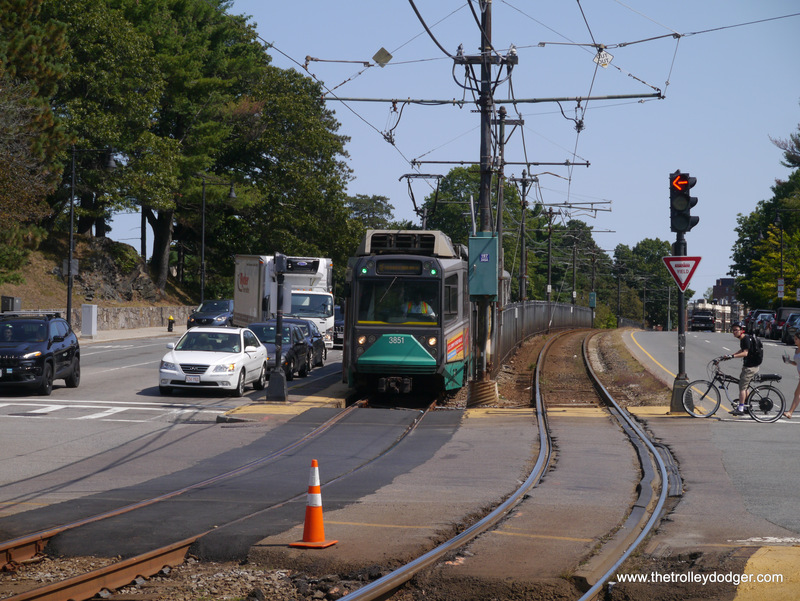 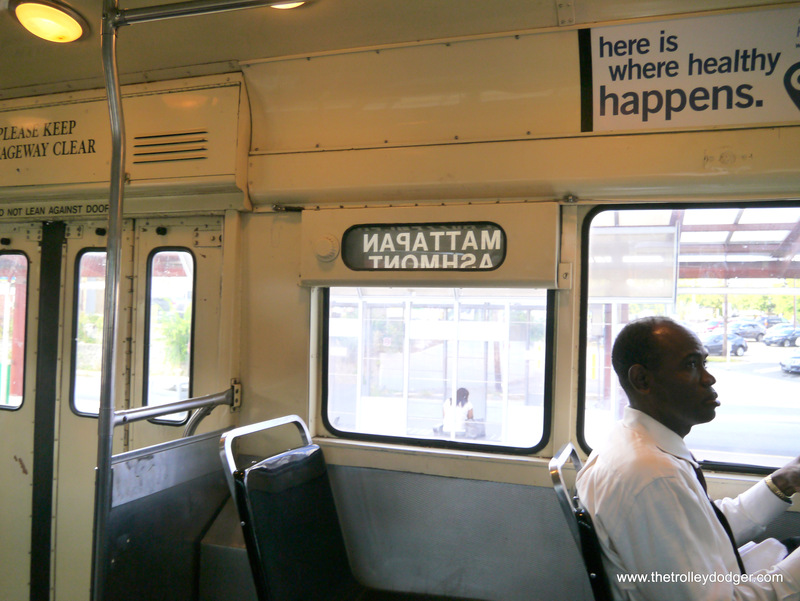 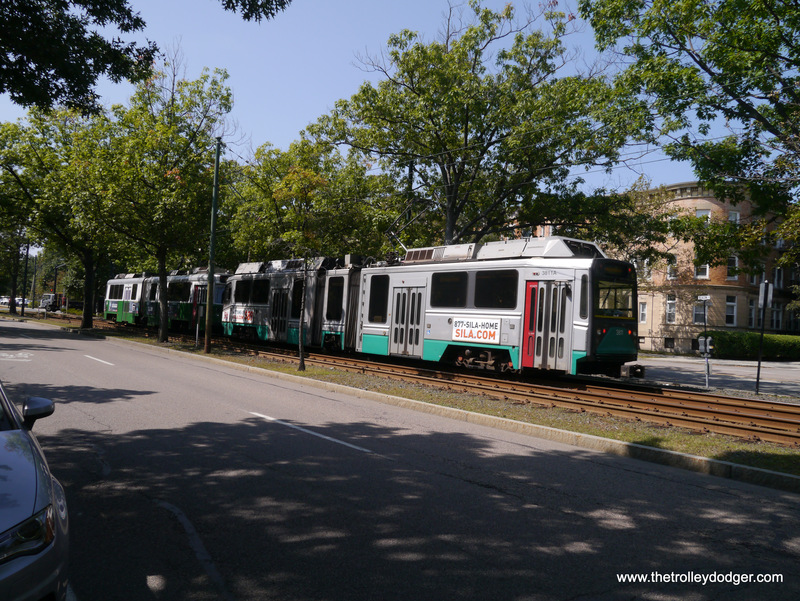 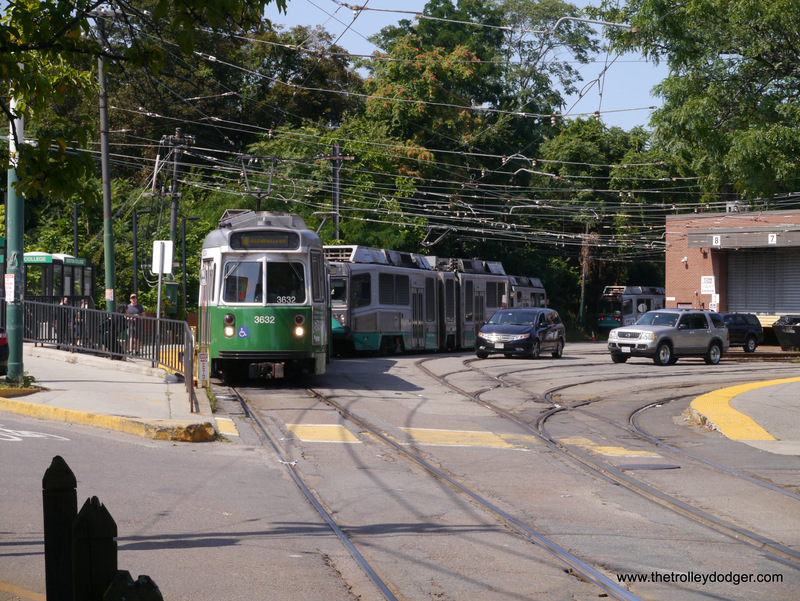 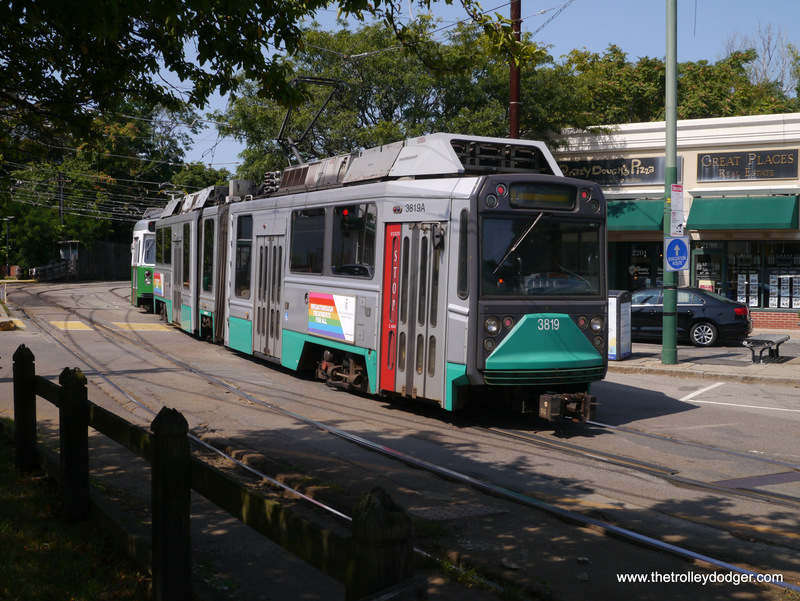 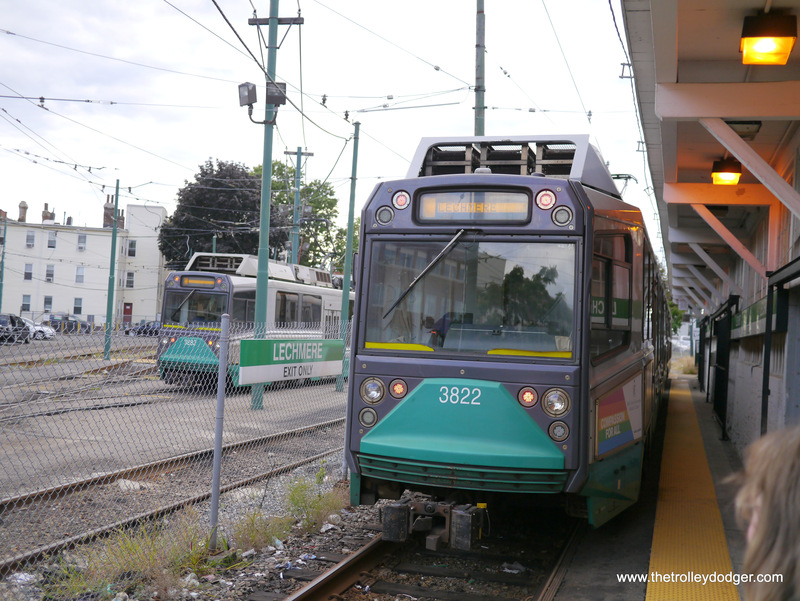 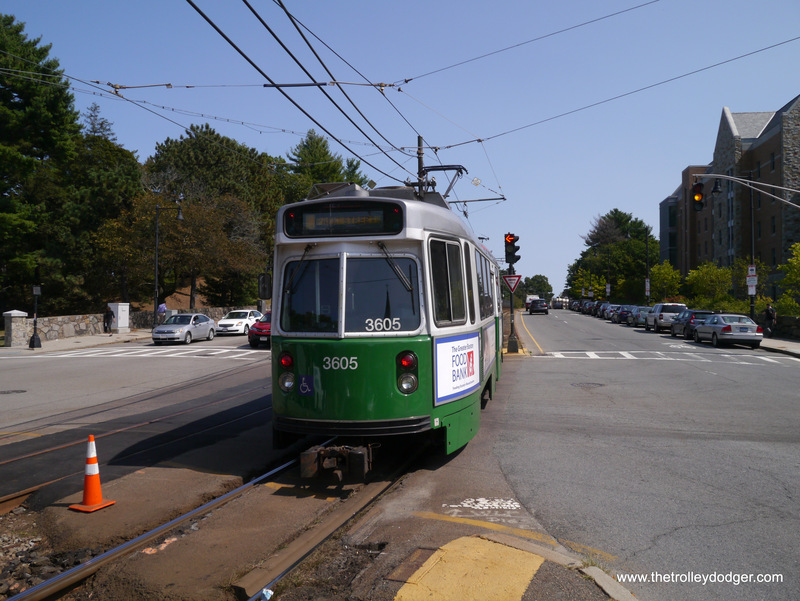 I enjoyed your latest post about Boston’s great trolleys. 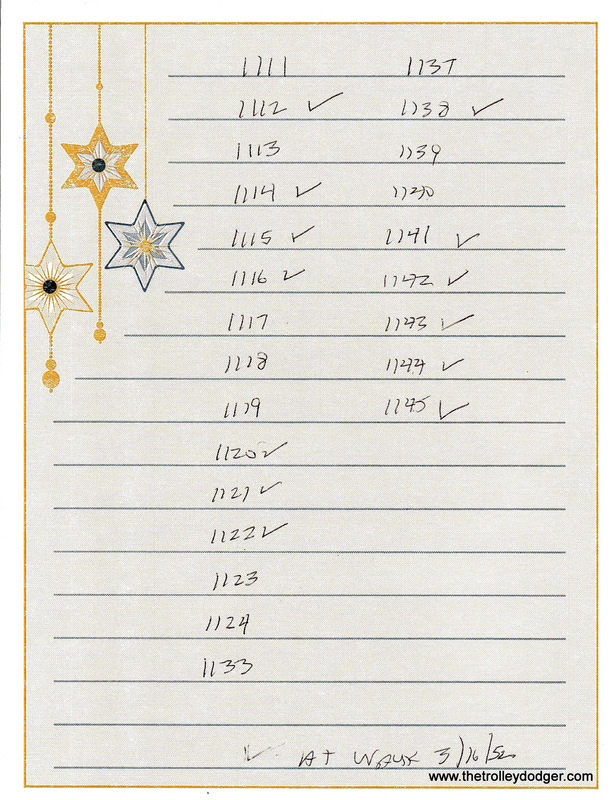 Keep up the great work. 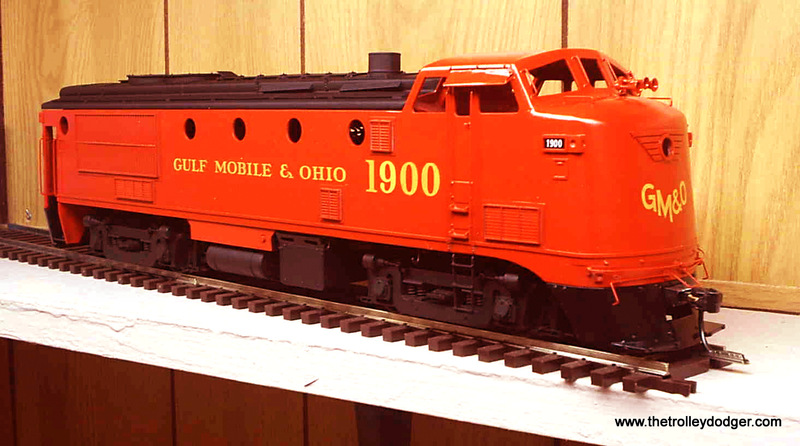 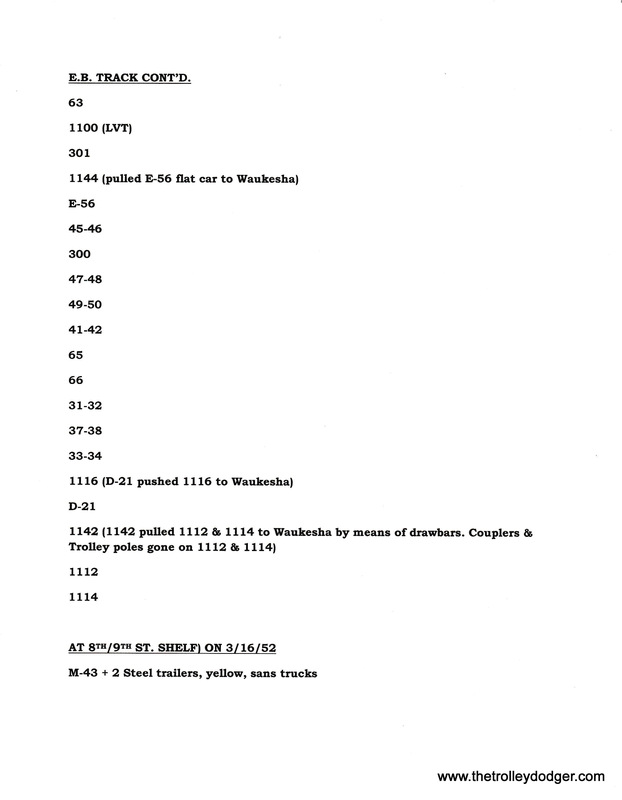 Here is the latest stuff, the CA&E and the CNS&M woodies. 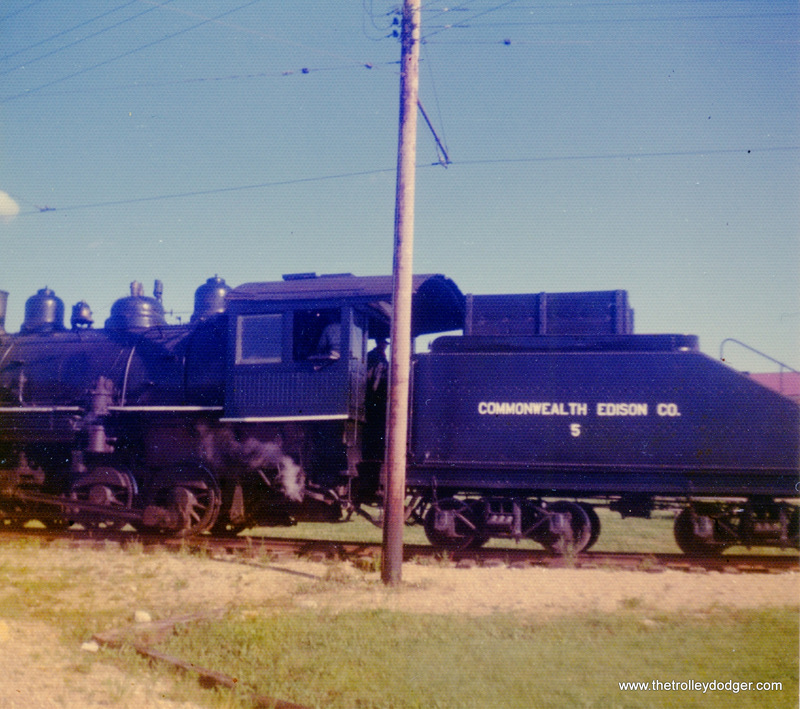 As usual, some of the images aren’t the best, but it’s all I could find in my continuing search for the best of the CA&E! 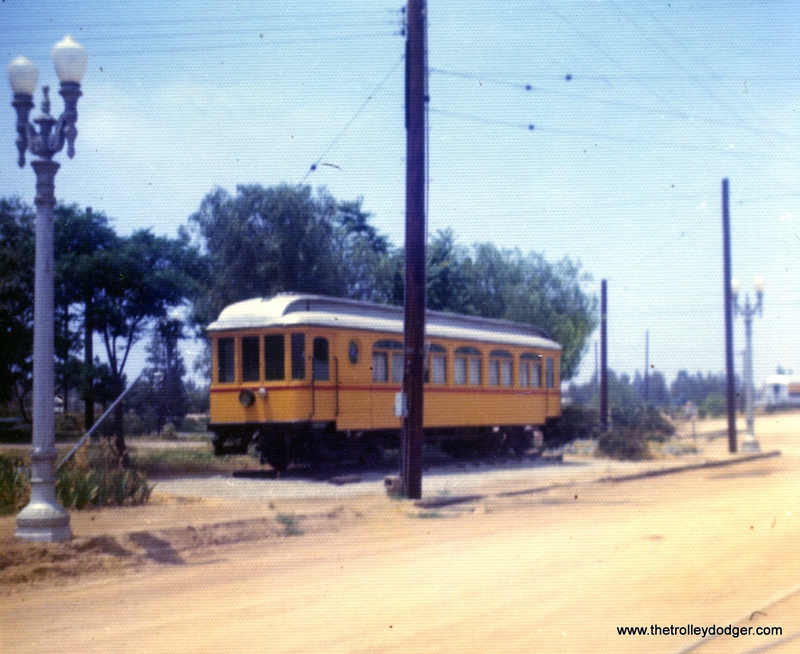 Increasing suburban traffic found the CA&E short of cars. 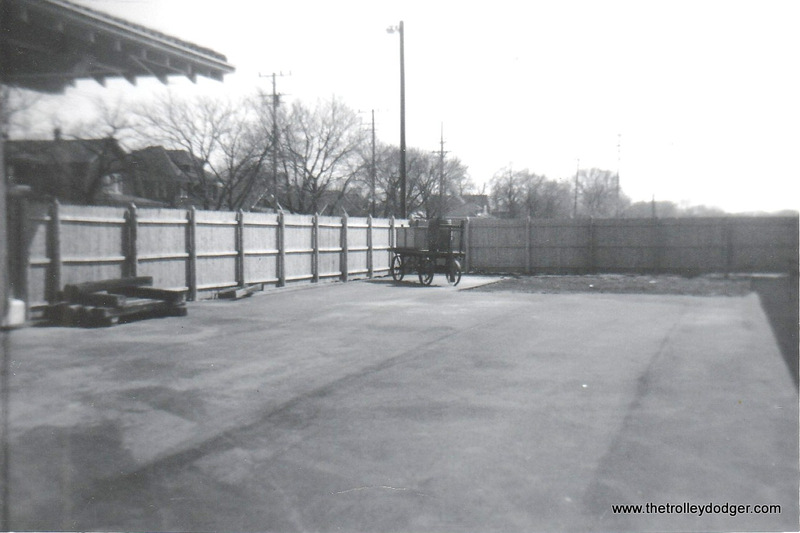 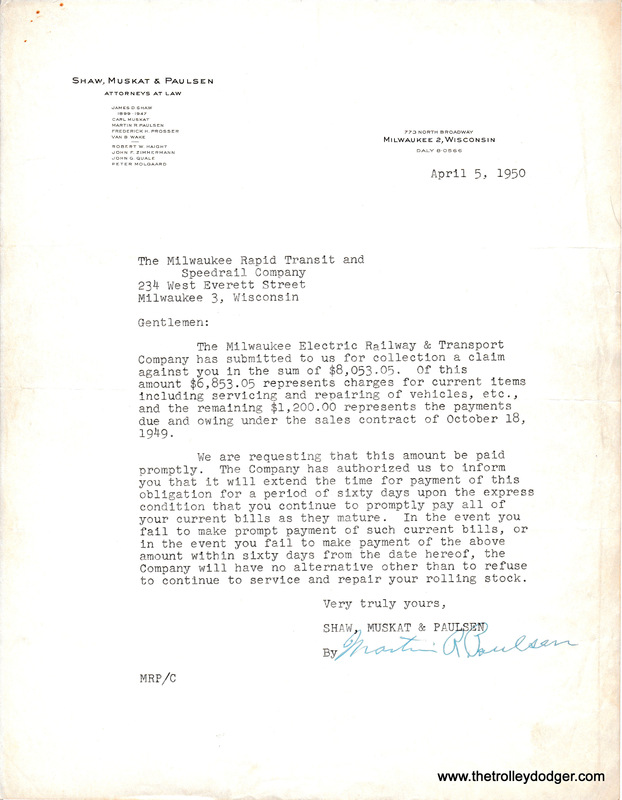 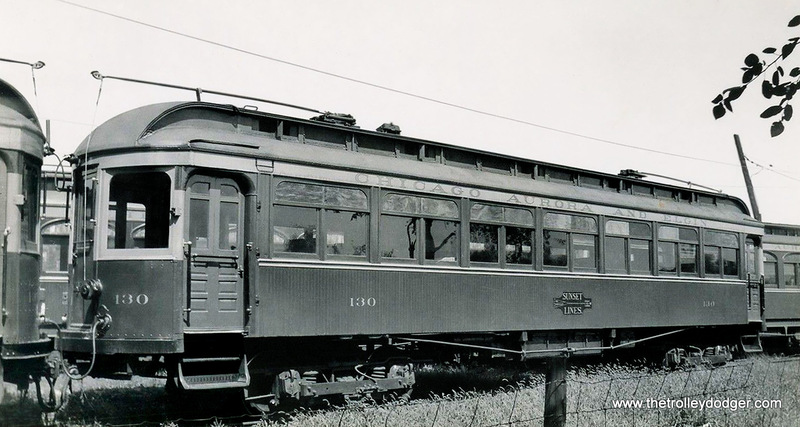 In 1936, the CNS&M came to the rescue by making some of their older wooden cars available for lease. 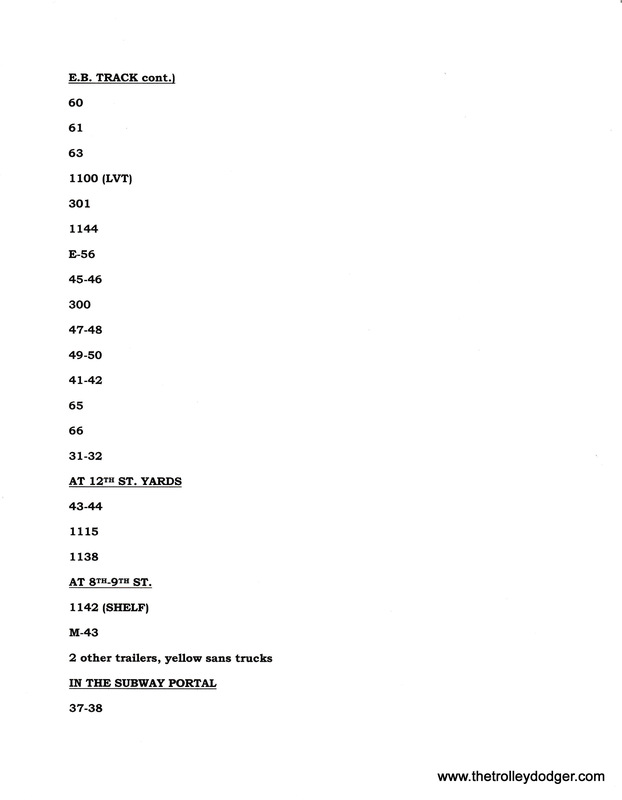 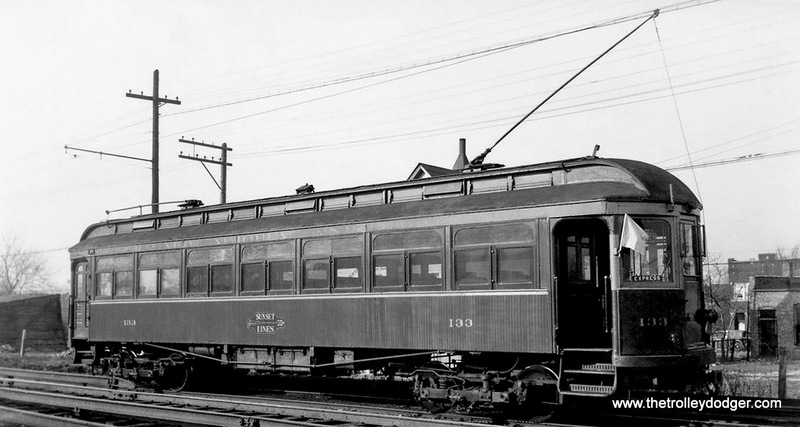 In 1936, cars 129, 130, 133, 134, 137 (Jewett 1907), cars 138, 139, 140, 141, 144 (American 1910) and cars 142 and 143 (Jewett 1907) were leased for suburban service and returned to the CNS&M after World War II. 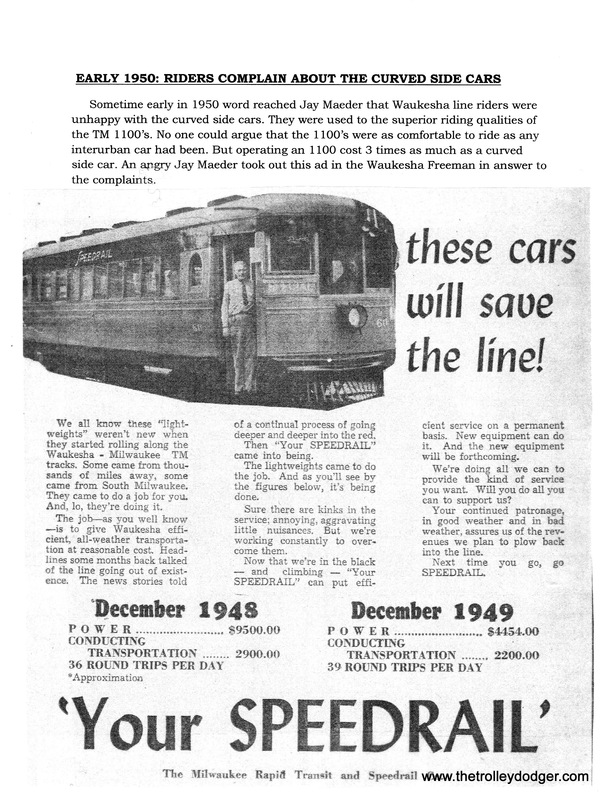 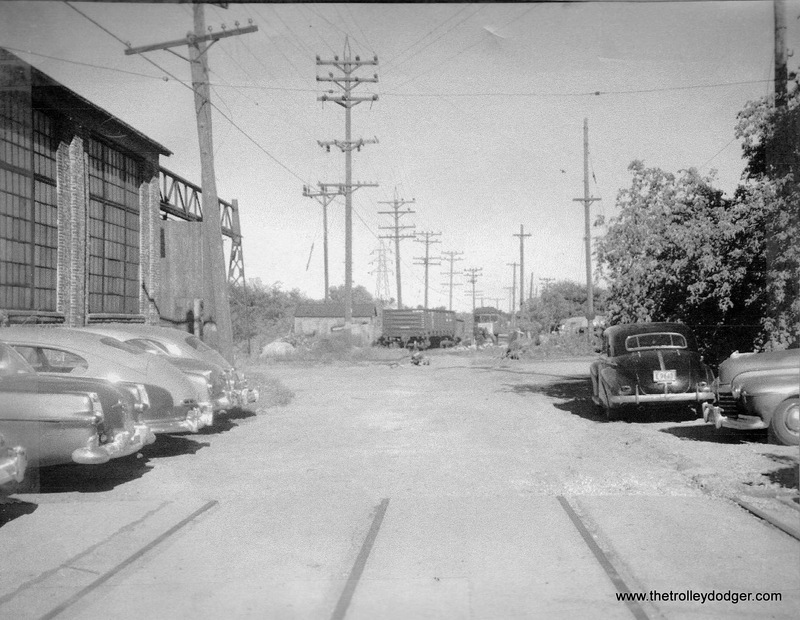 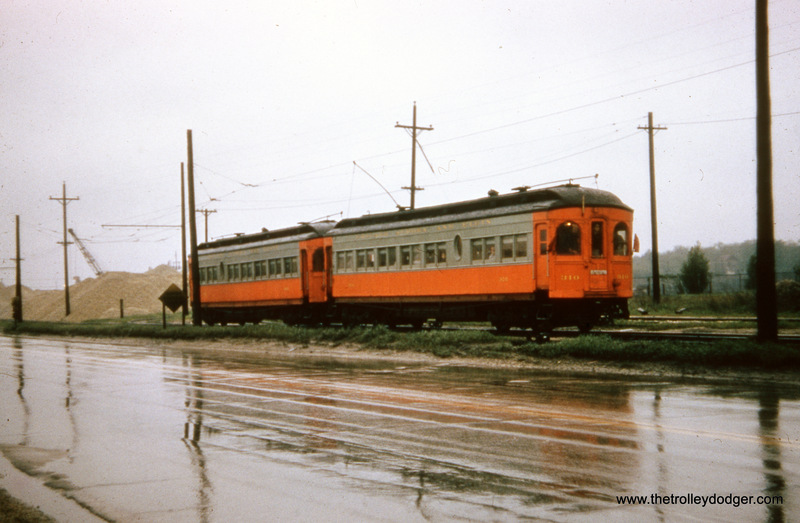 These cars were later purchased in 1946 and finished their long careers in suburban work on the CA&E. 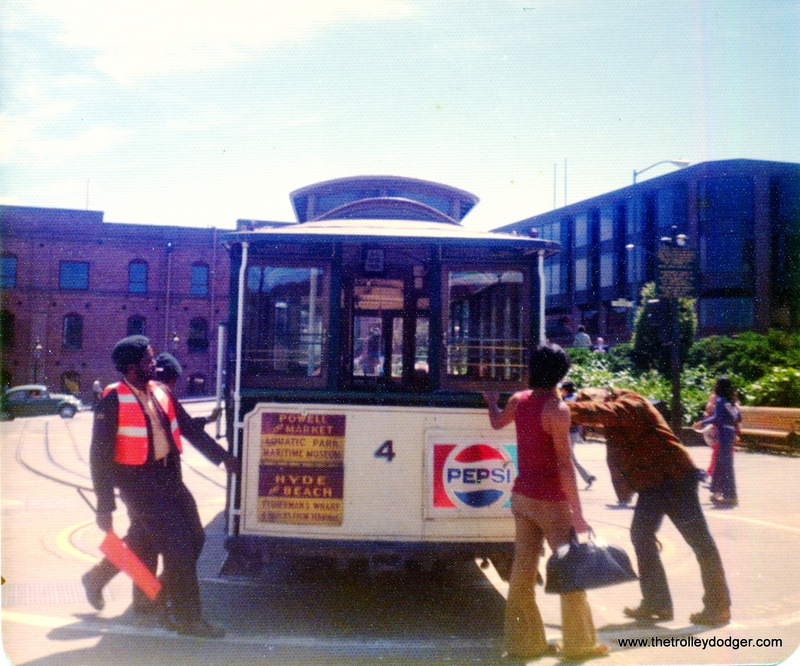 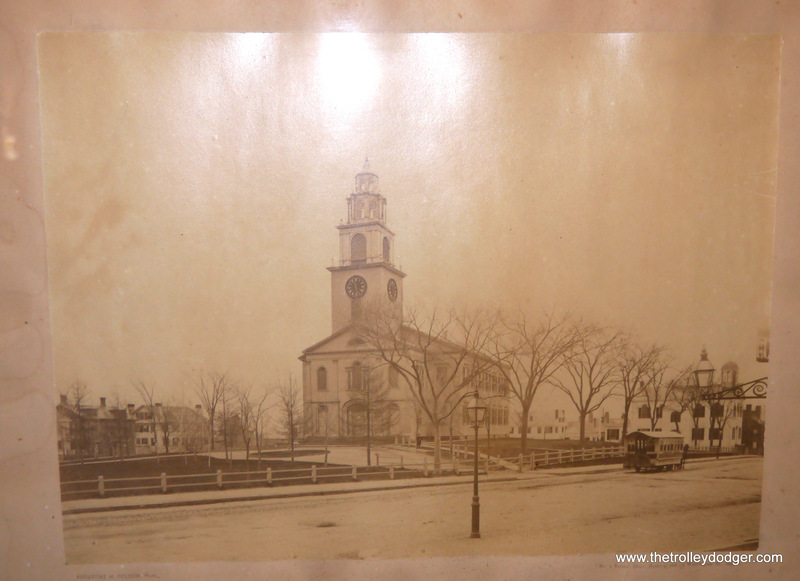 I know our readers appreciate your efforts in restoring and sharing these rare pictures with us. 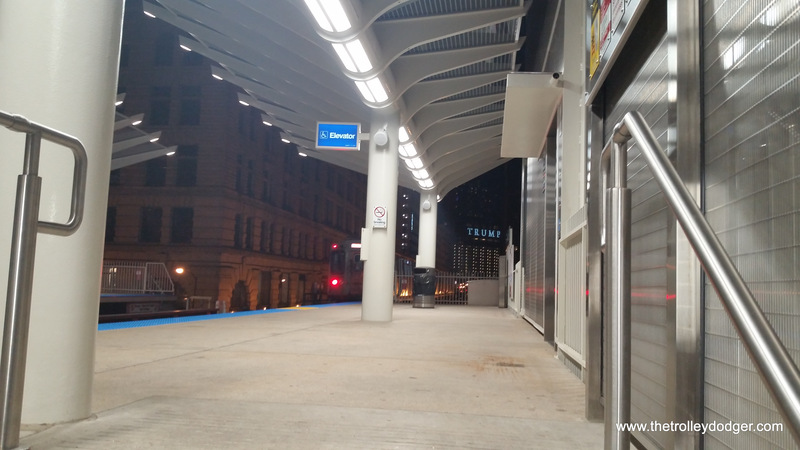 Thanks to you, they are looking better than ever. 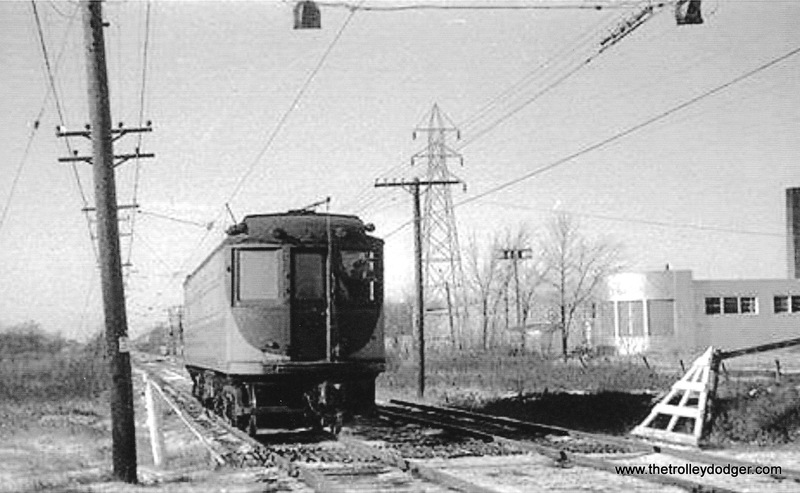 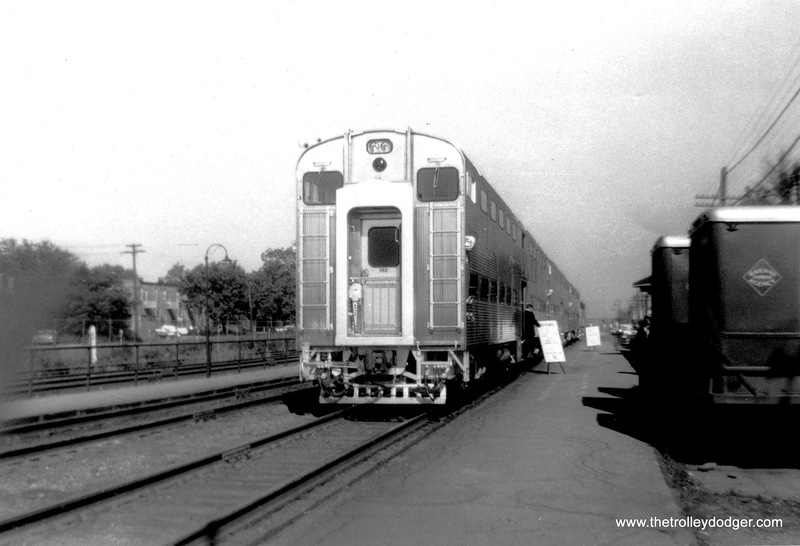 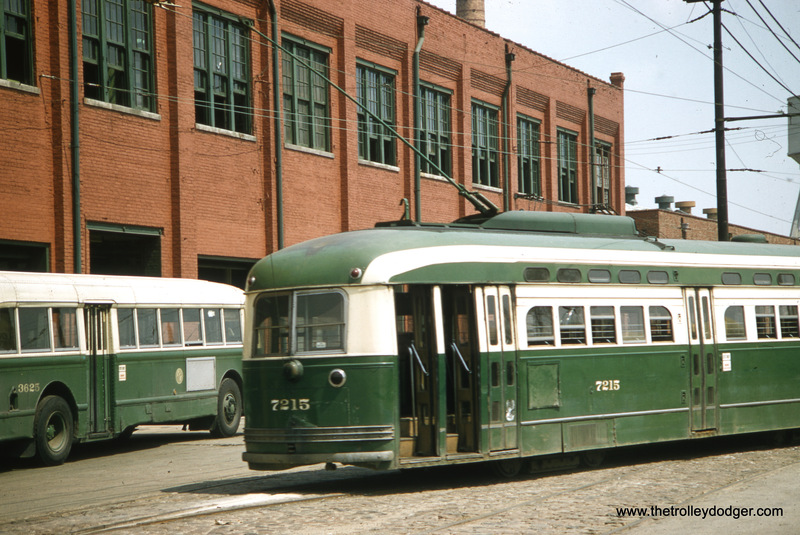 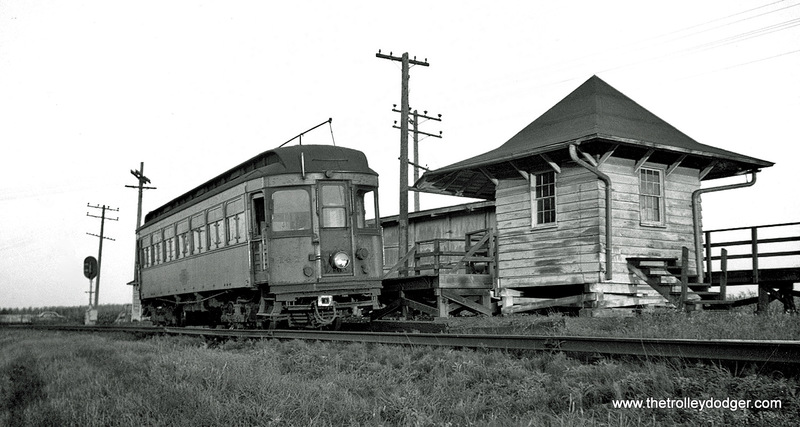 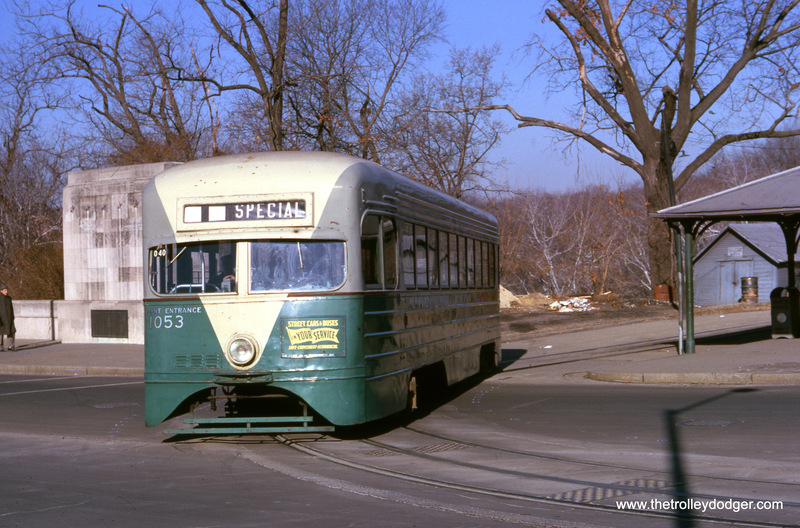 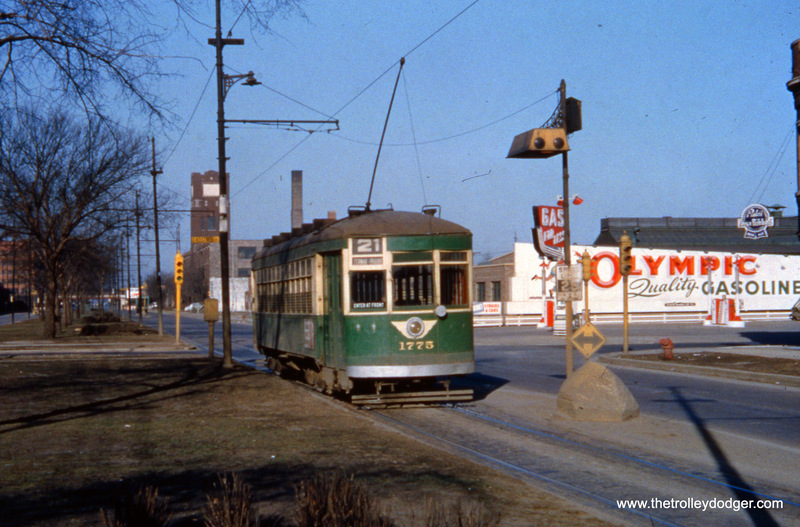 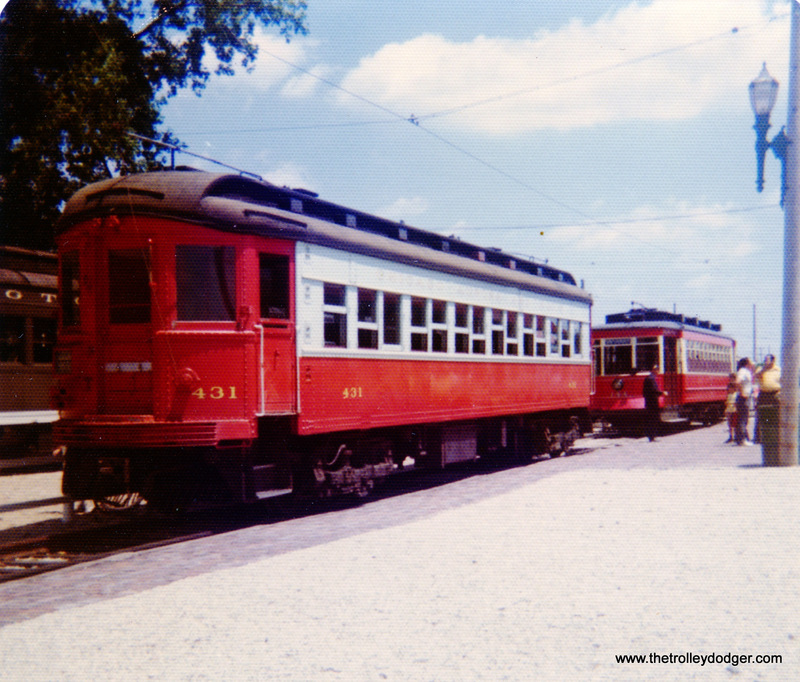 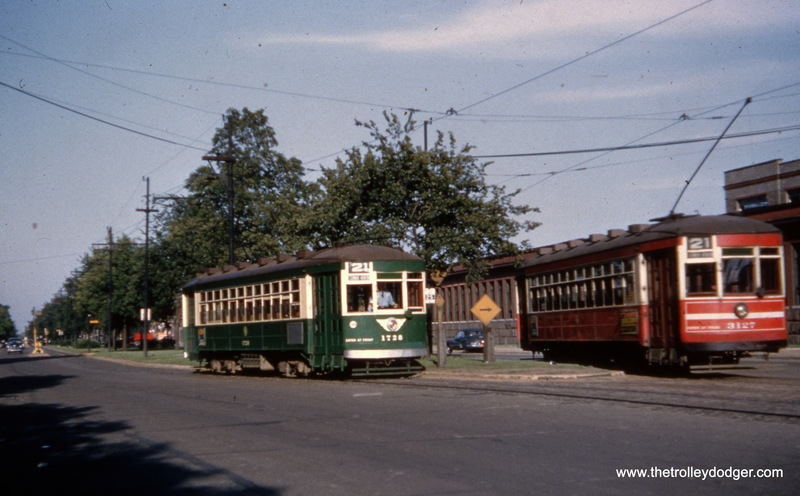 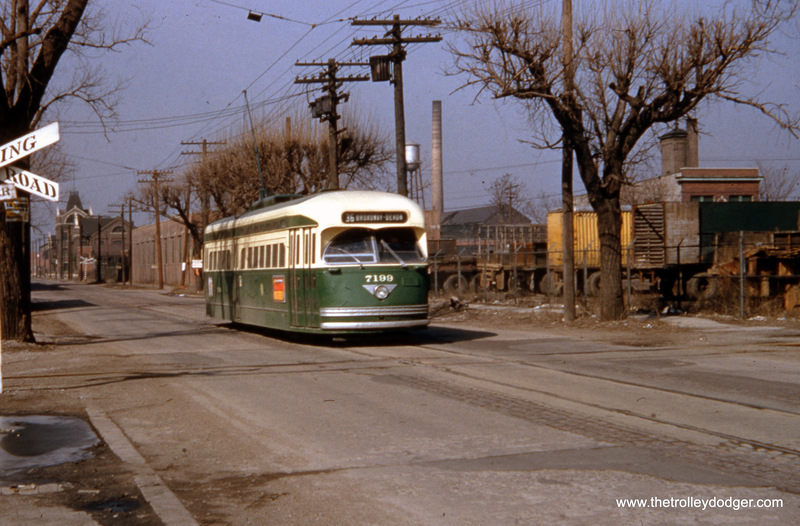 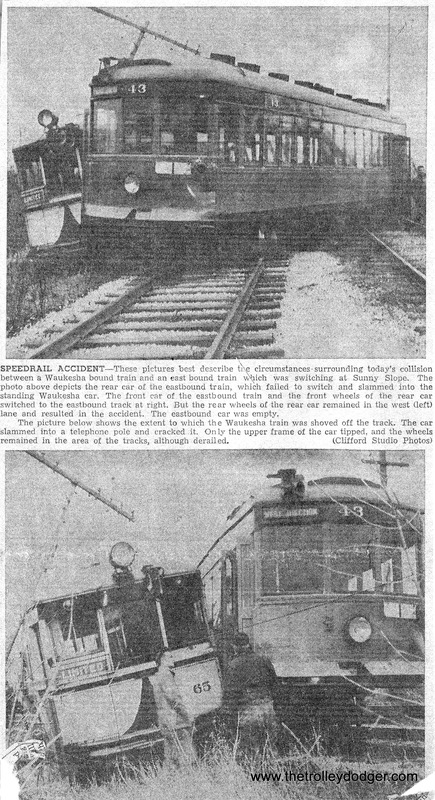 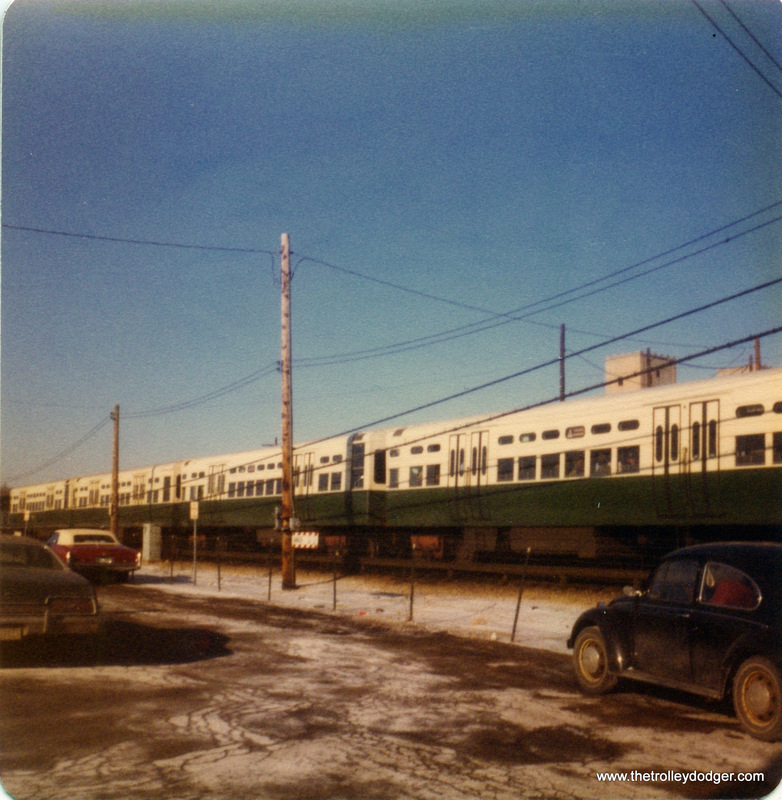 After CA&E service was cut back to Forest Park in 1953, these cars were no longer needed and were soon scrapped. 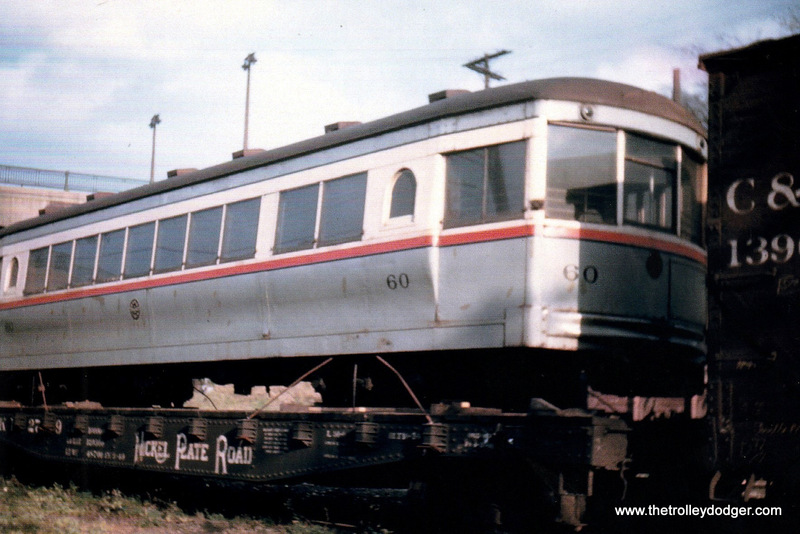 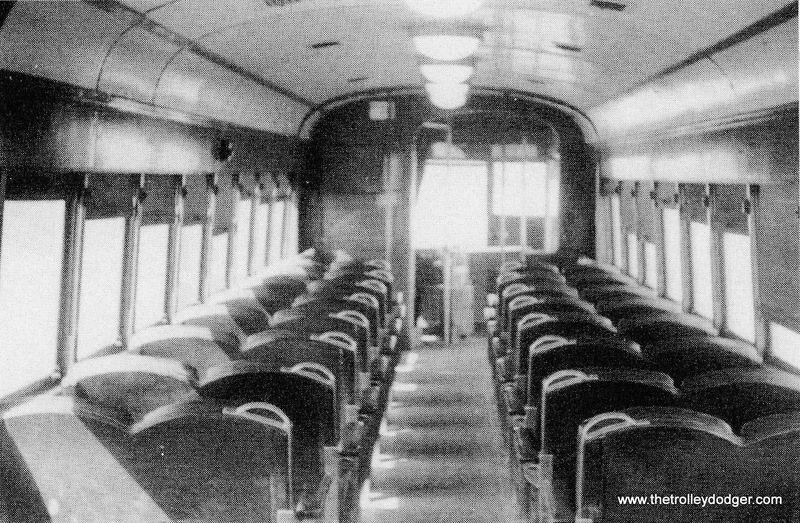 Interestingly, these old woods were the last passenger cars bought by the Aurora & Elgin. 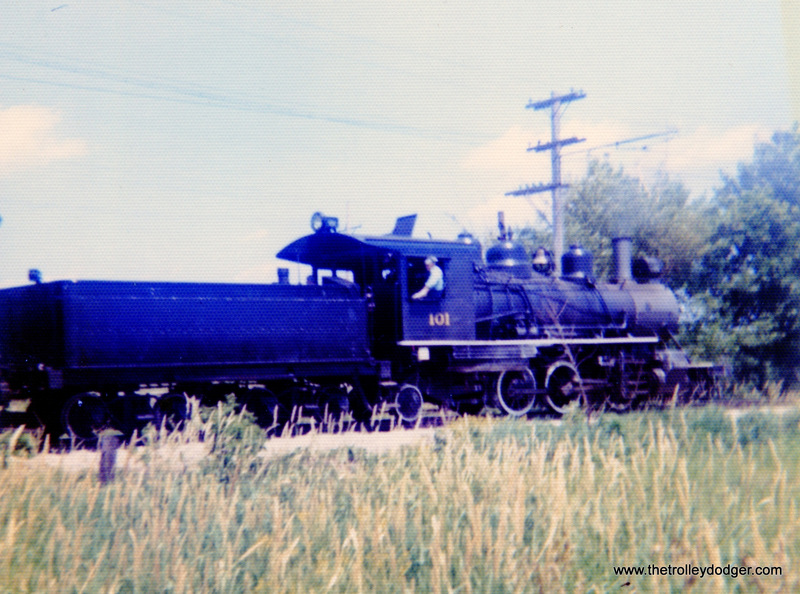 CA&E 141 at Batavia Junction. 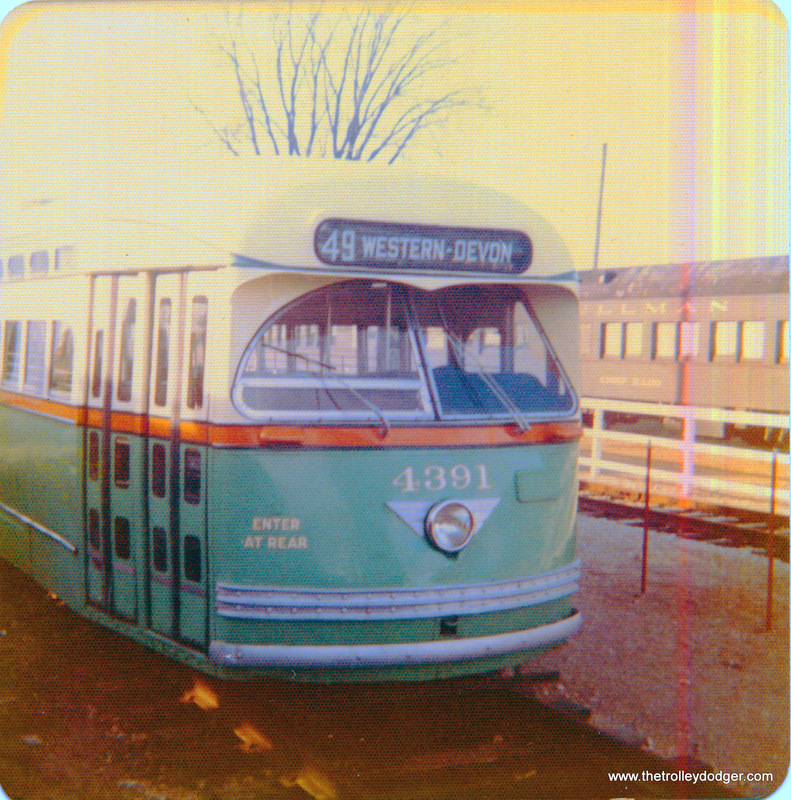 CA&E 142 at the Wheaton Shops. 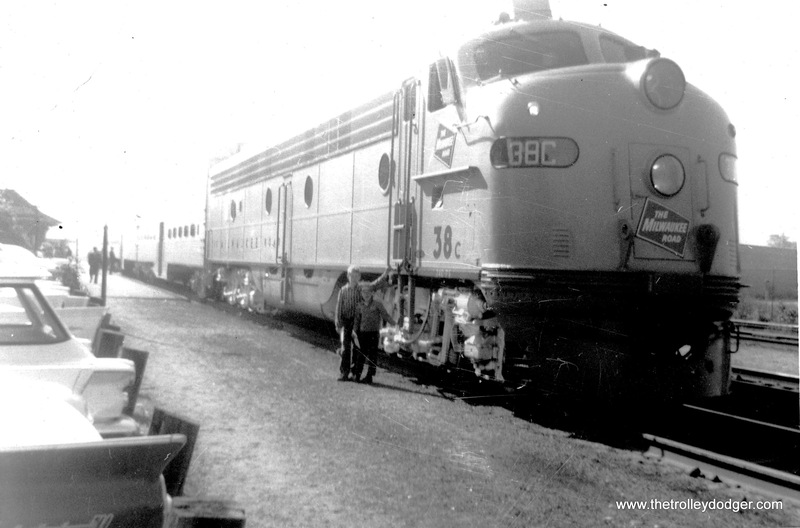 This is our 195th post, and we are gradually creating a body of work and an online resource for the benefit of all railfans, everywhere. 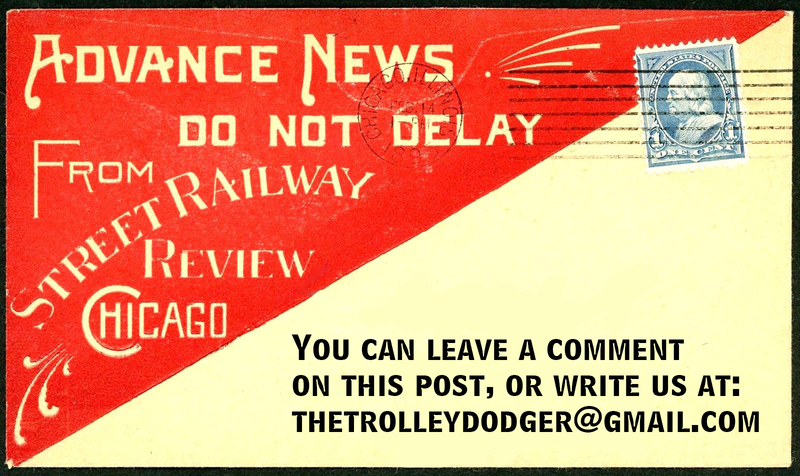 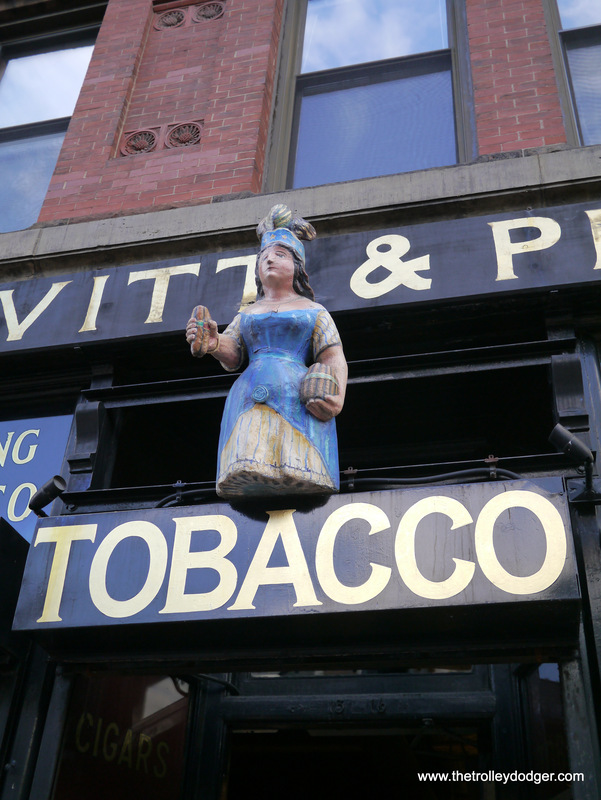 To date, we have received over 322,000 page views, for which we are very grateful.